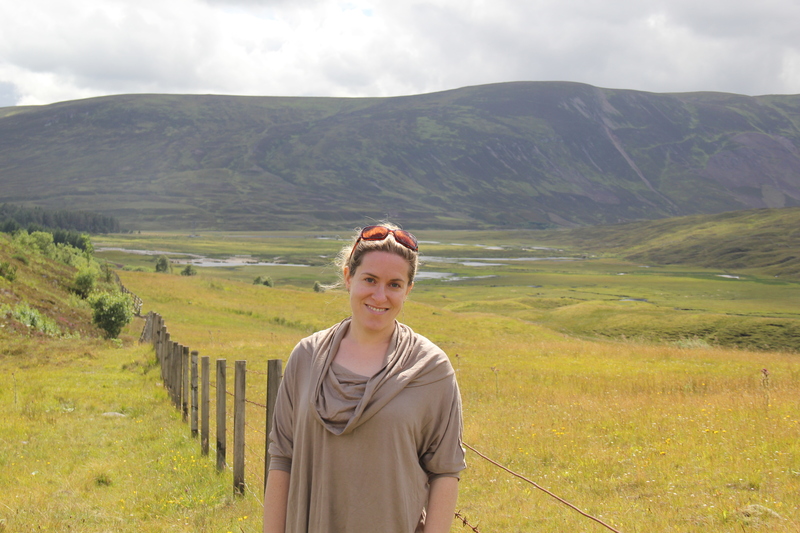 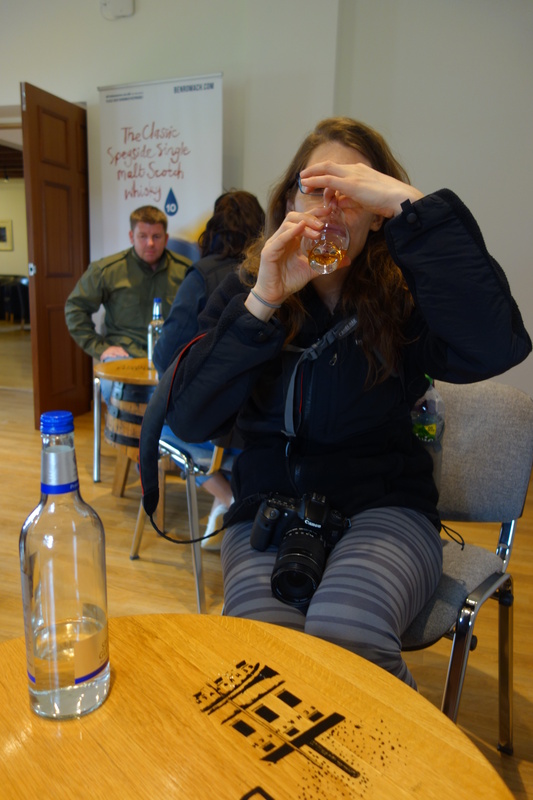 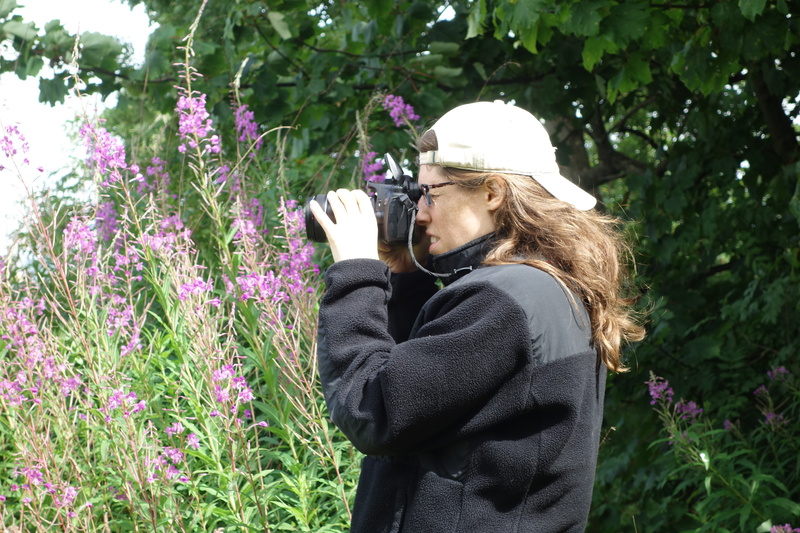 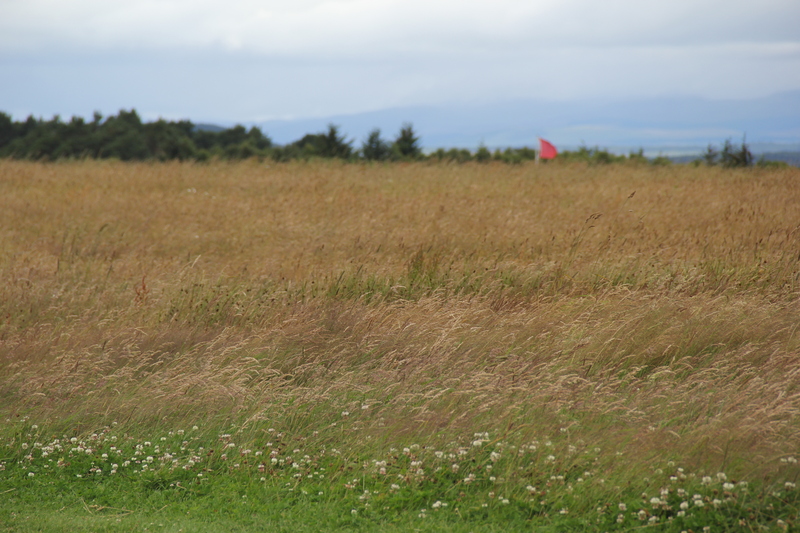 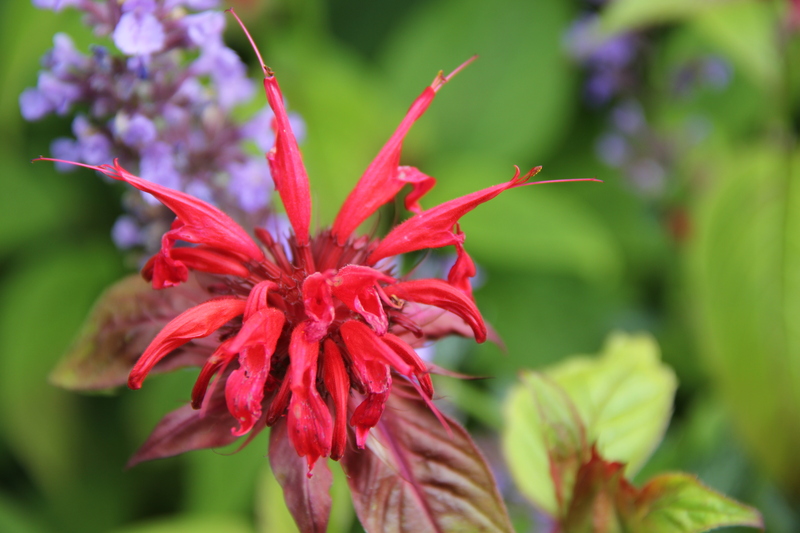 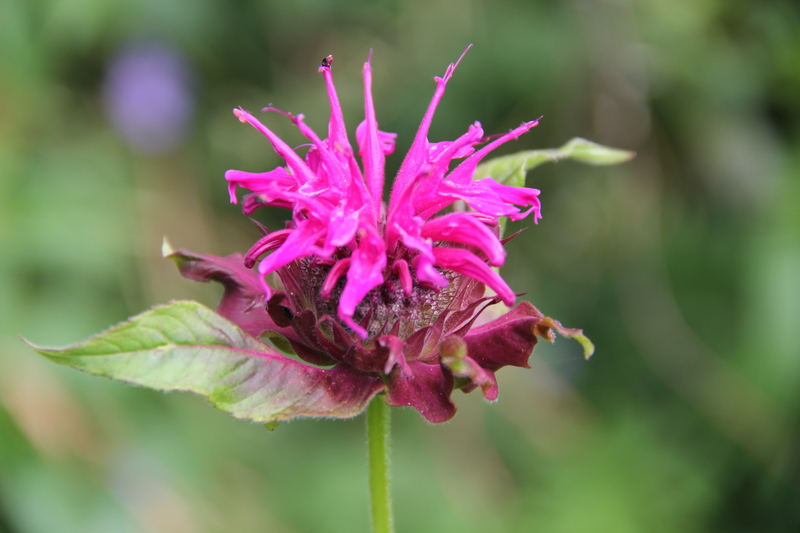 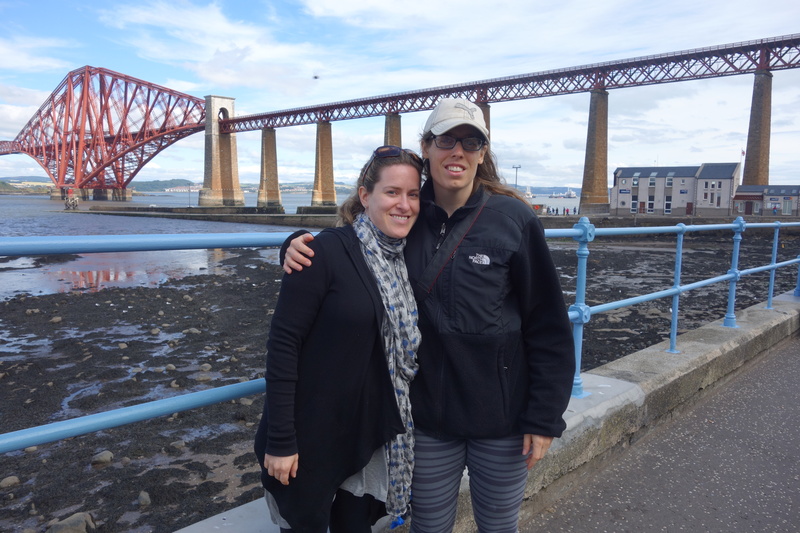 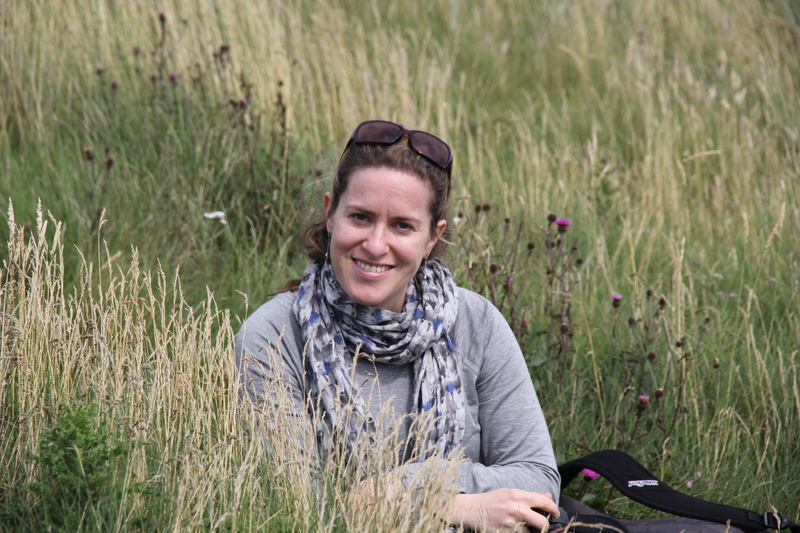 Lisa strongly felt we should check out at least one of Scotland’s many whisky distilleries. 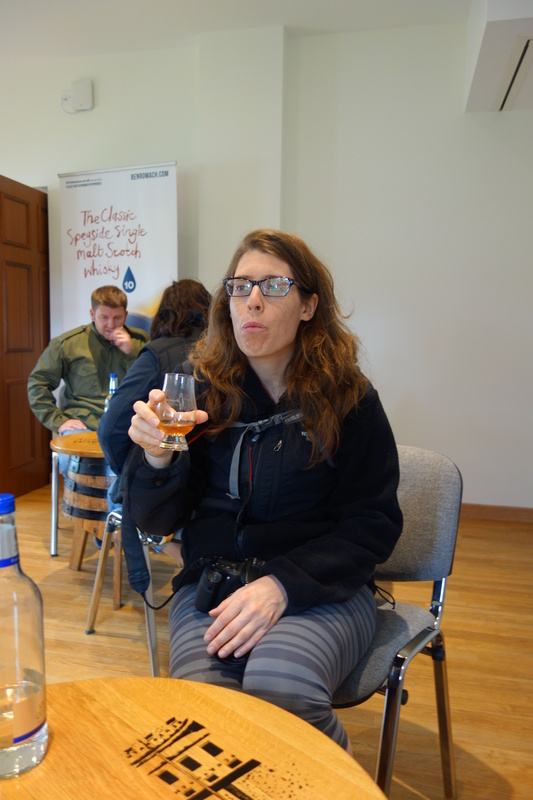 We picked the Benromach distillery mostly because it was on our way north to Inverness (and because Lisa really likes their website design). 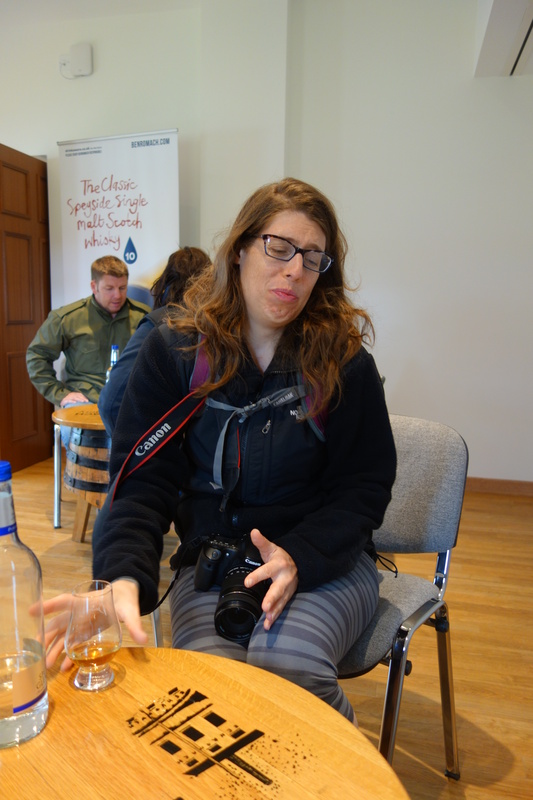 I did not have high hopes for my inaugural whisky tasting. 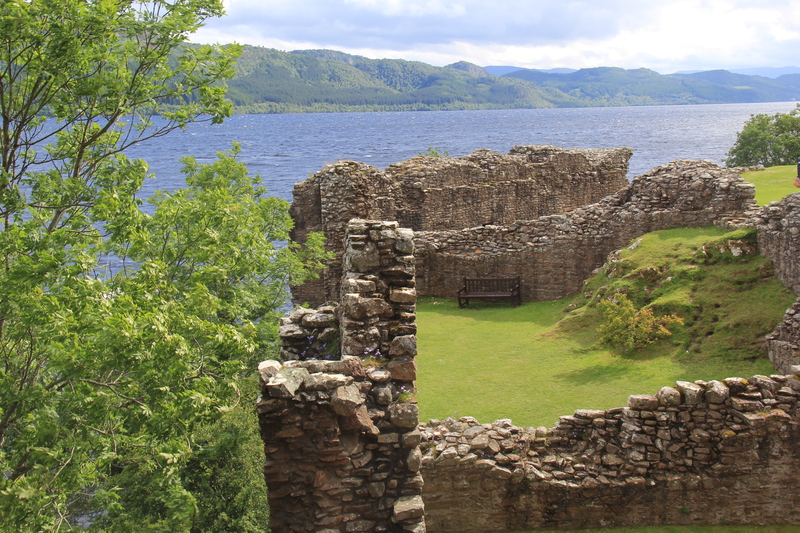 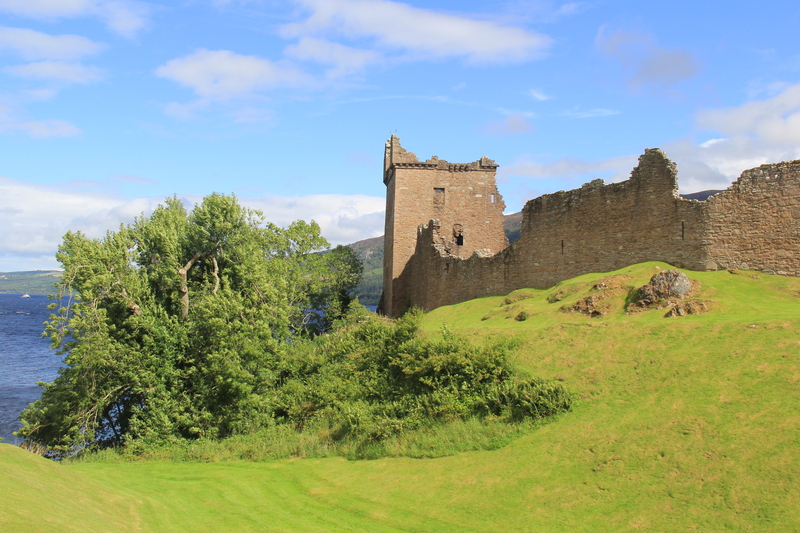 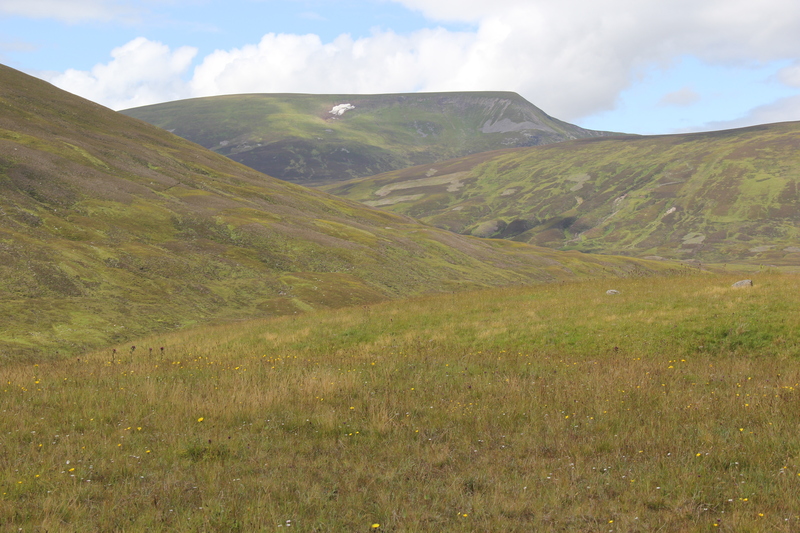 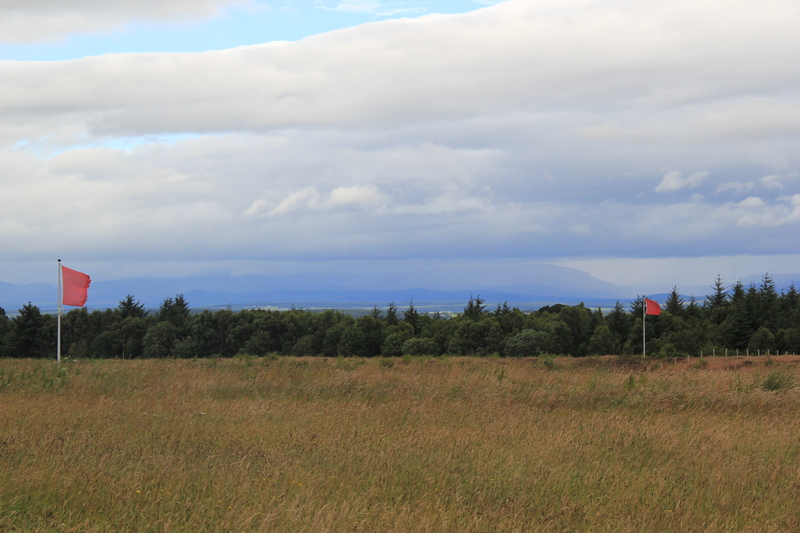 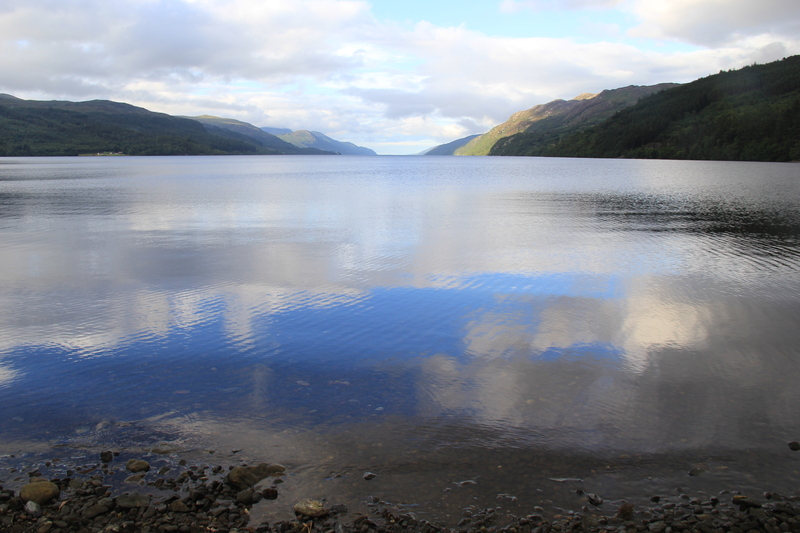 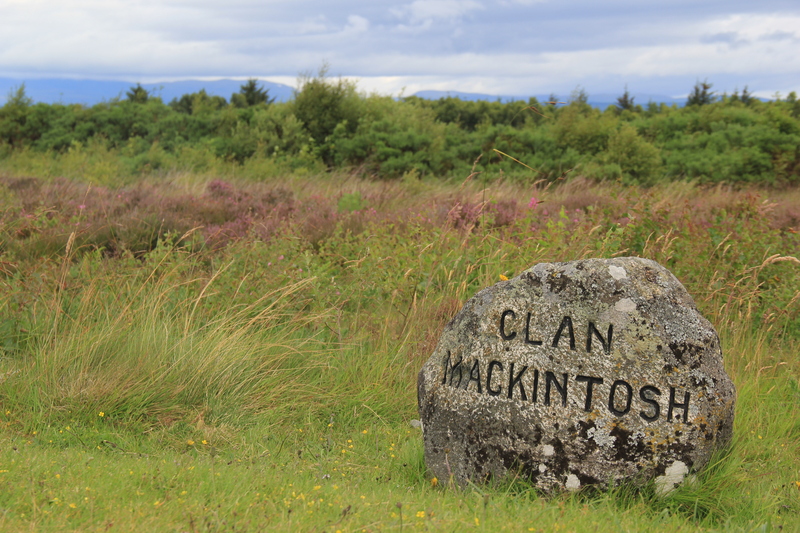 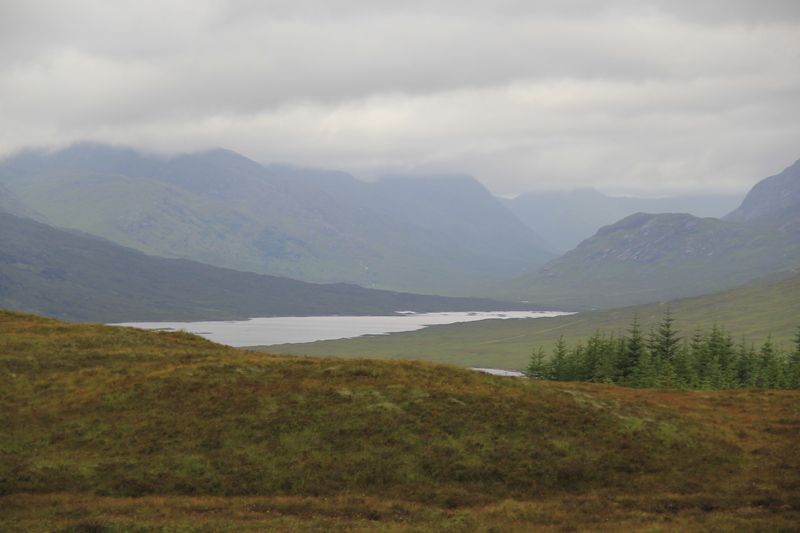 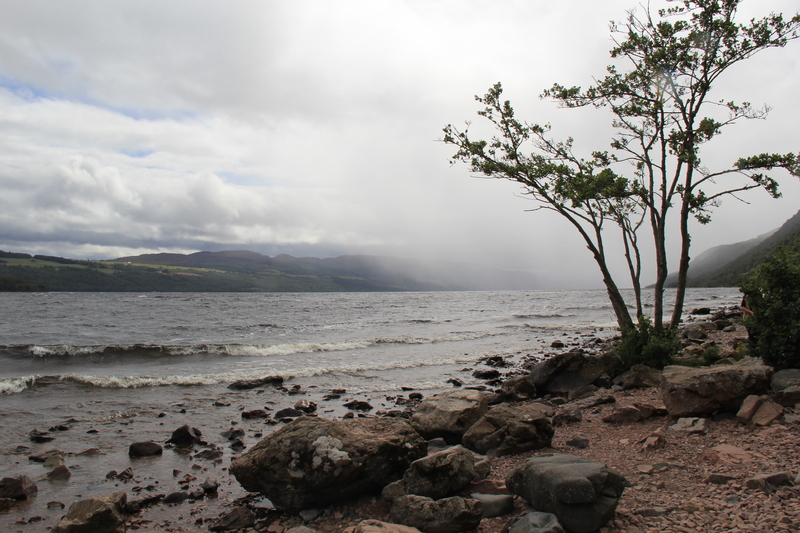 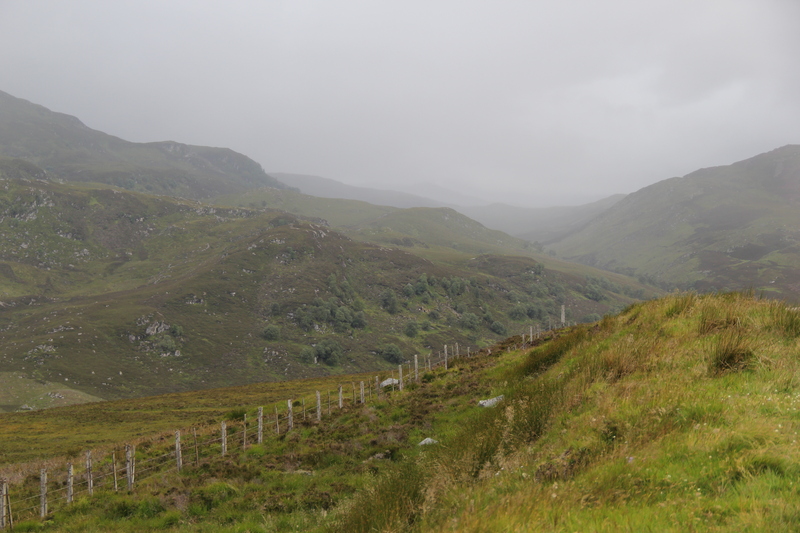 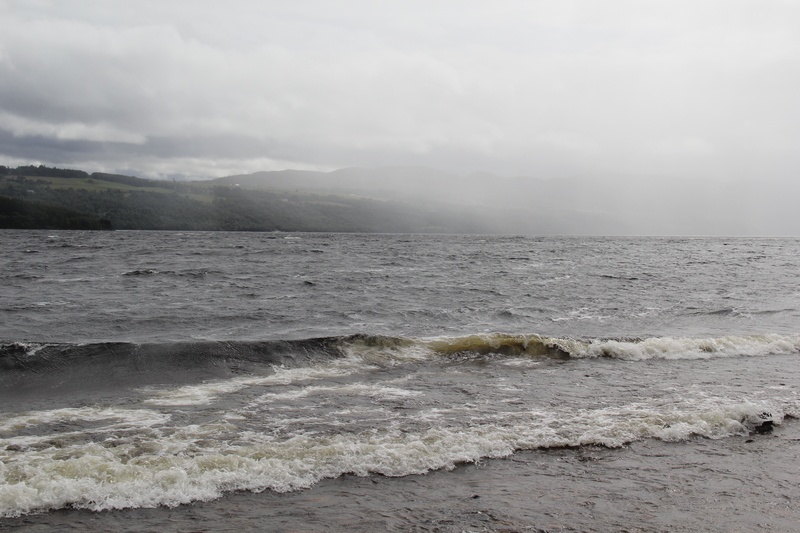 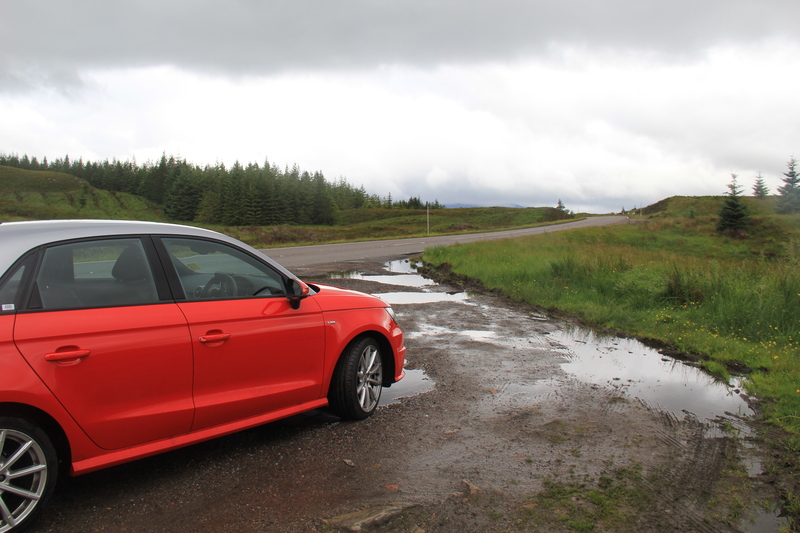 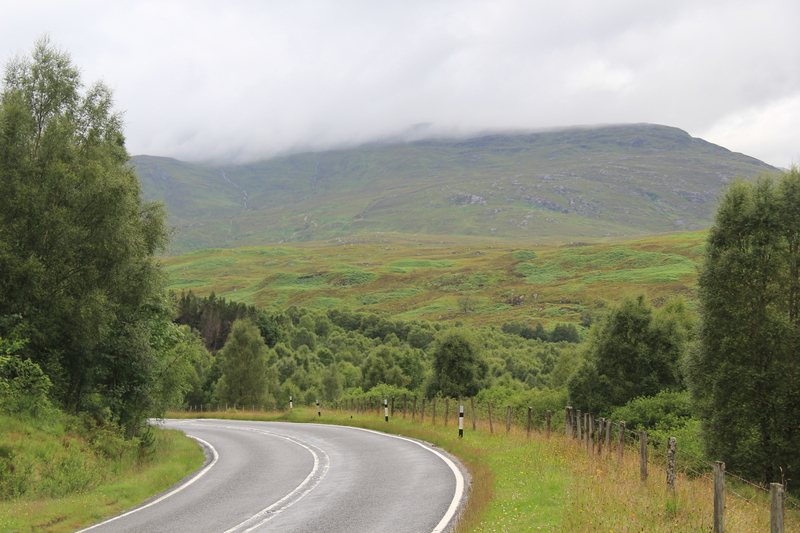 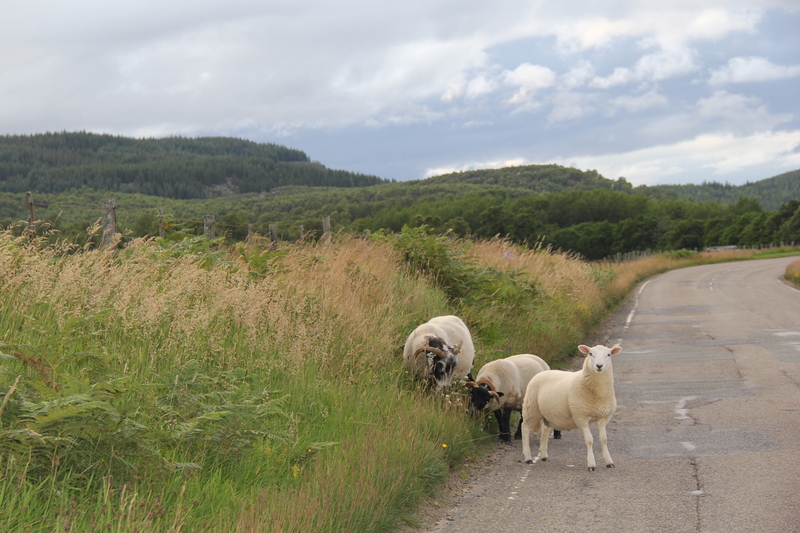 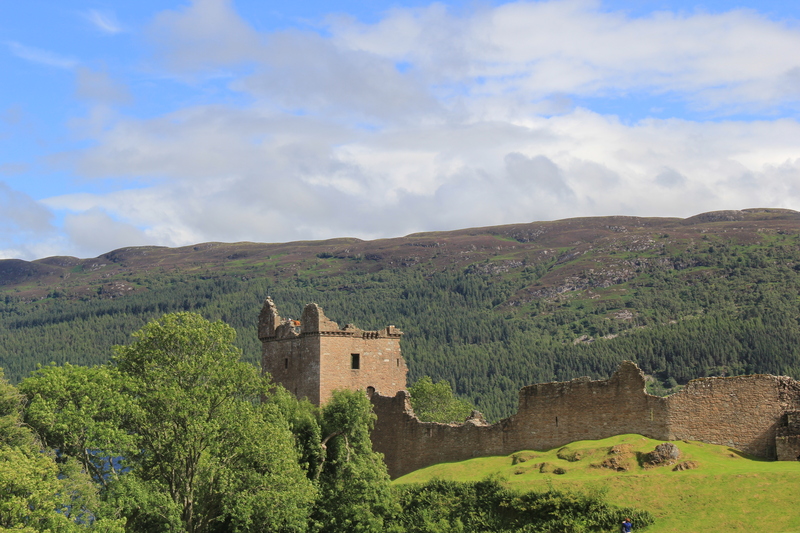 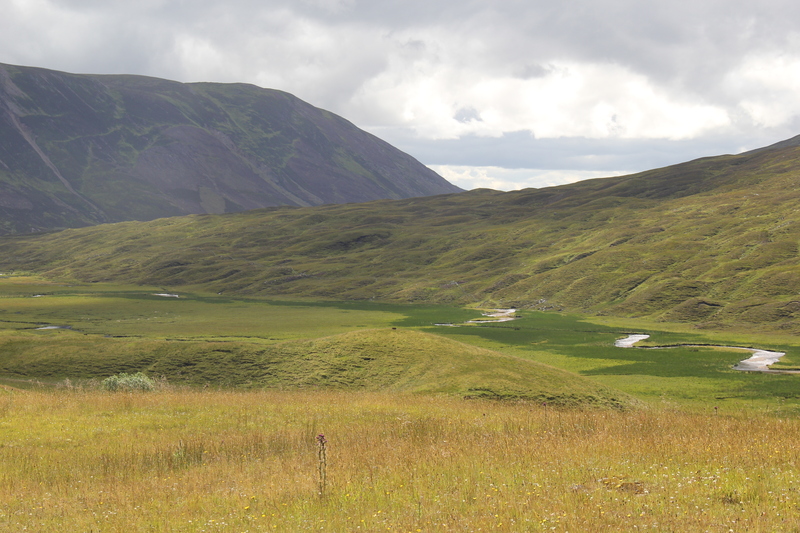 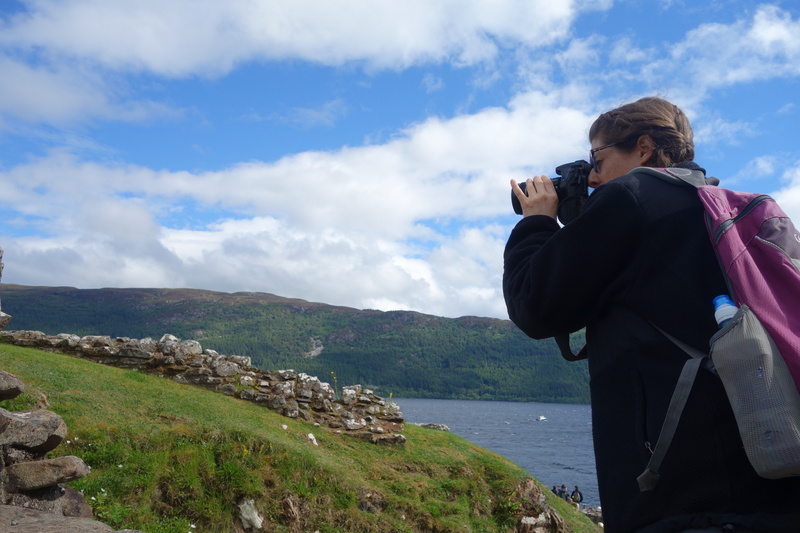 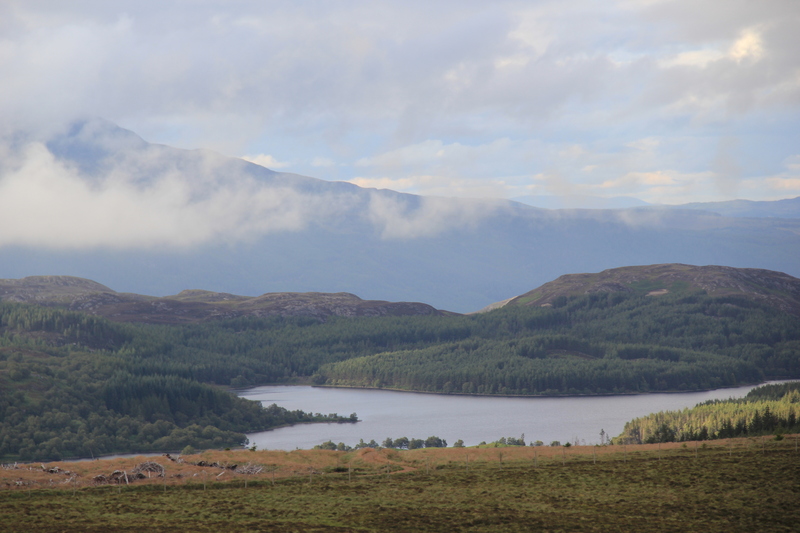 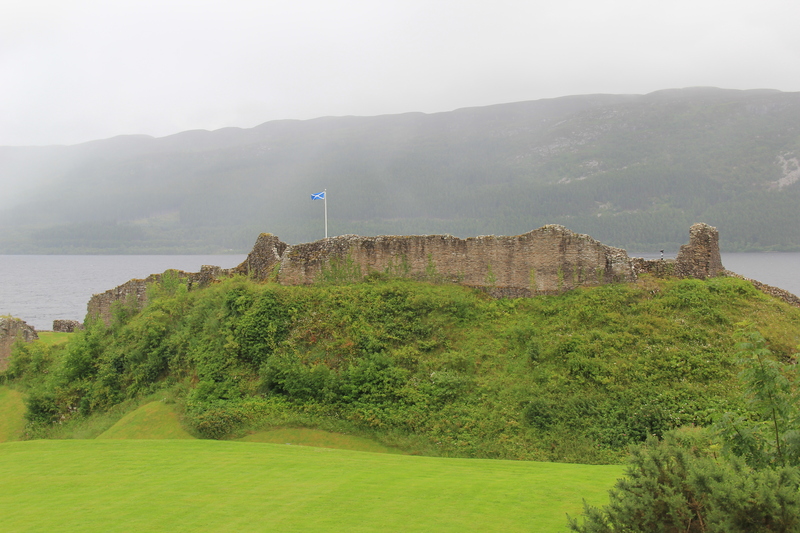 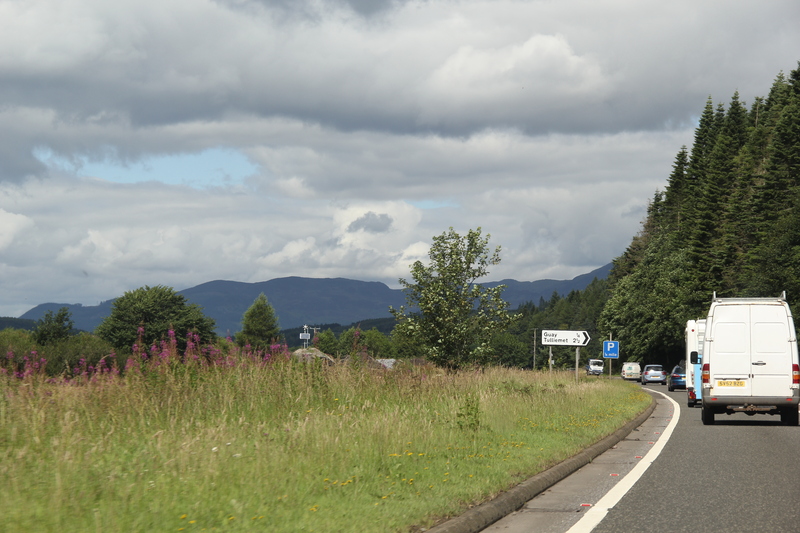 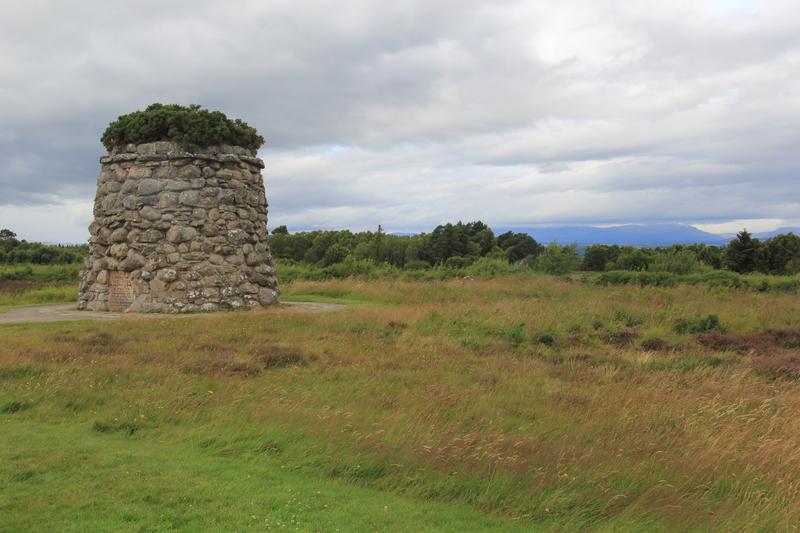 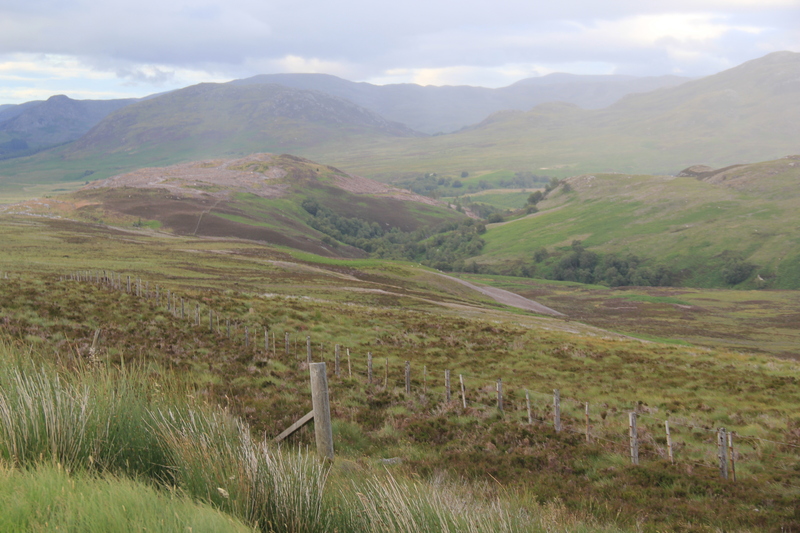 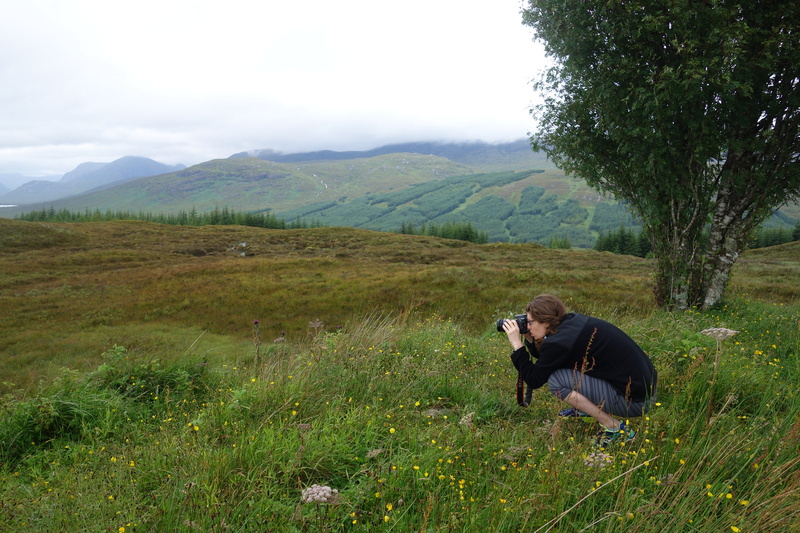 But first we had a three hour drive north, as we made our way through the Scottish countryside to the Highlands. 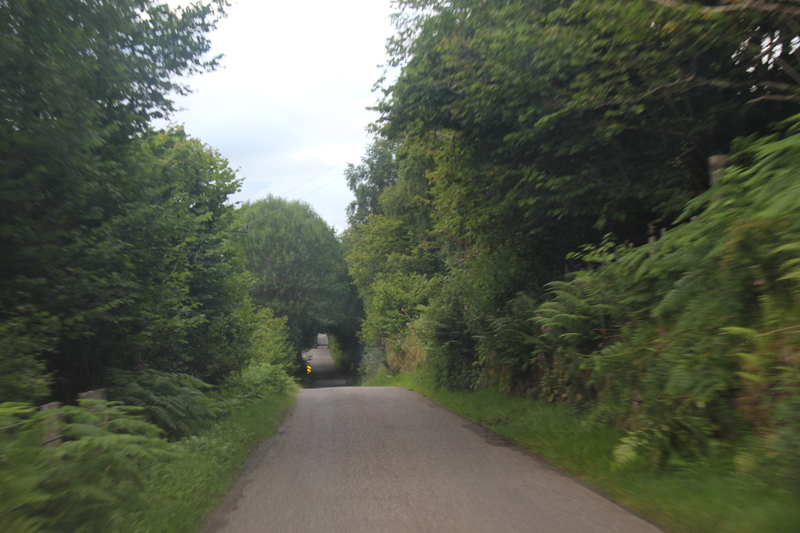 Driving like a champion on the left side of the road! 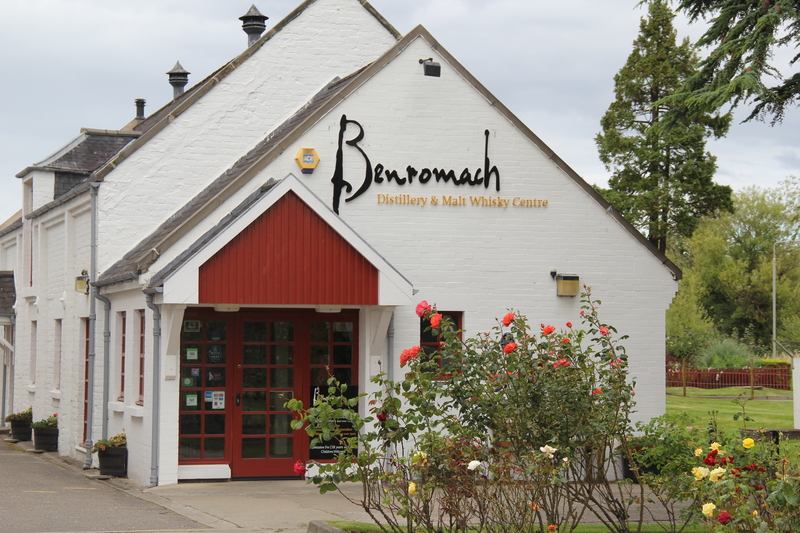 We finally arrived at the charming Benromach distillery. 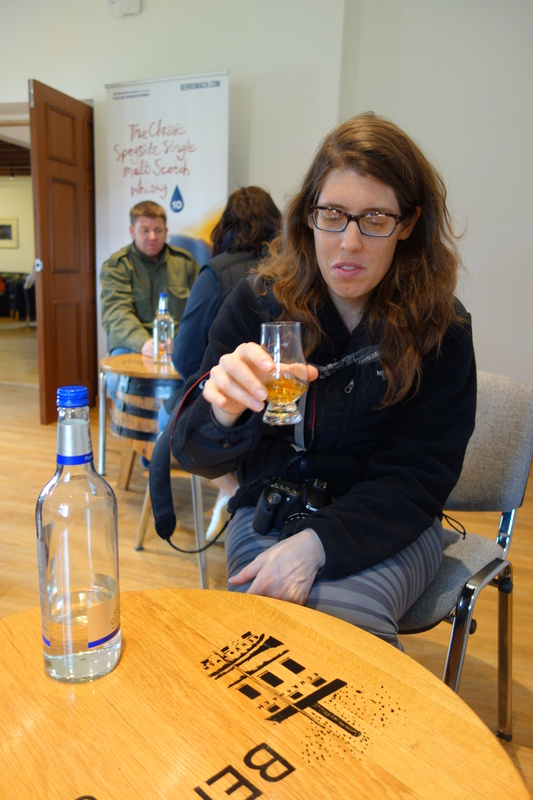 Our guide gave us a tour of the distillery and a detailed explanation of how whisky is made. 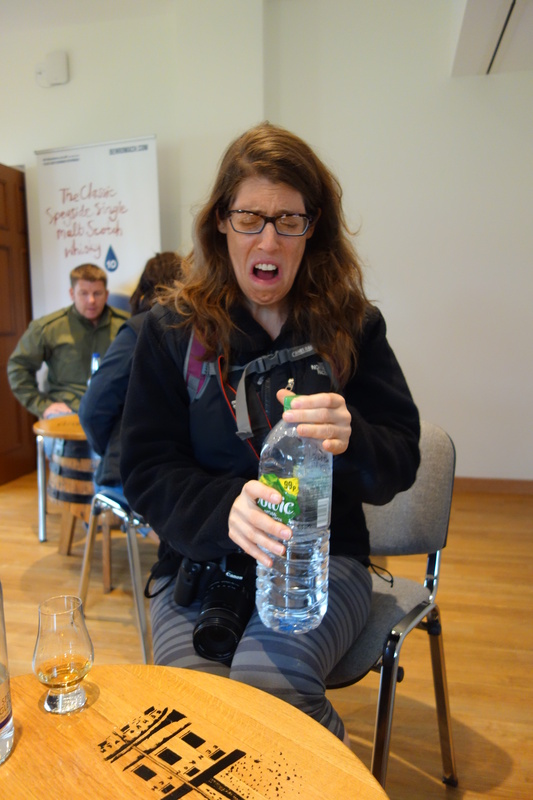 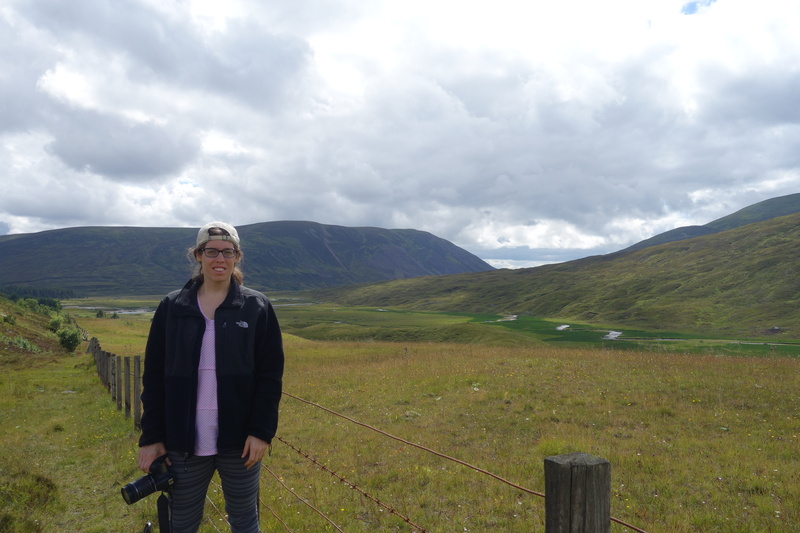 There were no pictures allowed of the actual whisky-making, so you’ll have to settle for a detailed photographic account of my failed attempt to acquire a taste for Scotch. 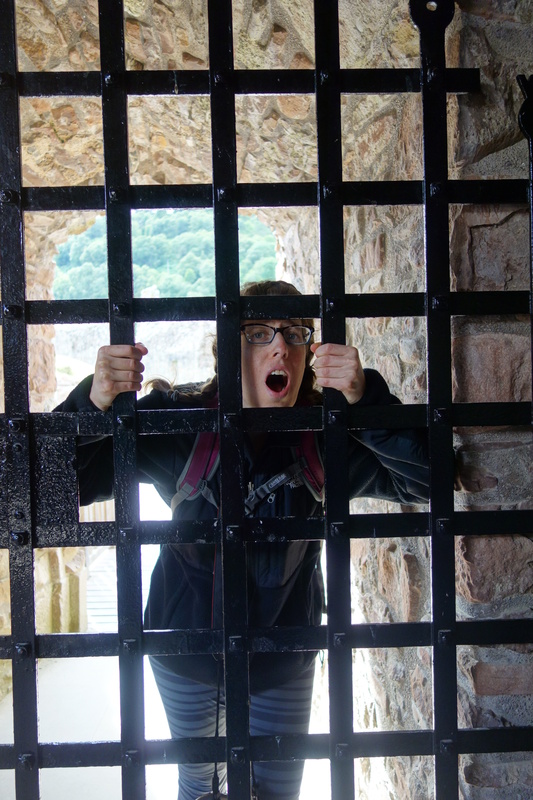 As you can see, I did not like anything about this process. 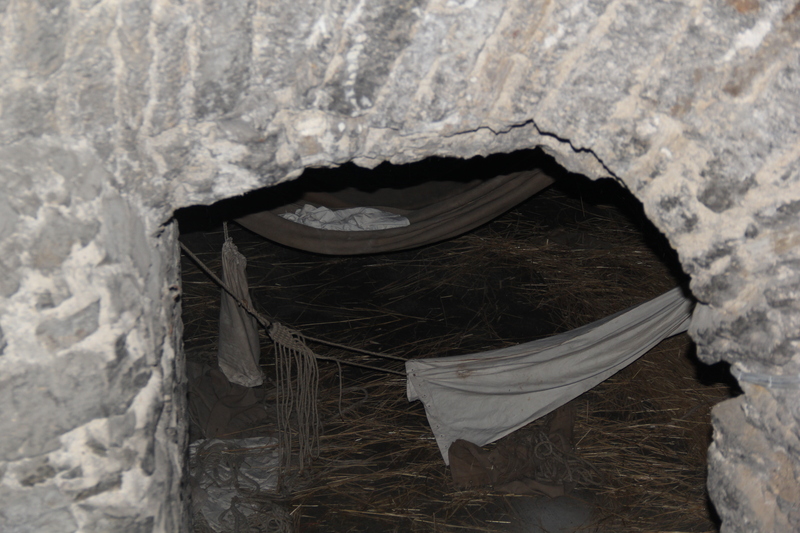 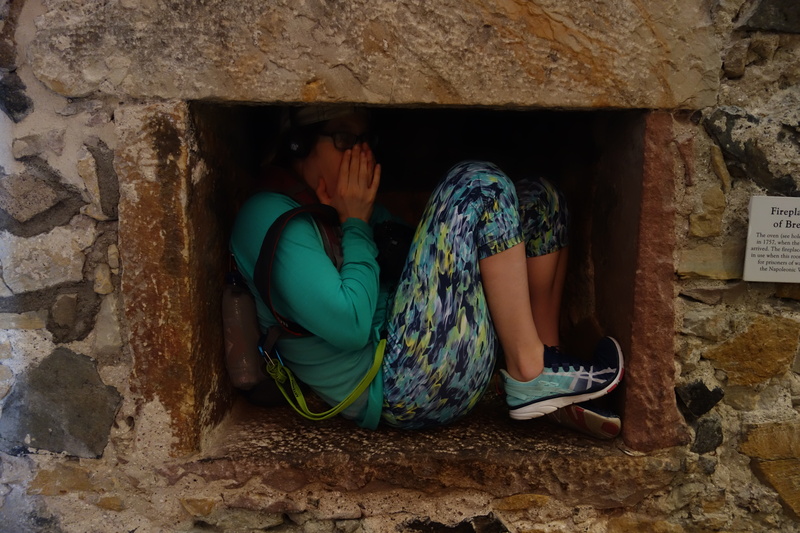 I found the smell… less than enjoyable. 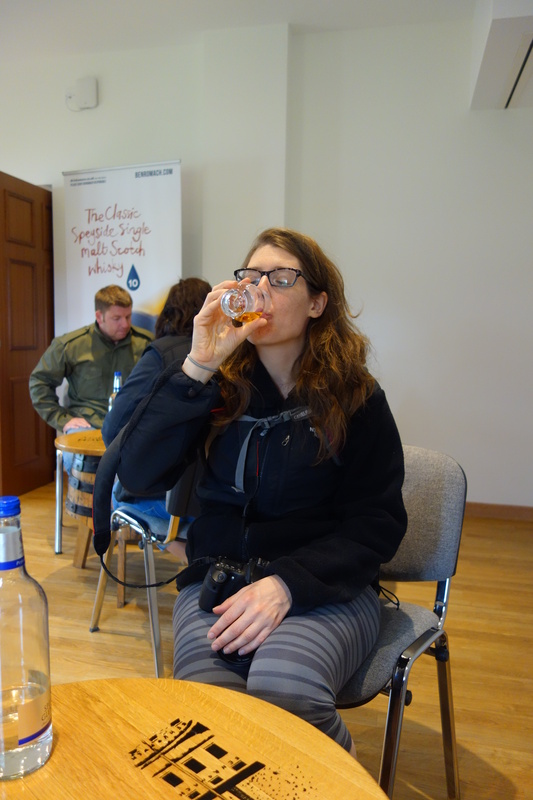 And it kind of tasted like drinking liquid fire. 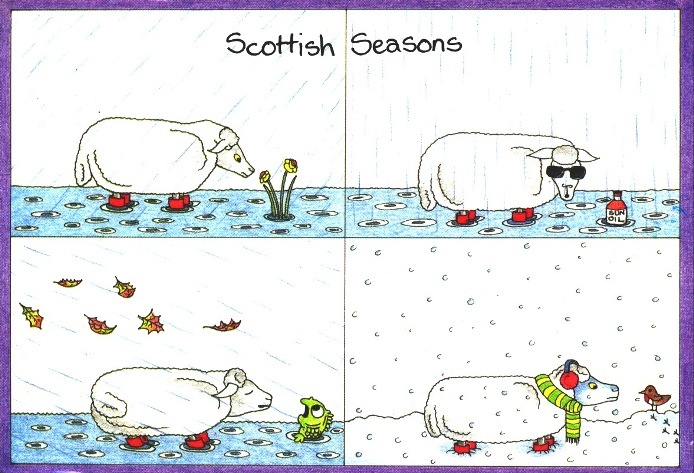 Now, this is not meant as an insult to Benromach. 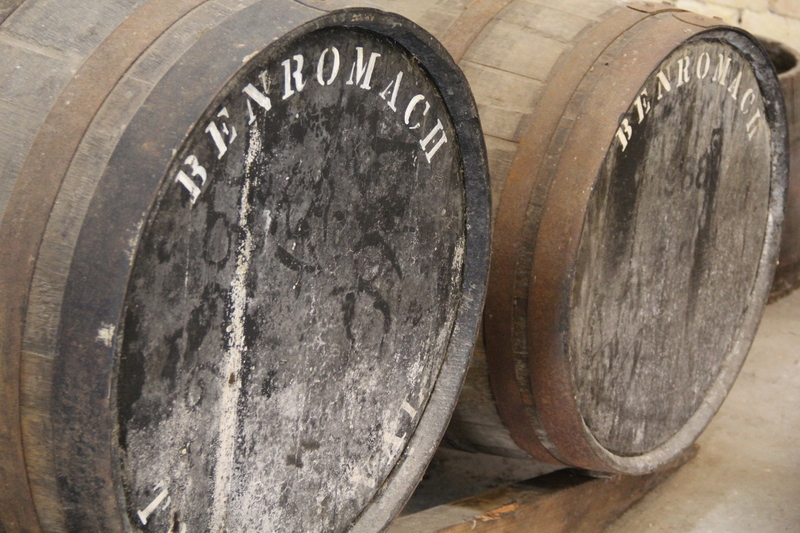 I’m sure they make a very fine whisky if you are a whisky drinker. 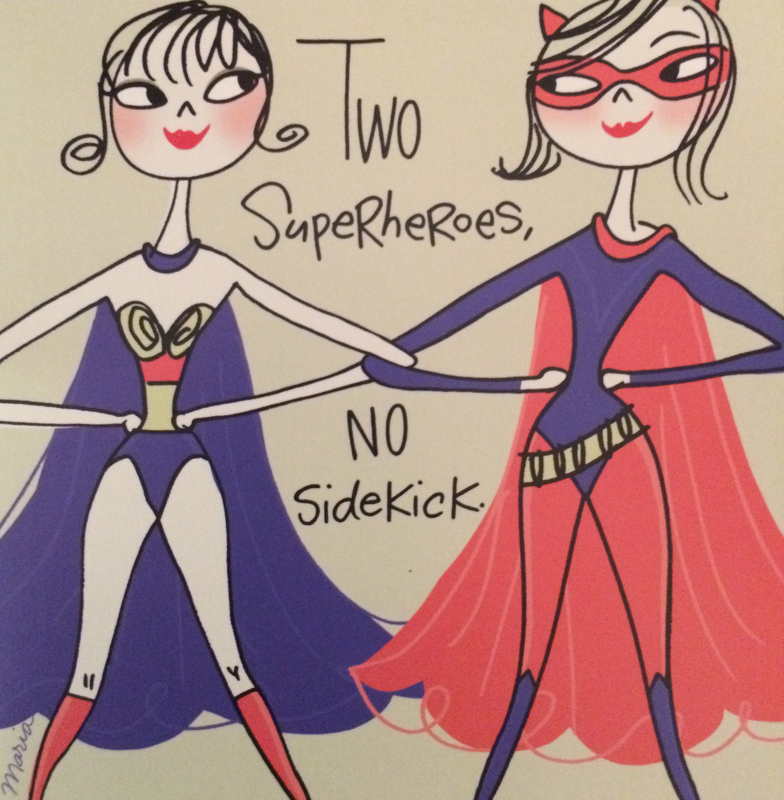 I am decidedly not. 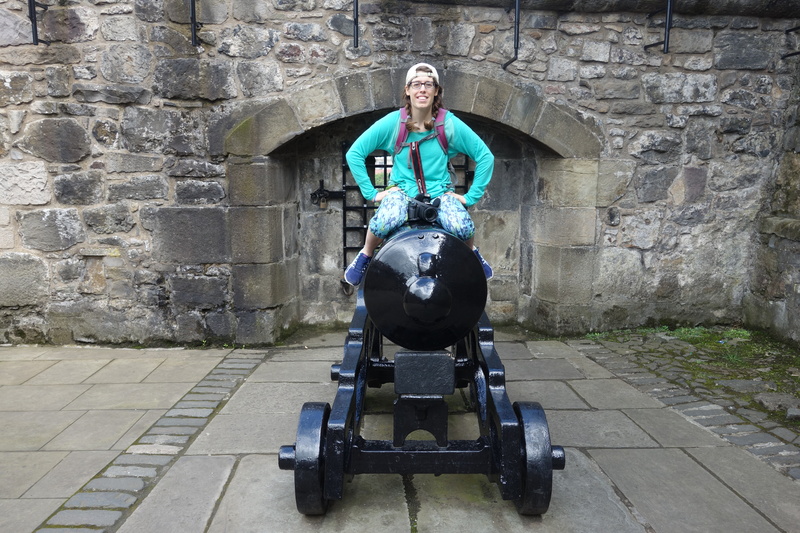 I do not think they will be using these pictures in their next advertising campaign. 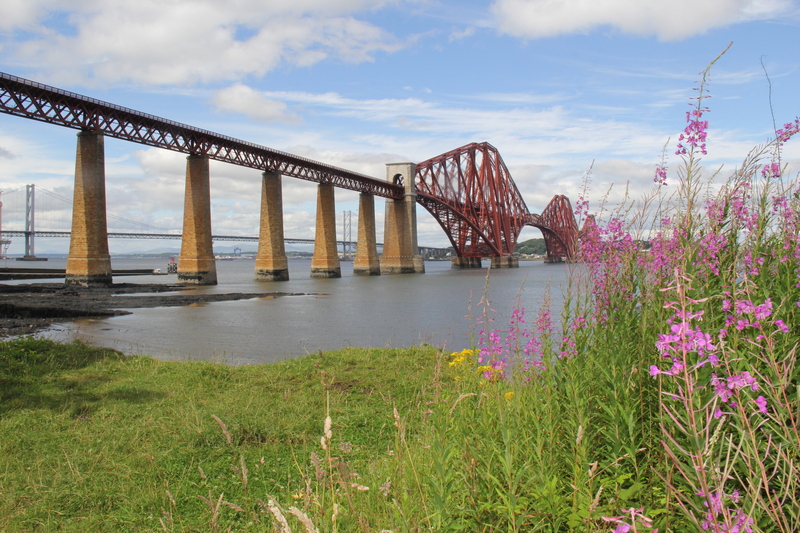 The Fife Coastal Path is a stunning walking path stretching 113 miles along the Firth of Forth and the Firth of Tay on Scotland’s eastern shore. 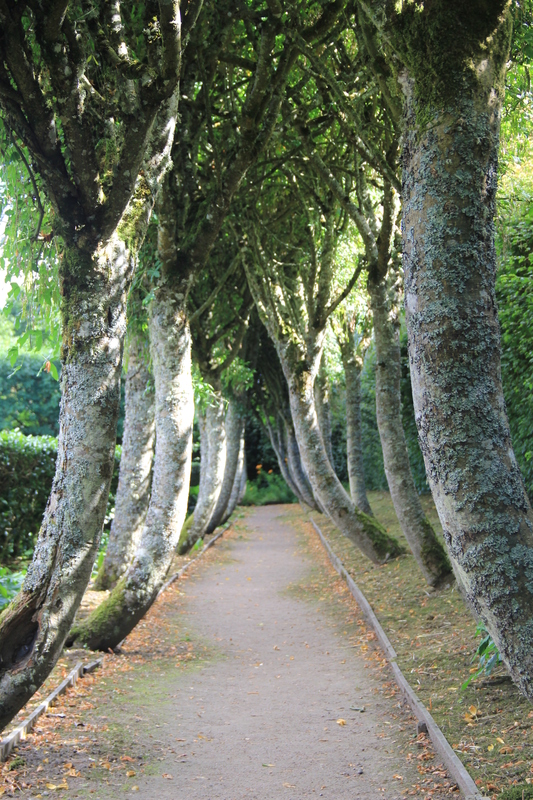 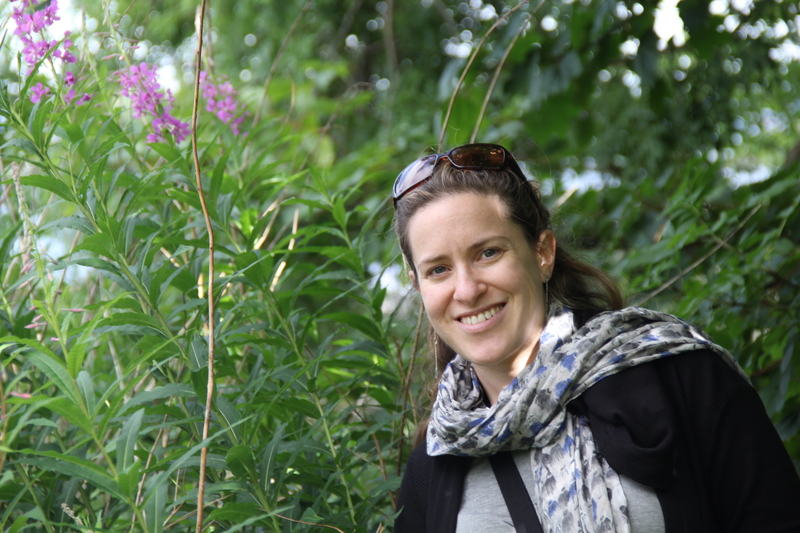 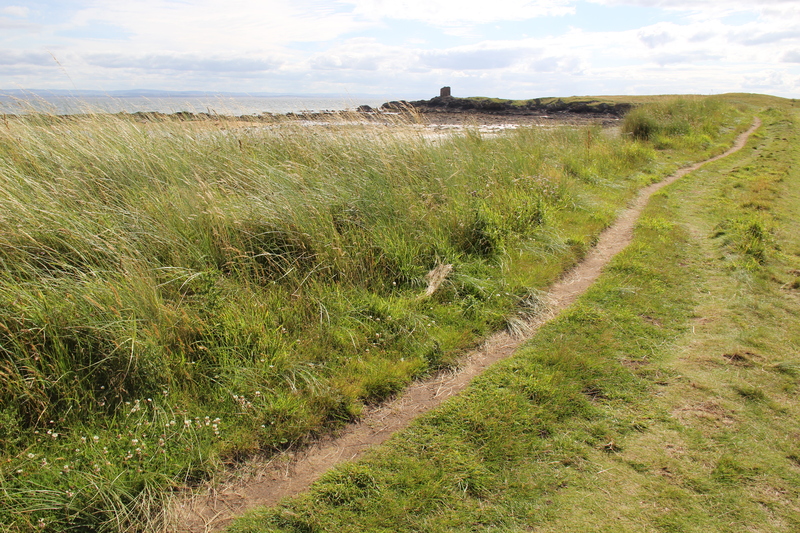 Some people walk the entire path over several days, but we budgeted a couple of hours for a short walk on our way north. 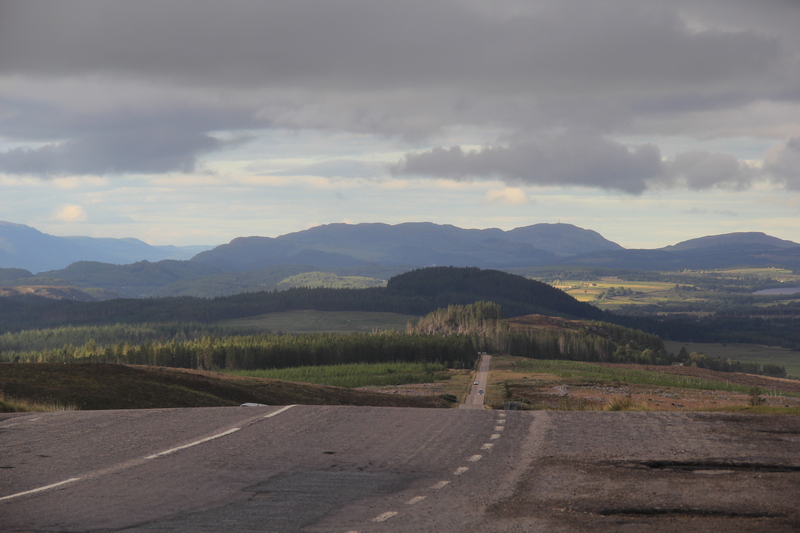 The hardest part was choosing just one small part out of 113 beautiful miles. 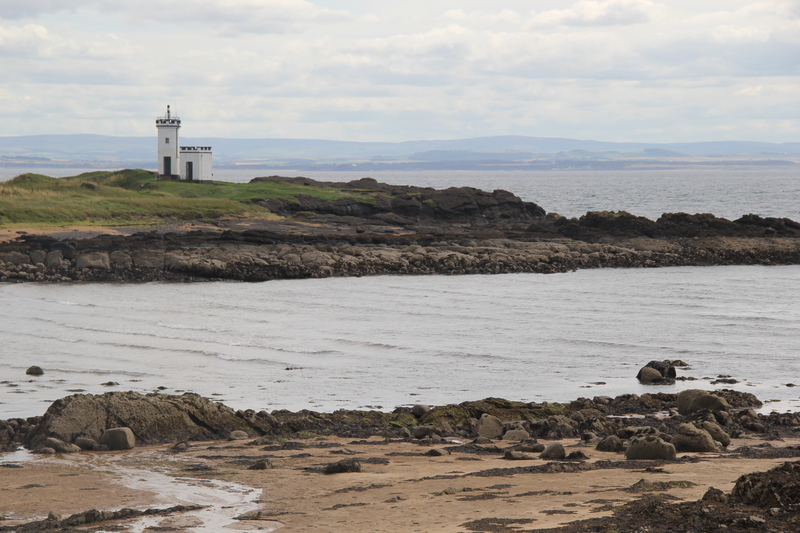 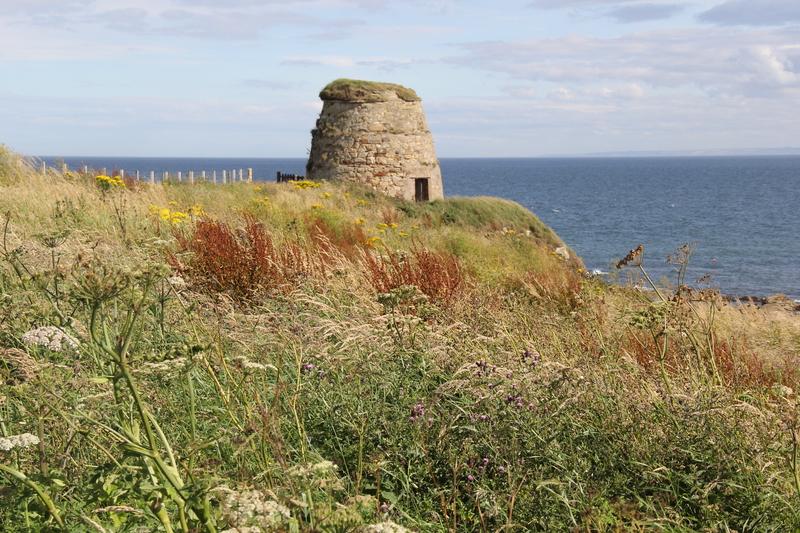 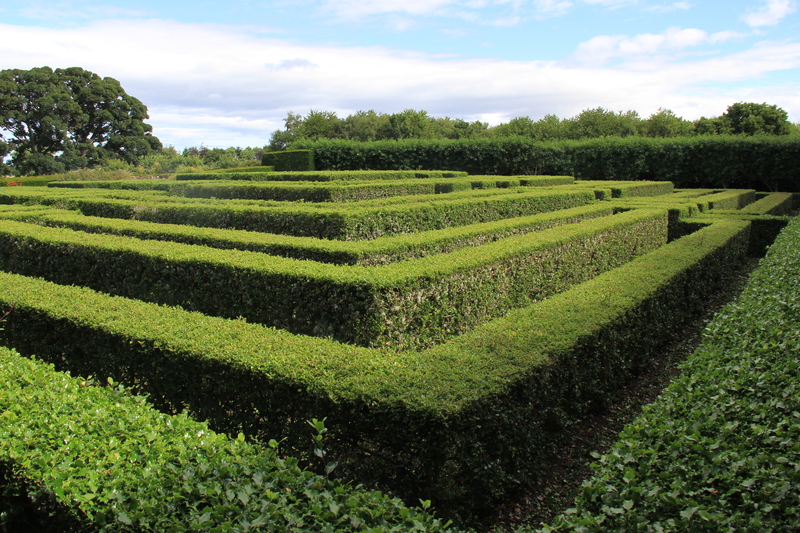 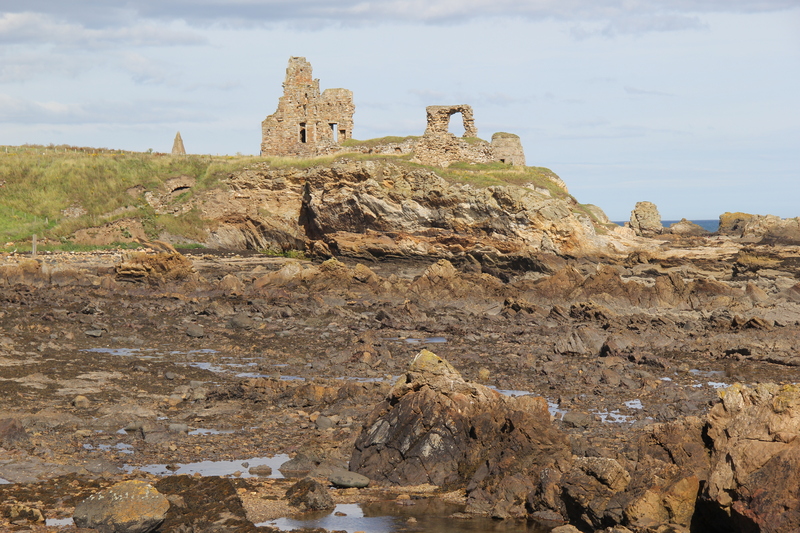 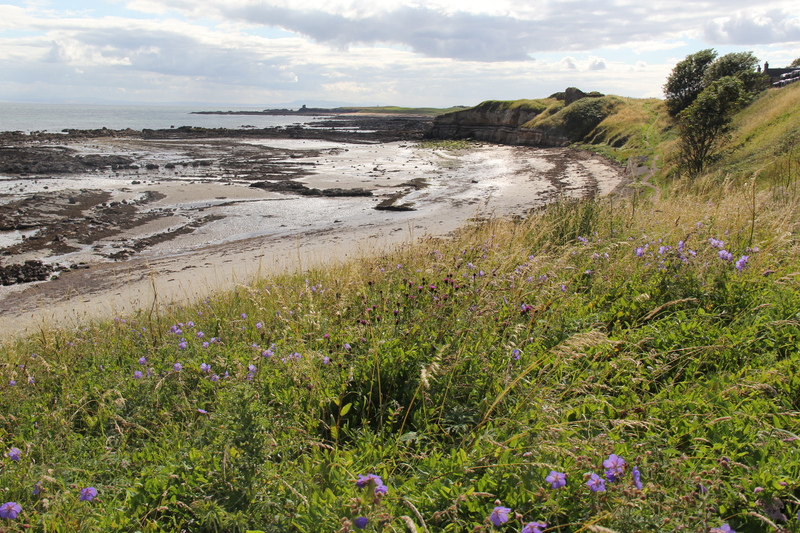 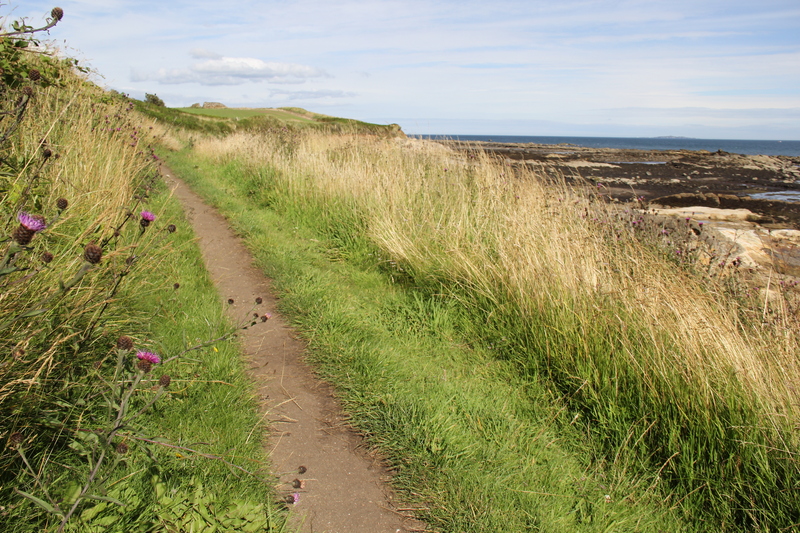 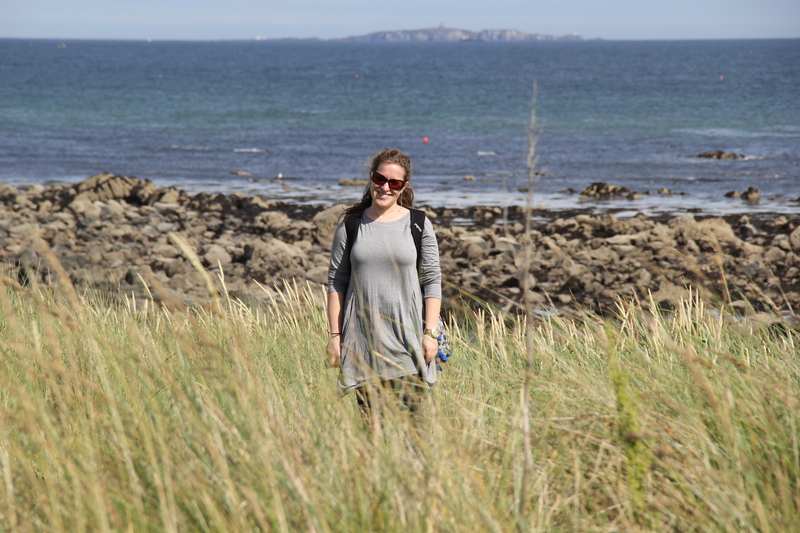 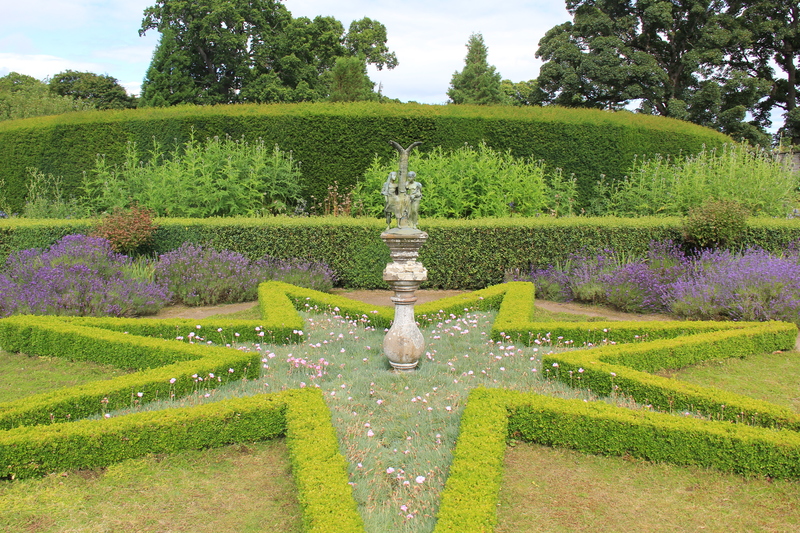 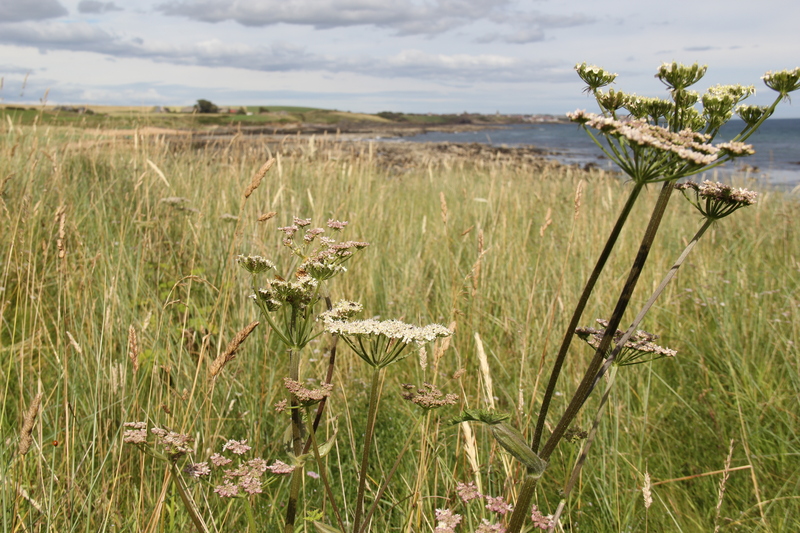 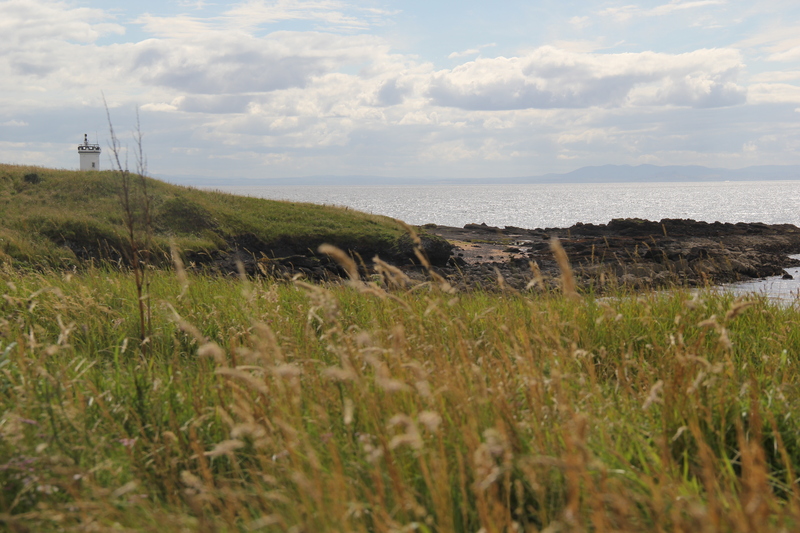 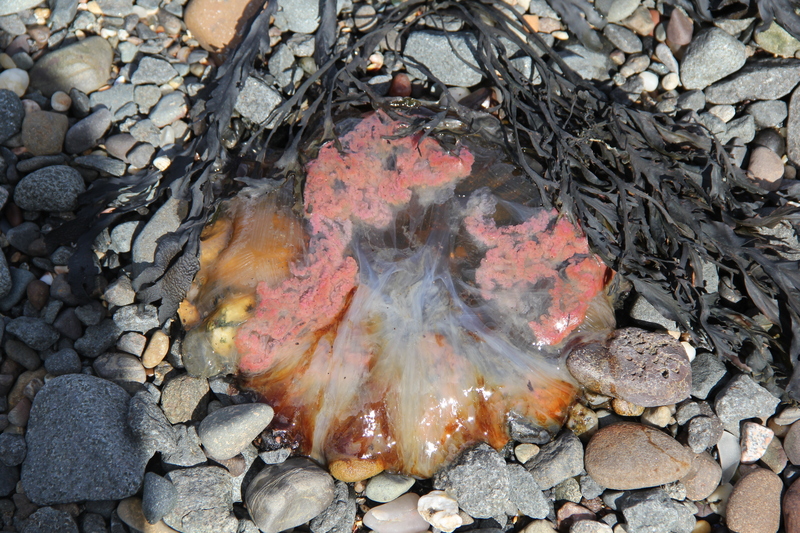 After extensive research, we picked a four-mile stretch from Elie to Pittenweem. 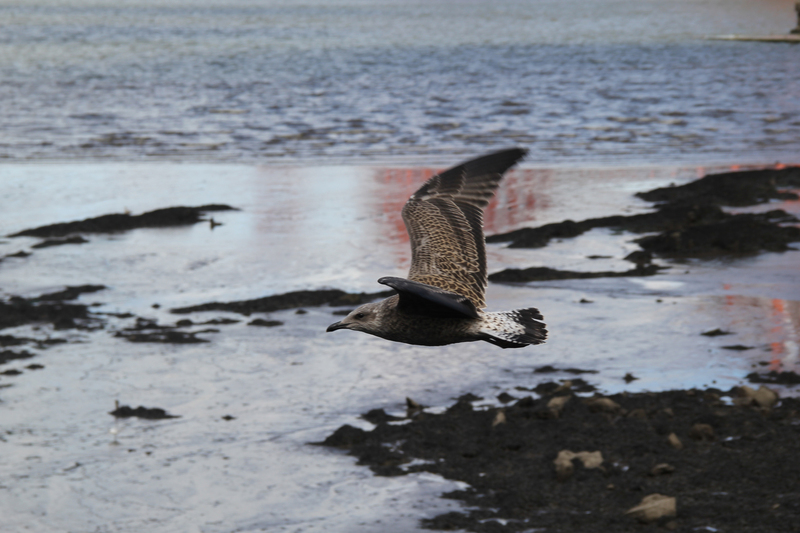 It was a great choice. 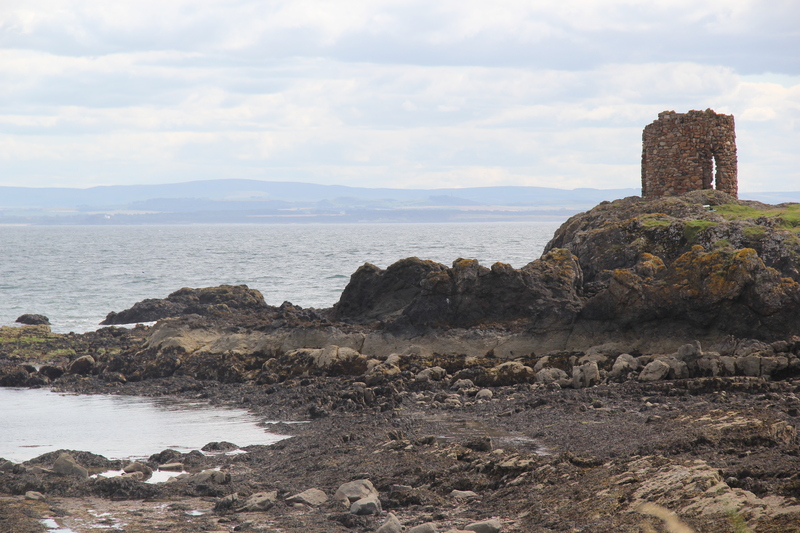 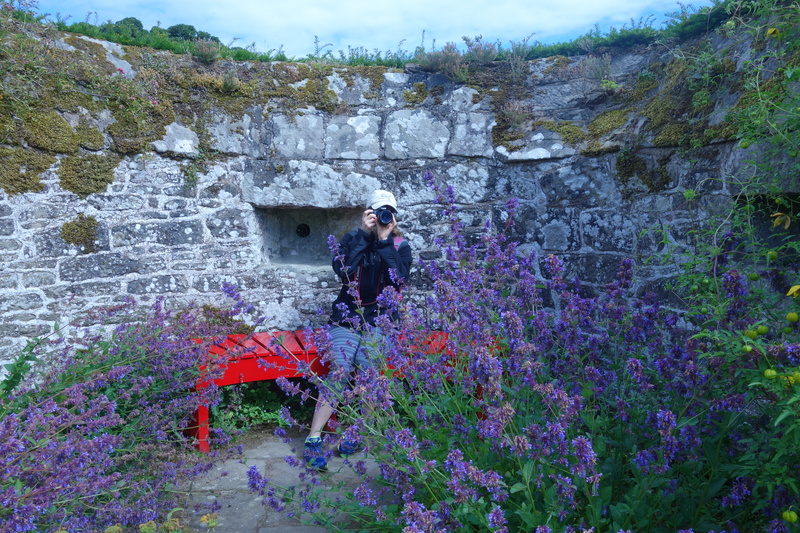 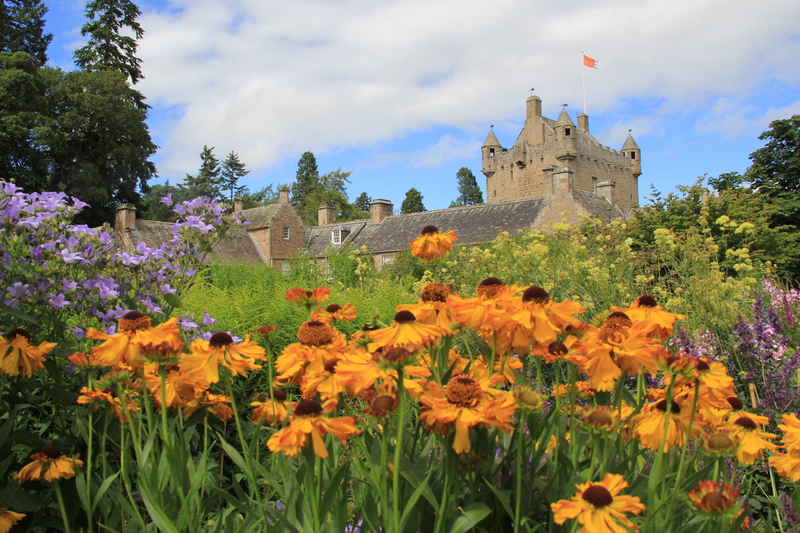 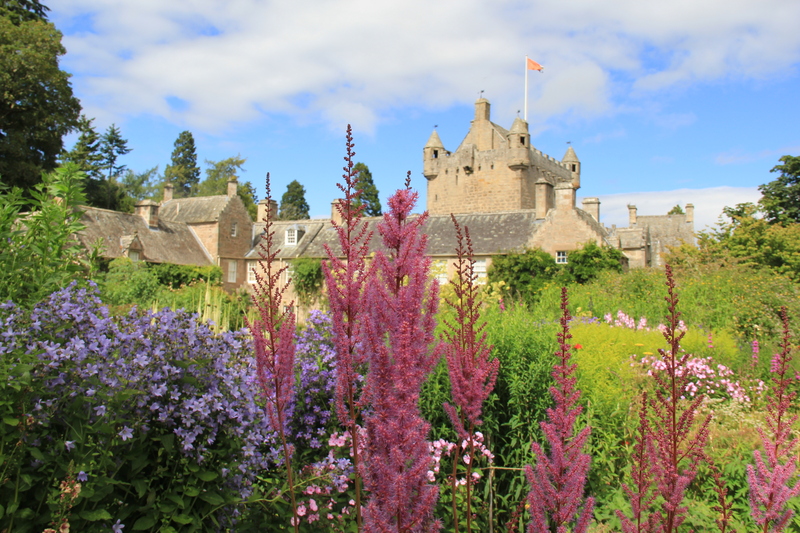 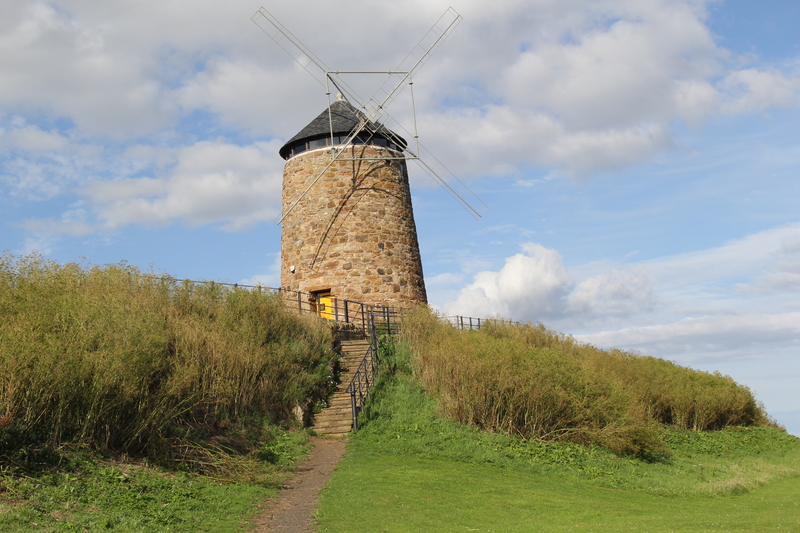 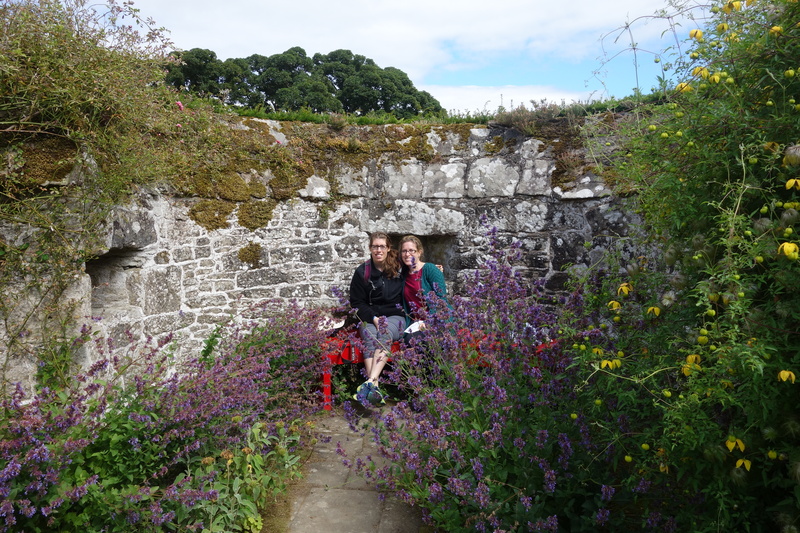 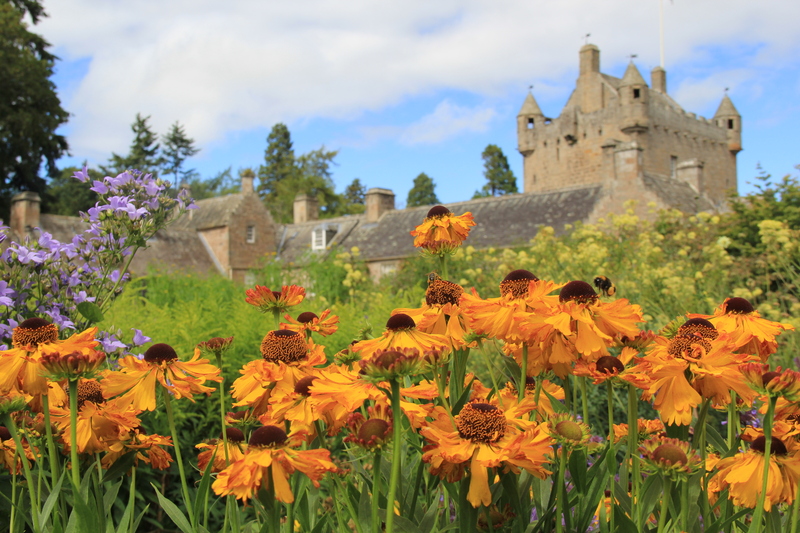 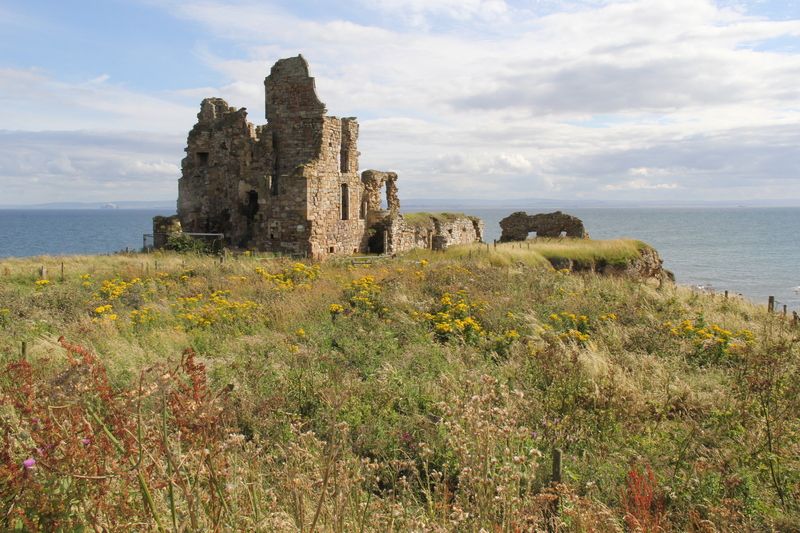 We walked past two ruins, through the tiny town of St. Monans and its incredible Wellie boot garden, and ended our stroll in the charming village of Pittenweem where we hopped the bus back to Elie. 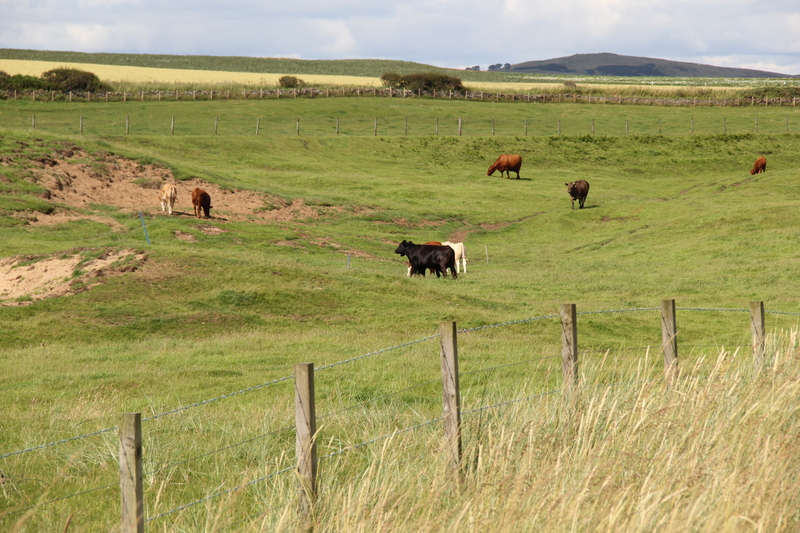 We saw everything from endless blue waters, to meandering cows, to adorable sculptures, to picturesque fields. 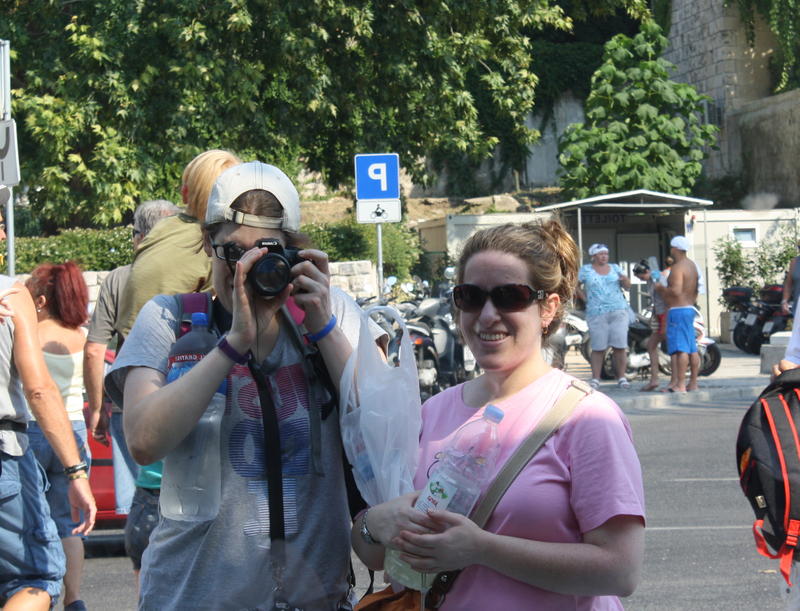 I would be lying if I said we made an effort to limit the number of pictures we took. 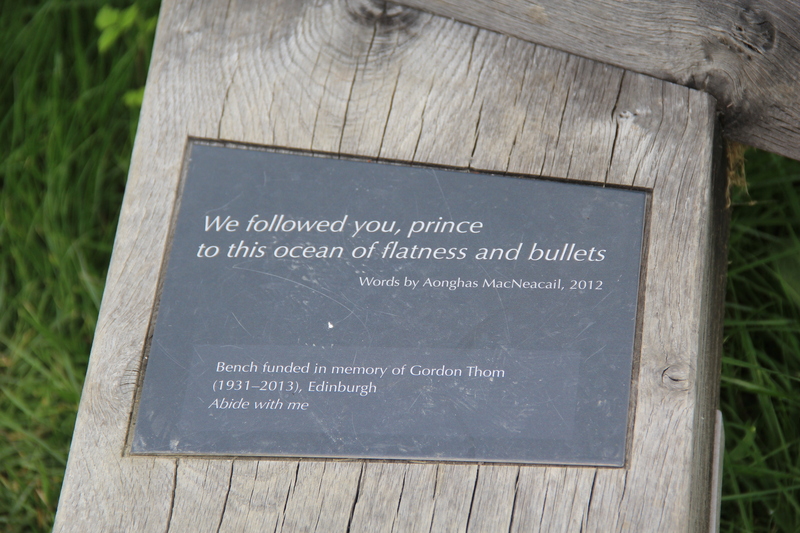 We most certainly did not. 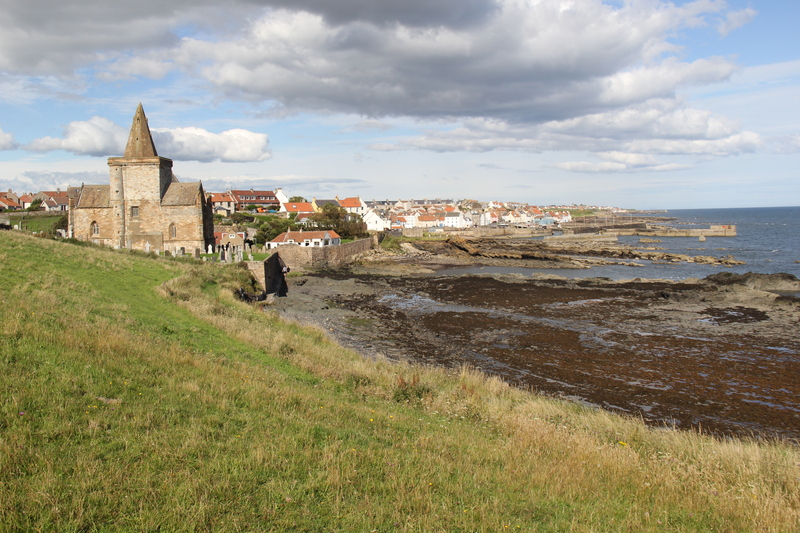 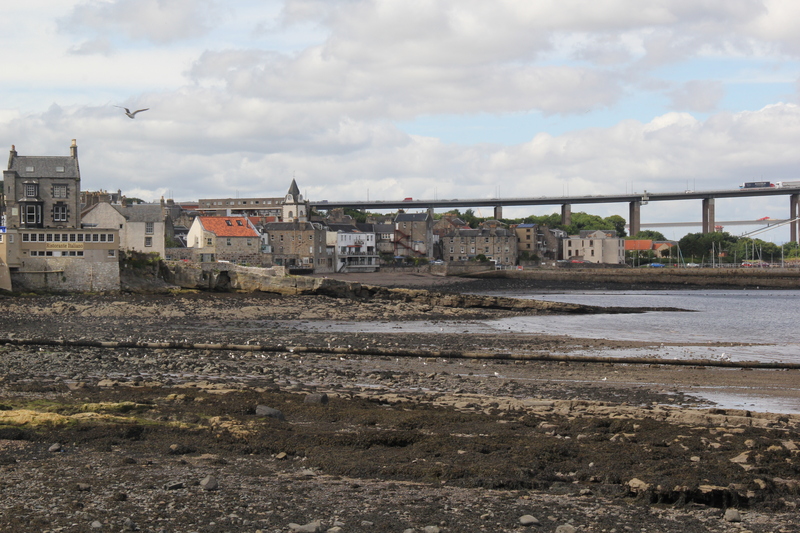 Approaching the town of St. Monans. 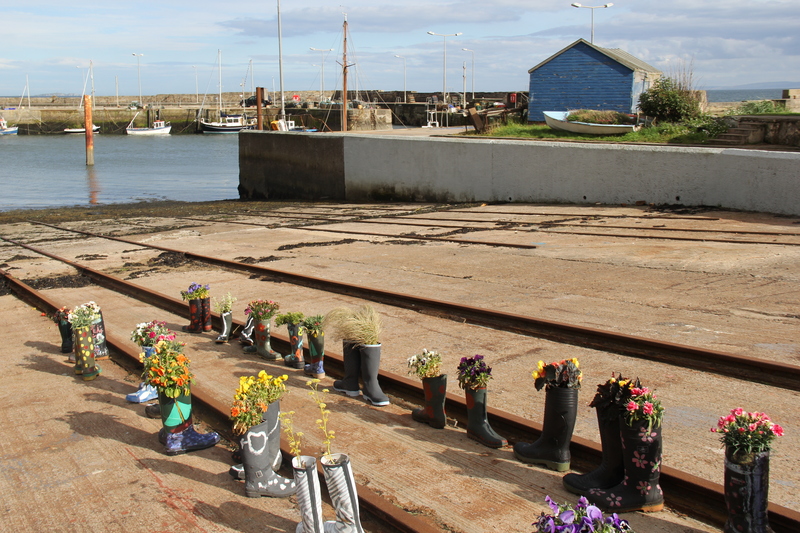 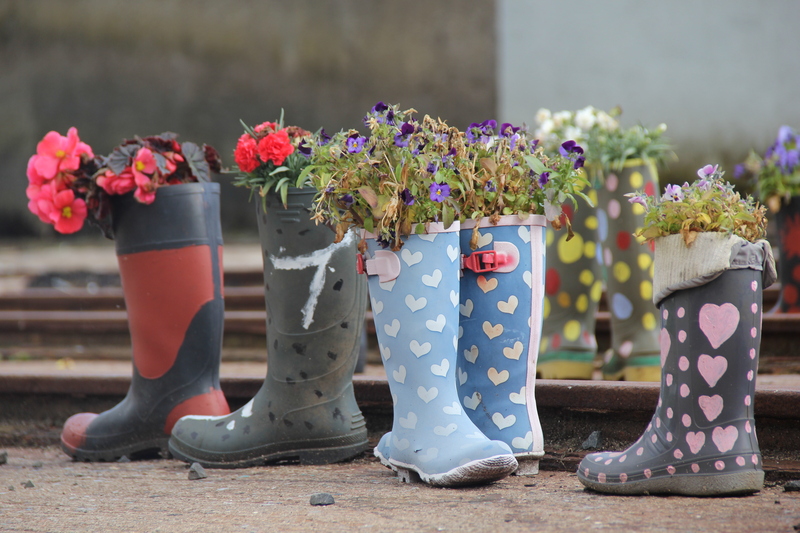 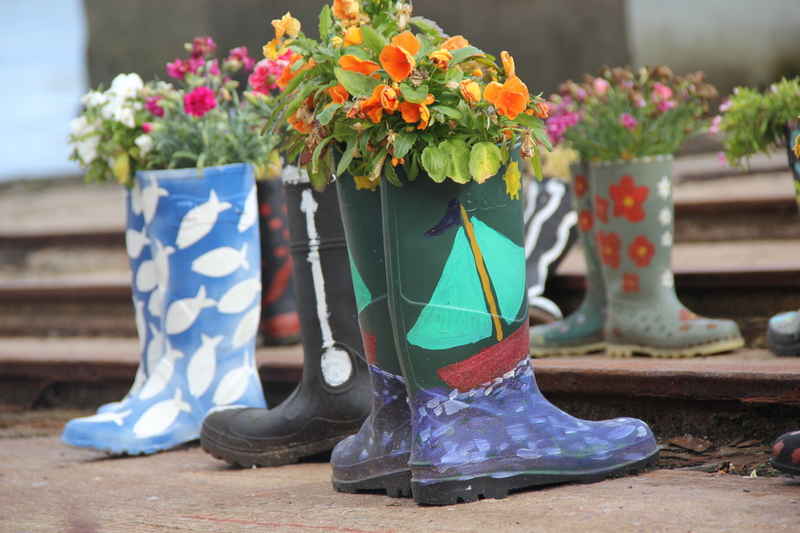 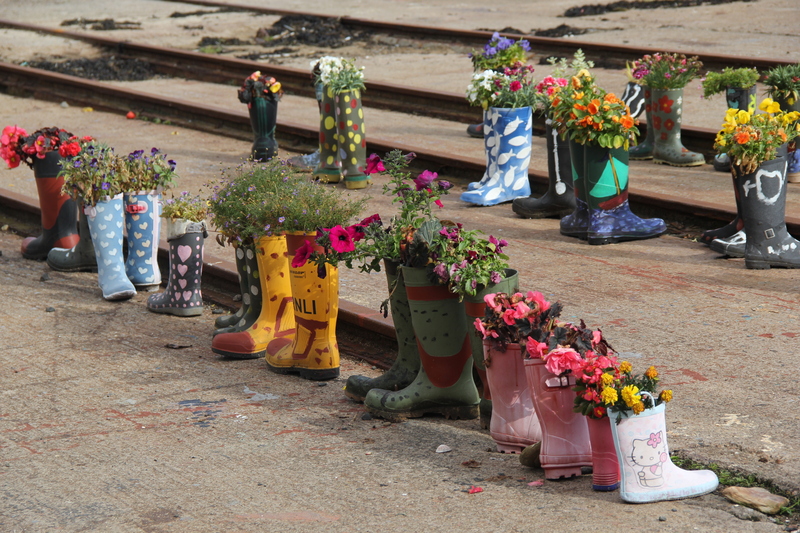 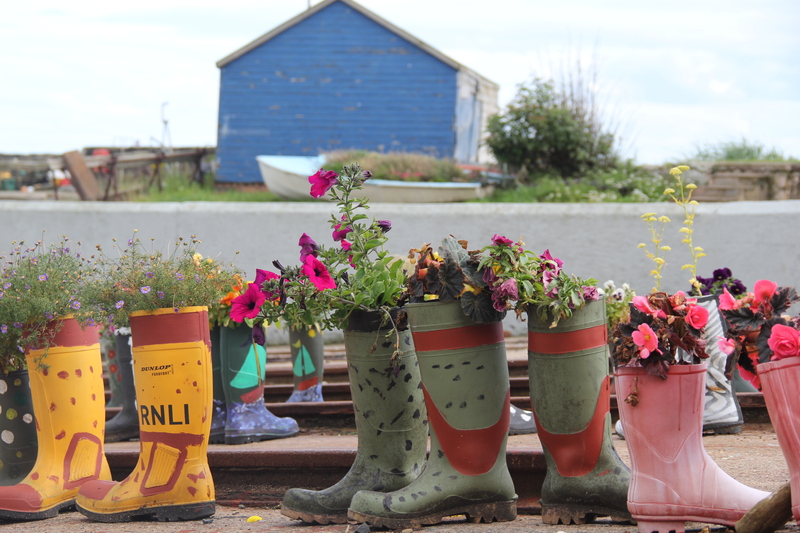 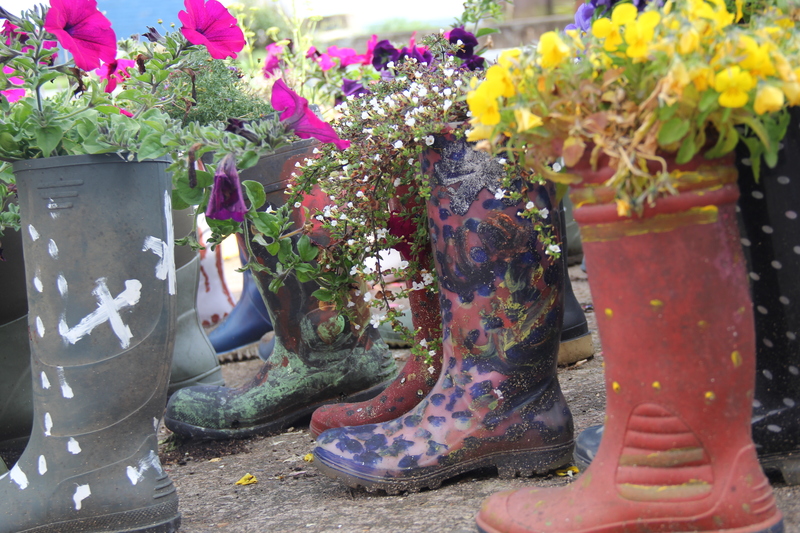 I quickly became obsessed with the Wellie boot garden in St. Monans. 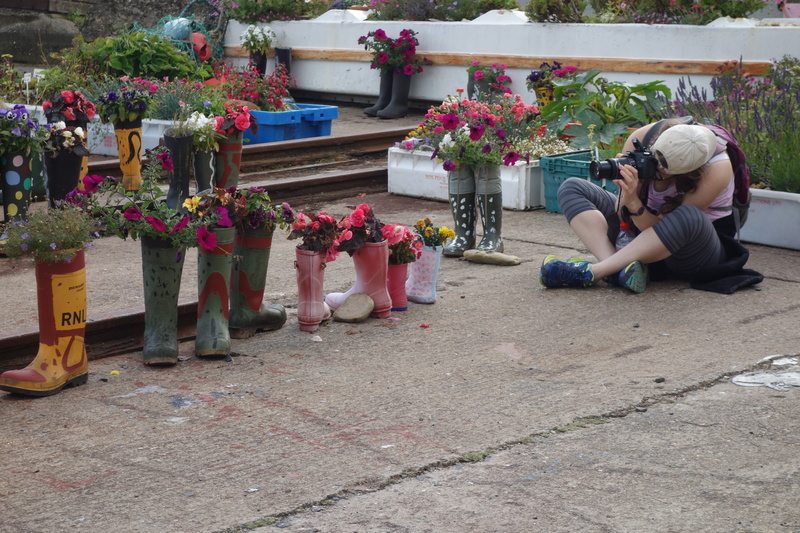 The evidence of said obsession is below. 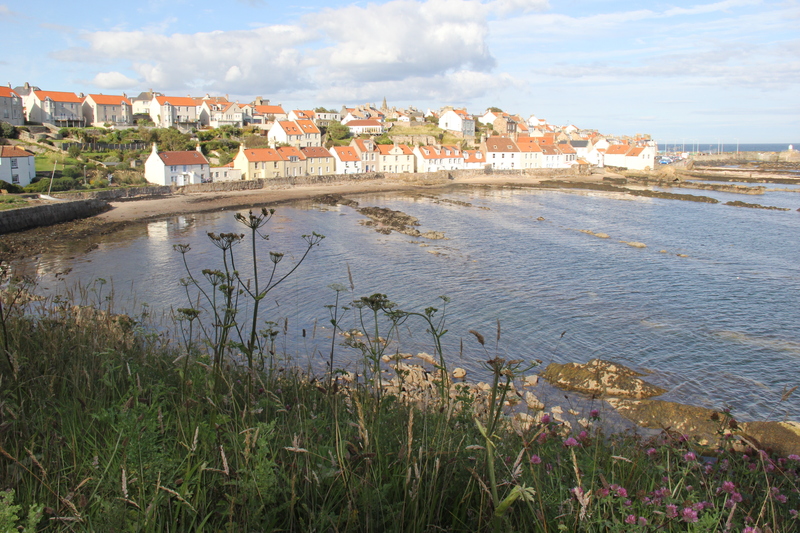 Approaching the town of Pittenweem. 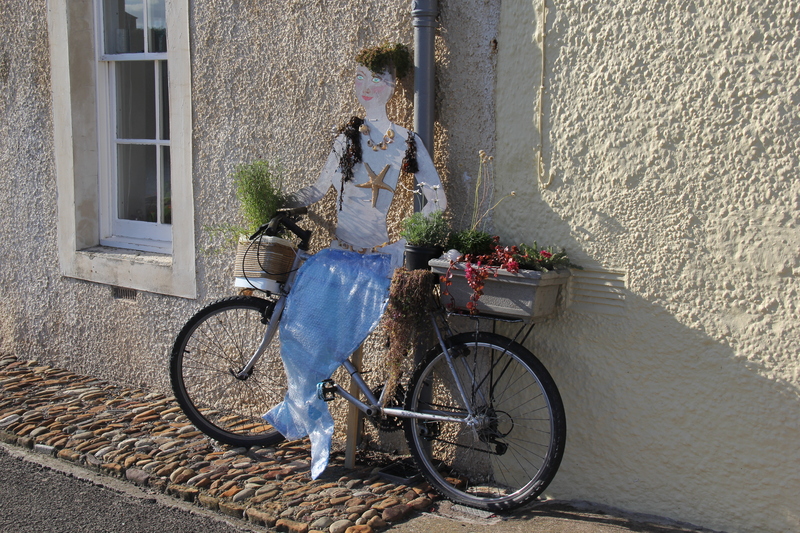 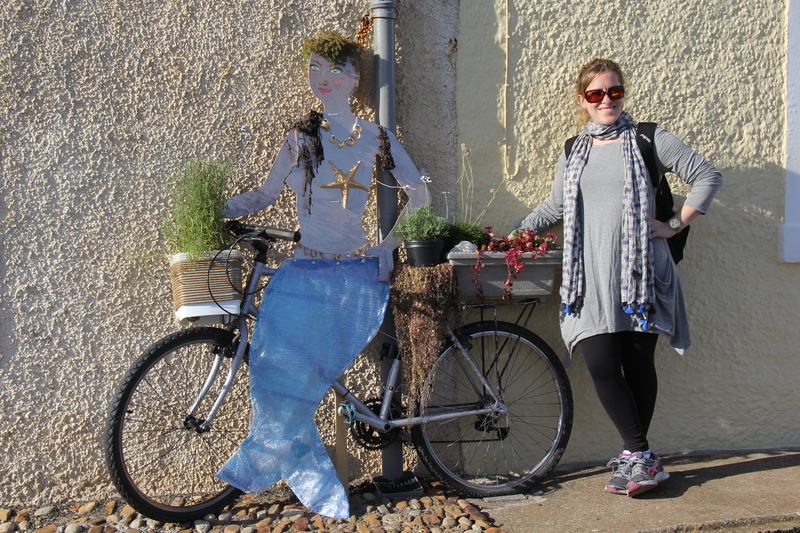 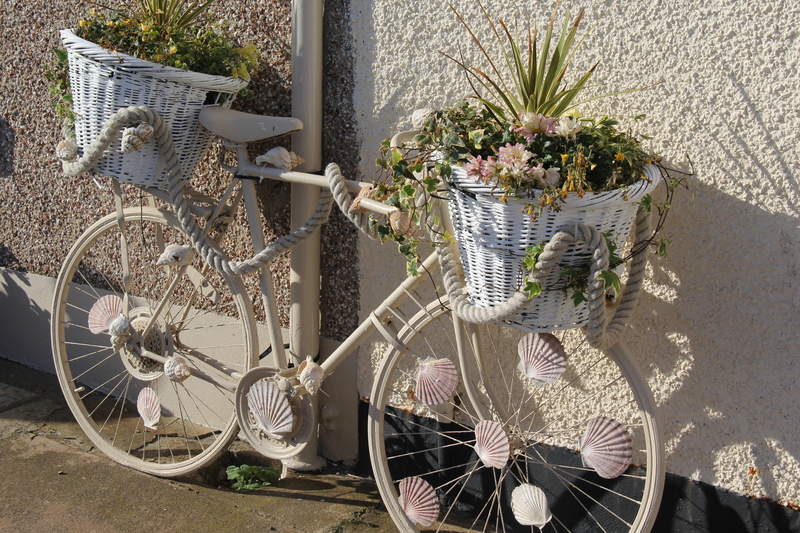 Pittenweem has a fondness for delightful bike sculptures. 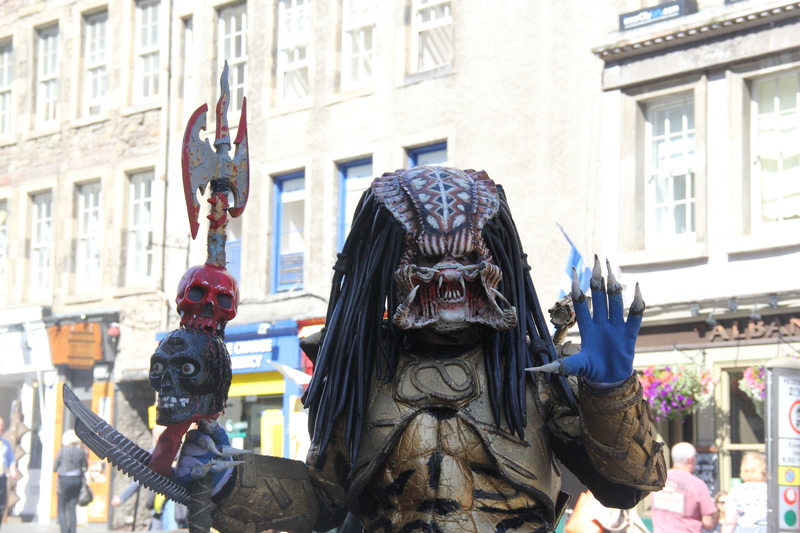 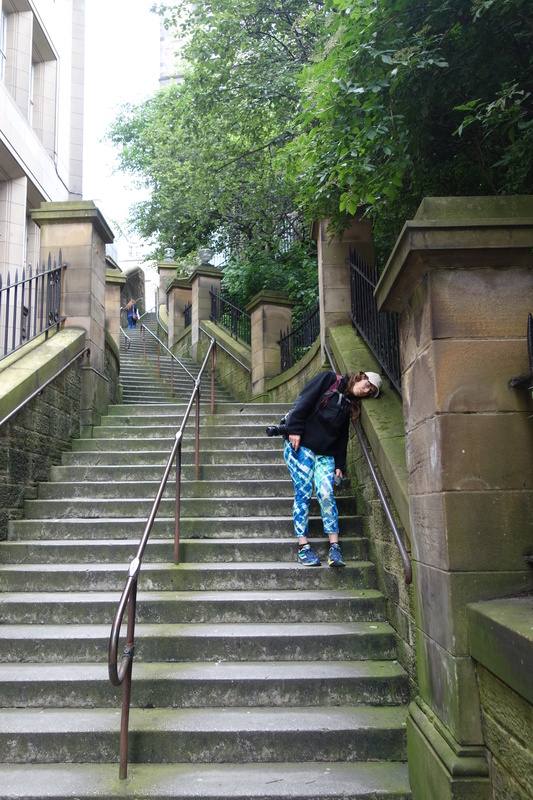 We took it easy on our last full day in Edinburgh. 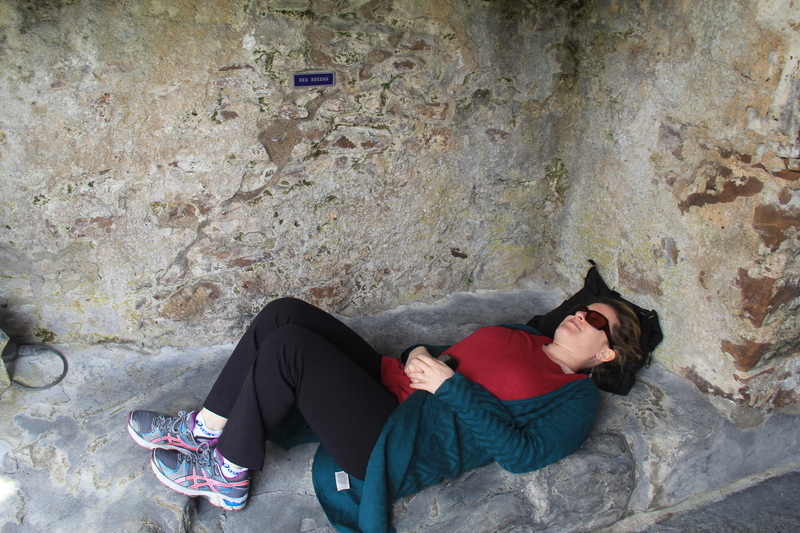 I was starting to get sick (getting sick on vacation is no fun – in case you’re curious) and I collapsed in my hotel bed at 3 p.m. 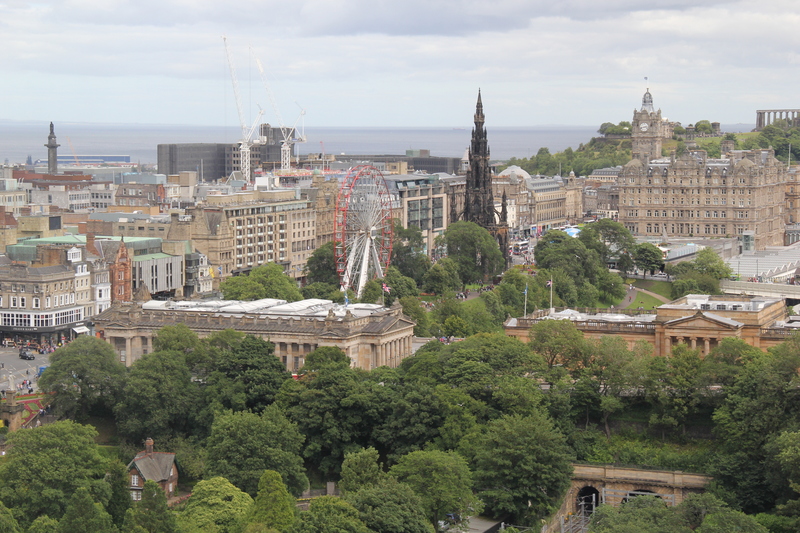 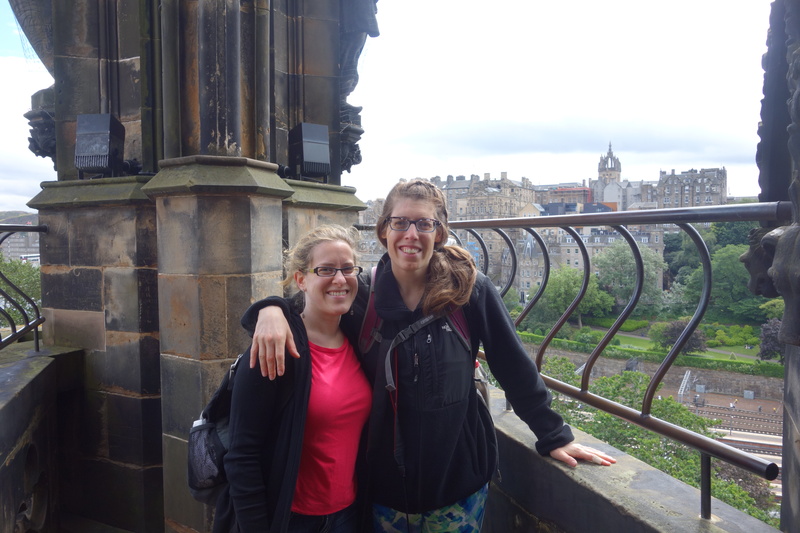 But before said collapsing, we headed to Scott Monument in New Town to check out the views of the city from the top of the most recognizable monument in Edinburgh. 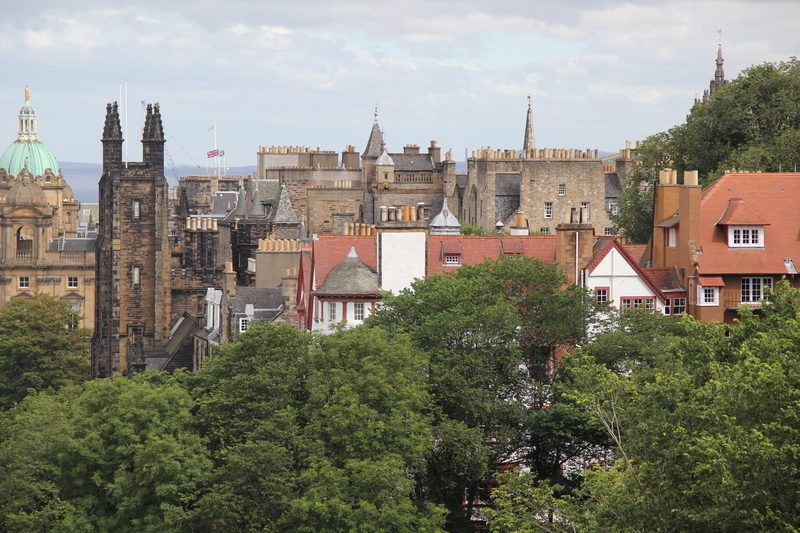 It’s hard to miss the gothic spire that defines Edinburgh’s skyline. 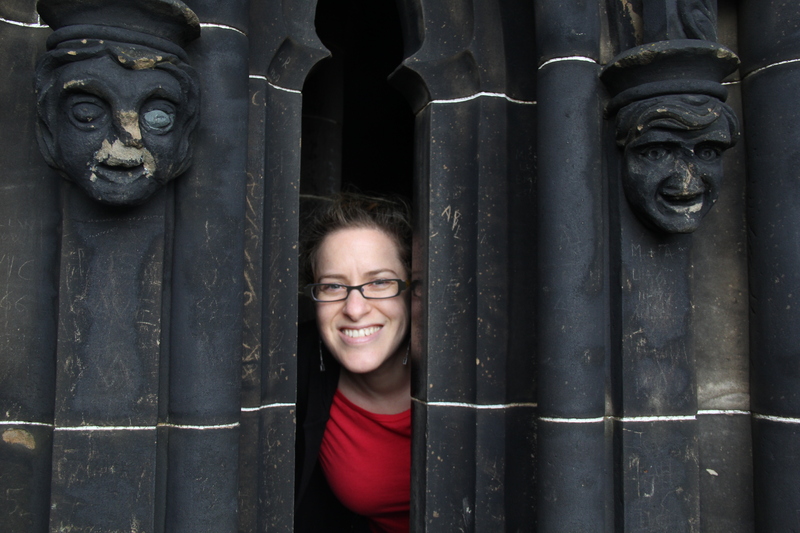 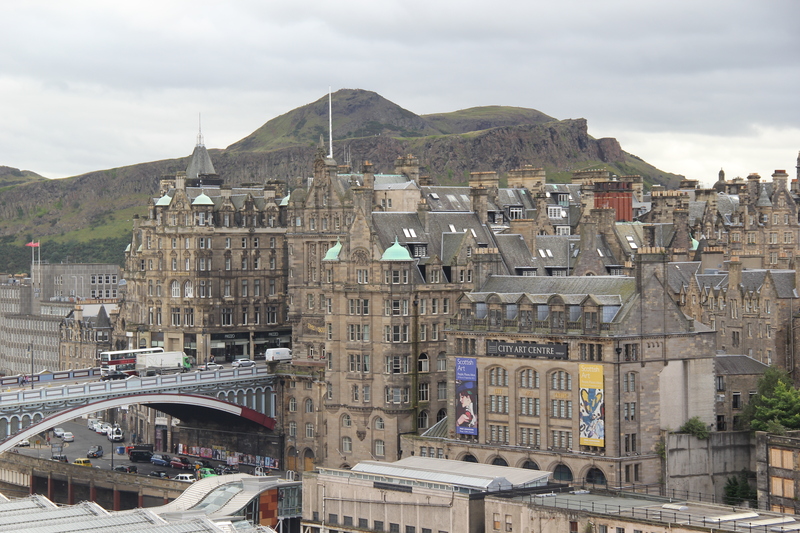 In 1858, Charles Dickens said, “I am sorry to report the Scott Monument a failure. 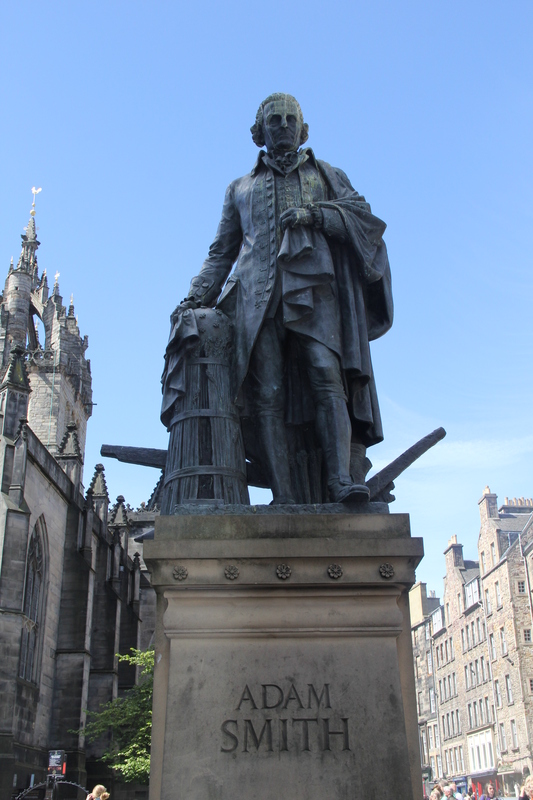 It is like the spire of a Gothic church taken off and stuck in the ground.” Love it of hate it, the man for whom the monument is built – Sir Walter Scott – is beloved in Scotland. 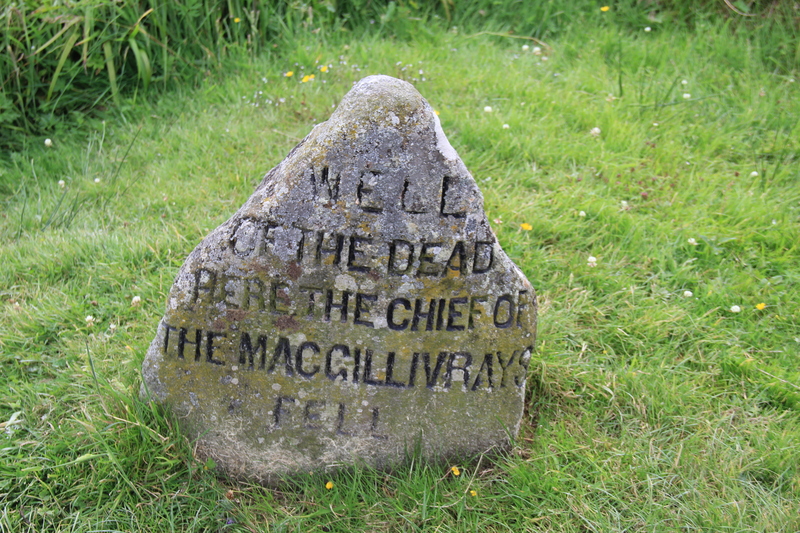 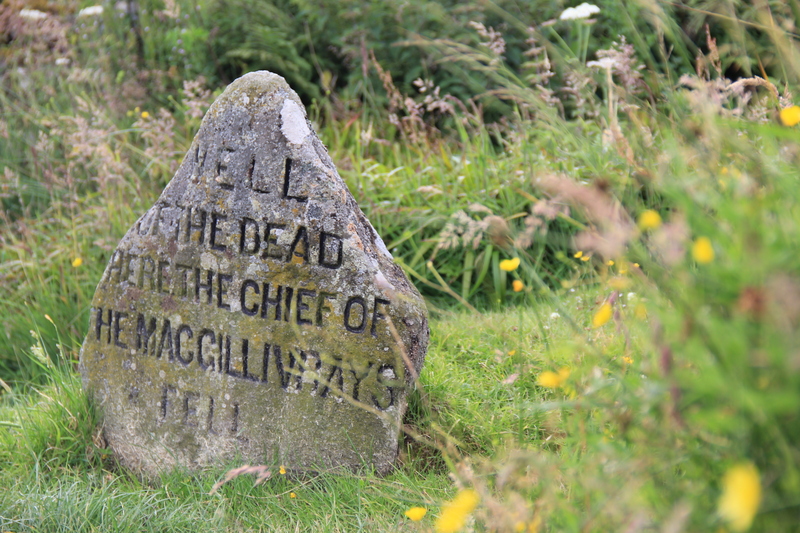 His Waverly novels celebrate Scotland’s rebellious history and are credited with reviving Scottish pride. 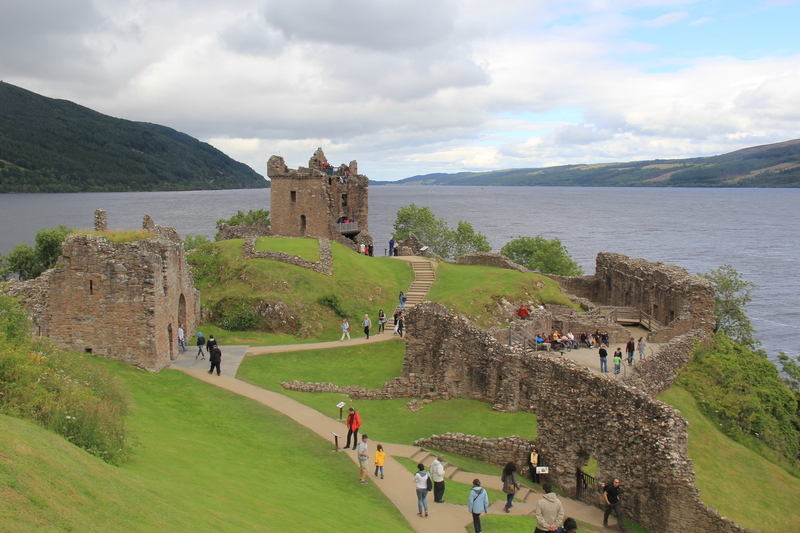 There are 287 steps to the highest platform, involving a narrow, slightly breathless climb. 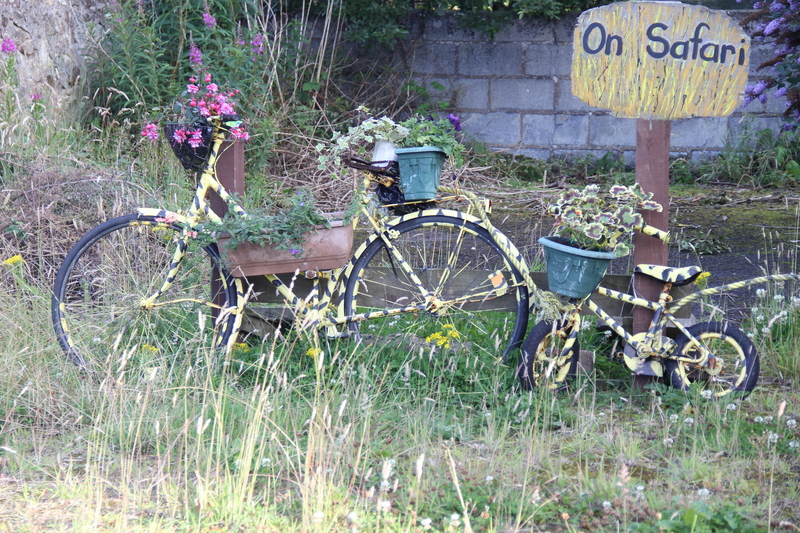 Luckily, there are plenty of opportunities to stop along the way and take pictures. 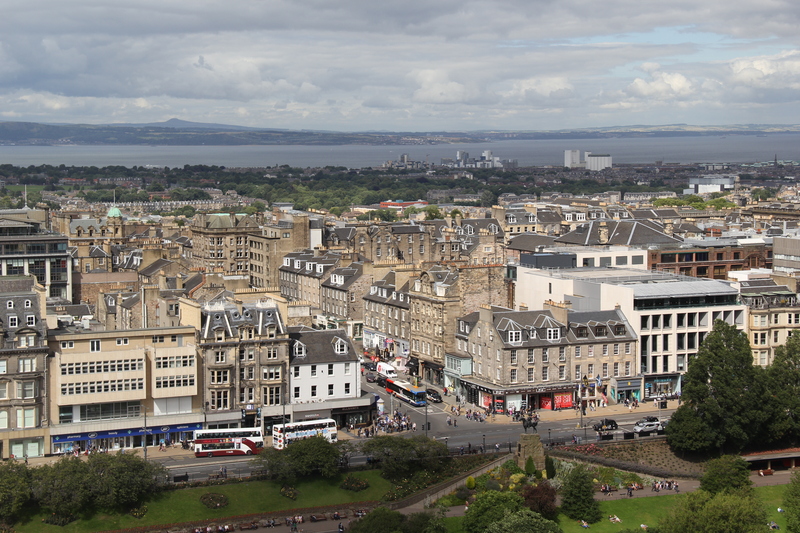 The view of the romantic Old Town and Arthur’s Seat from Scott Monument. 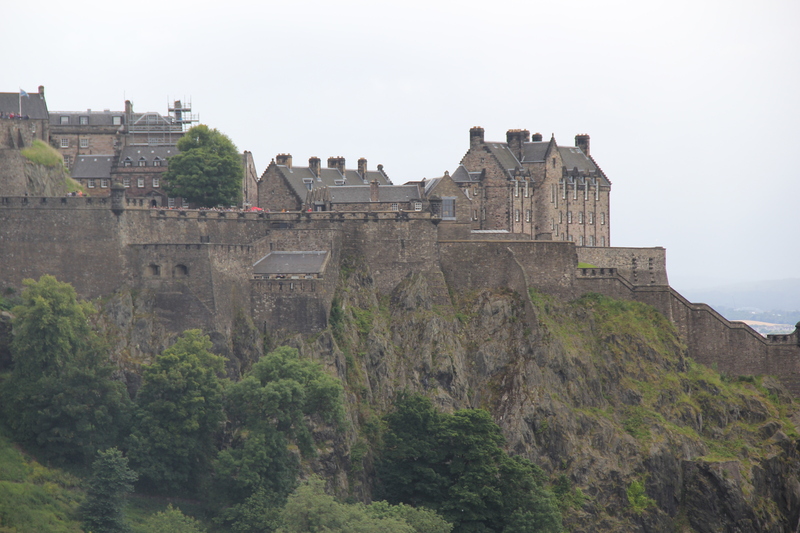 Facing west, you can’t miss Edinburgh Castle. 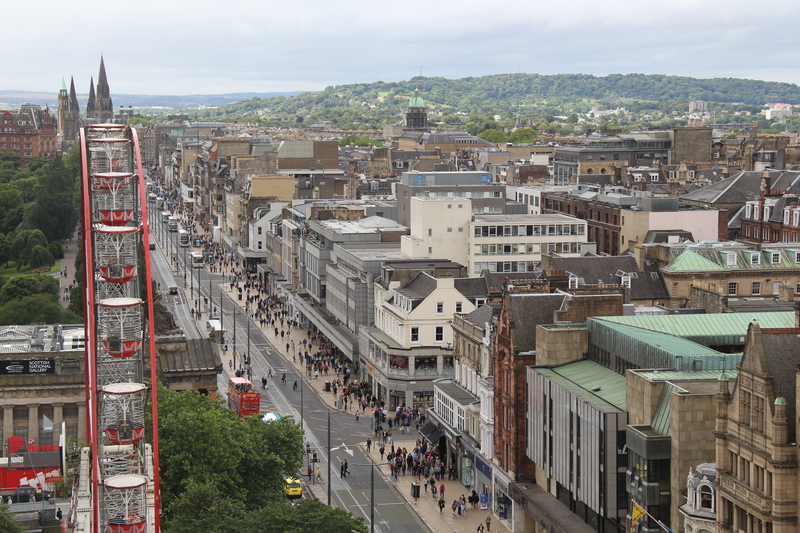 We had a great view of Princess Street, the wide boulevard bordering the New Town on the south. 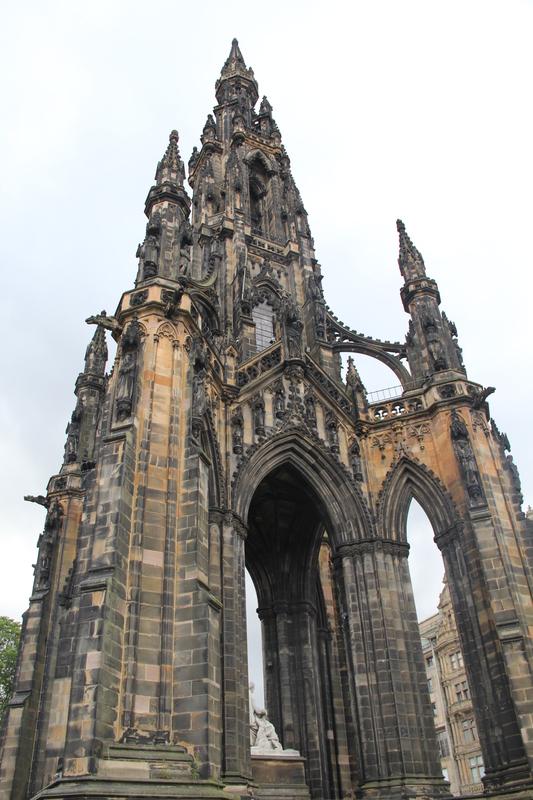 Scott Monument is located in Princess Street Gardens, a pretty patch of greenery where Scotts relax, stroll and hang out. 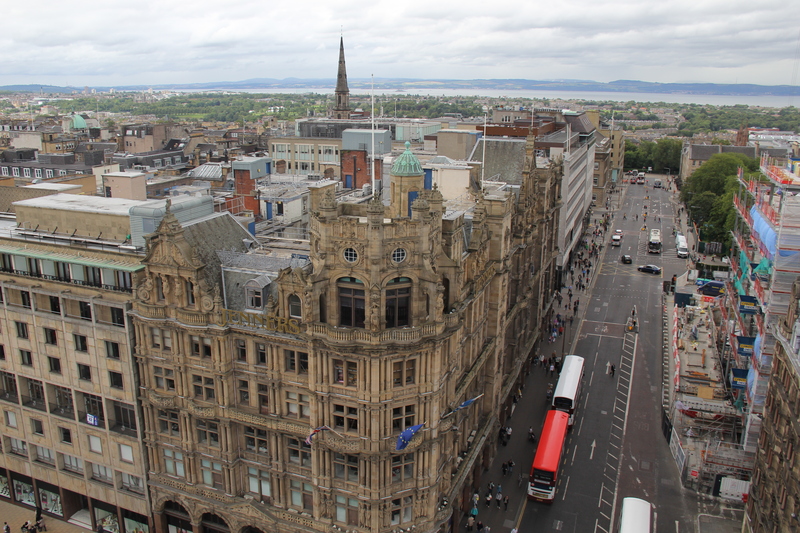 Jenners is the largest and oldest department store in Edinburgh – the Macy’s of Scotland. 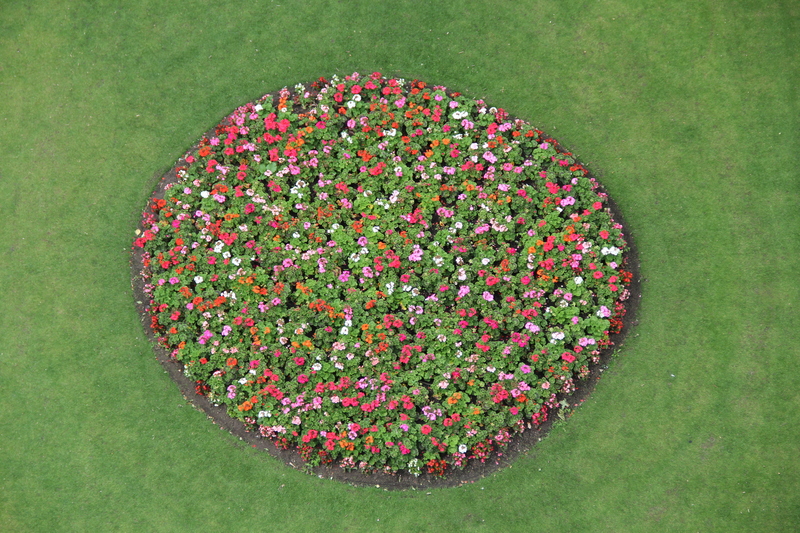 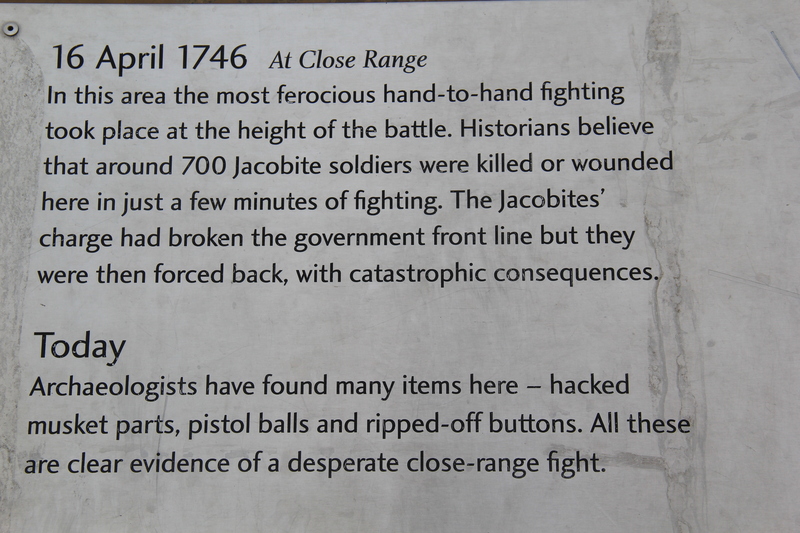 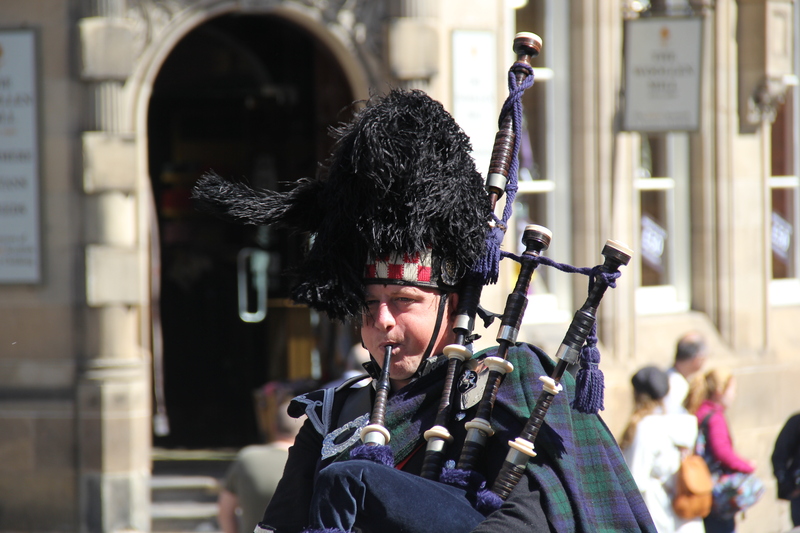 It’s located directly across the street from Scott Monument. 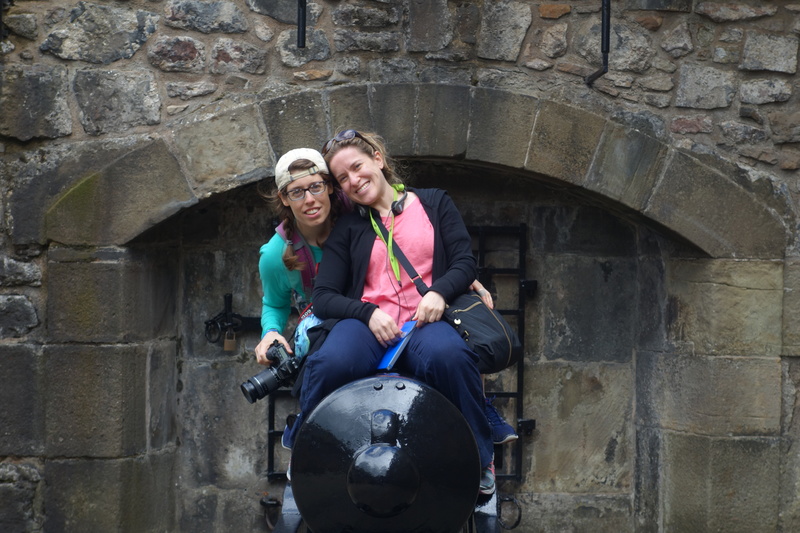 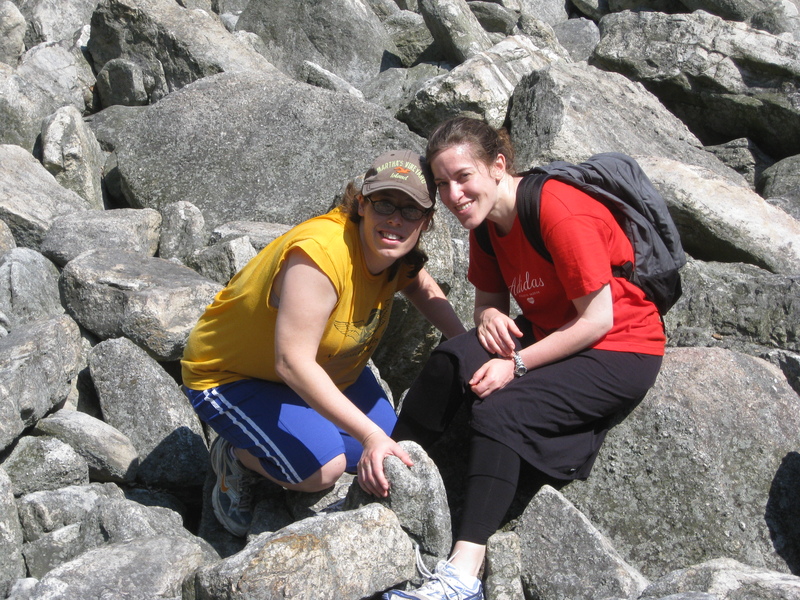 And of course, some requisite pictures of the Dynamic Duo! 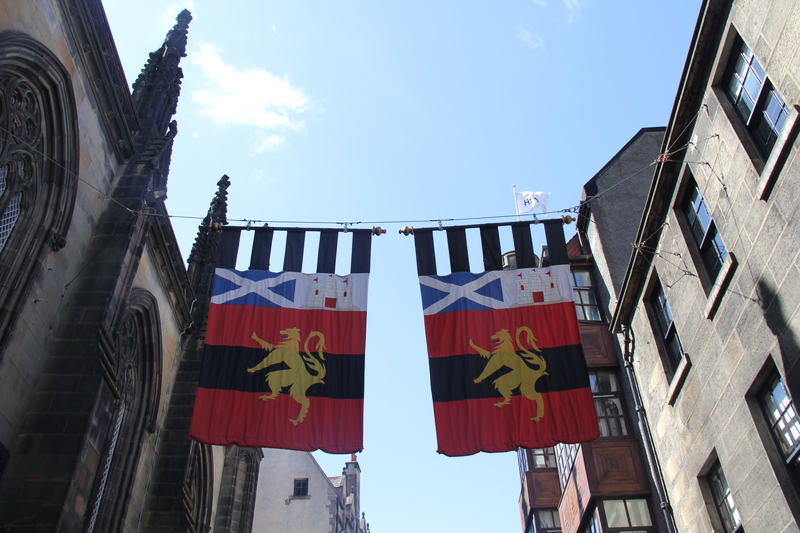 After Scott Monument we headed back to Old Town. 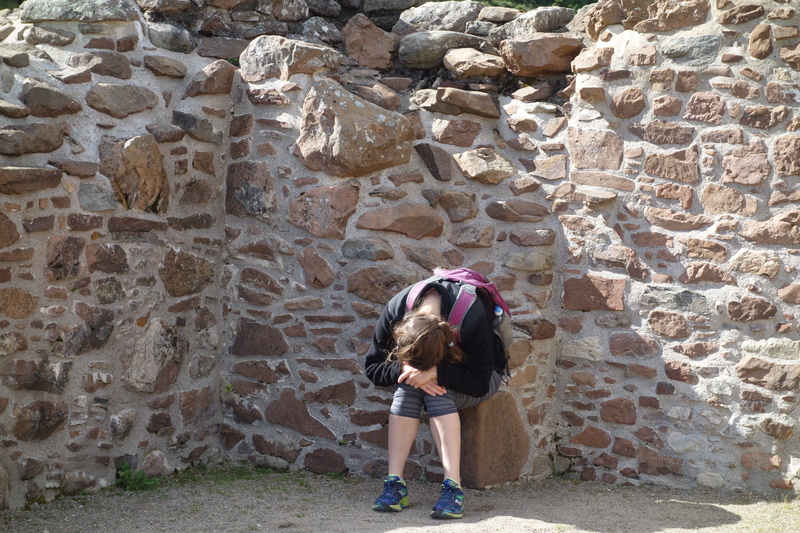 My scratchy throat and headache were starting to get the best of me. 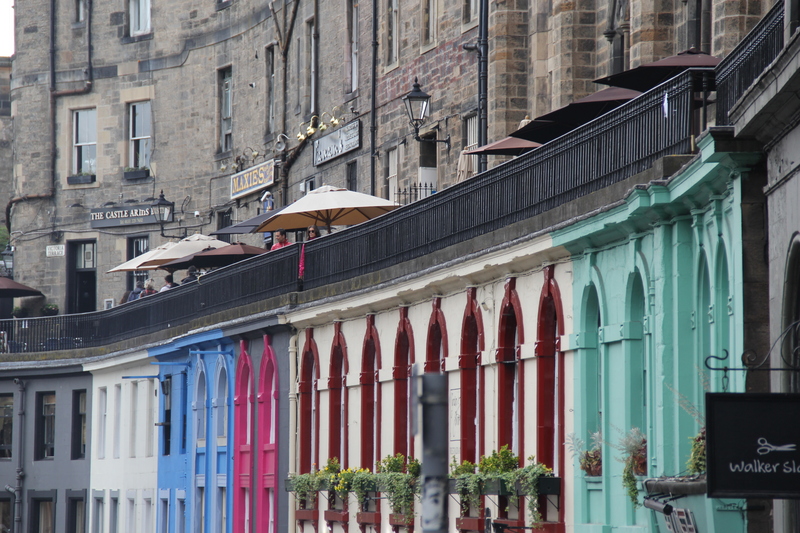 We discovered charming Victoria Street, not far from the University of Edinburgh, marked by cute cafes and colorful shops. 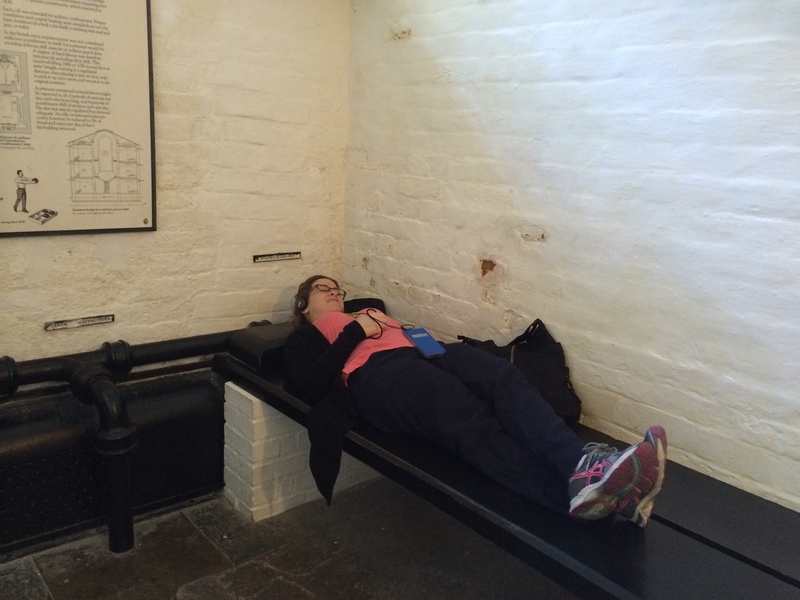 After that, it was back to the hotel for a nice, long nap. 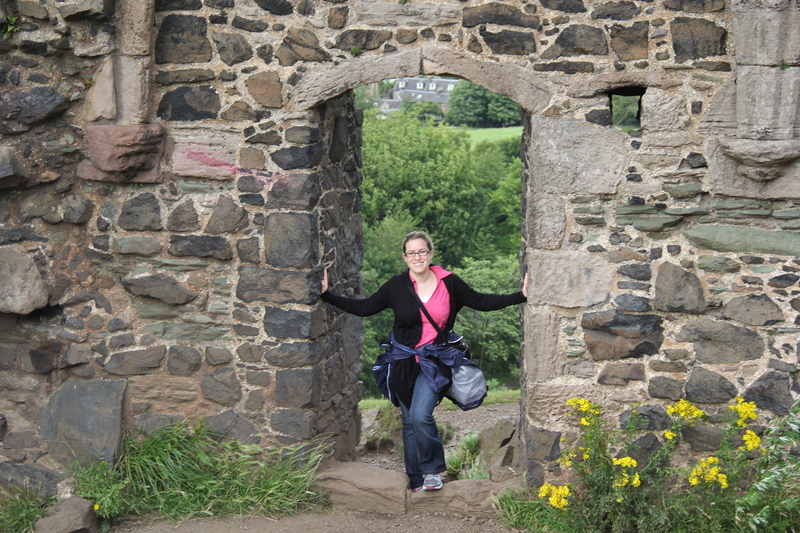 I could not have been happier. 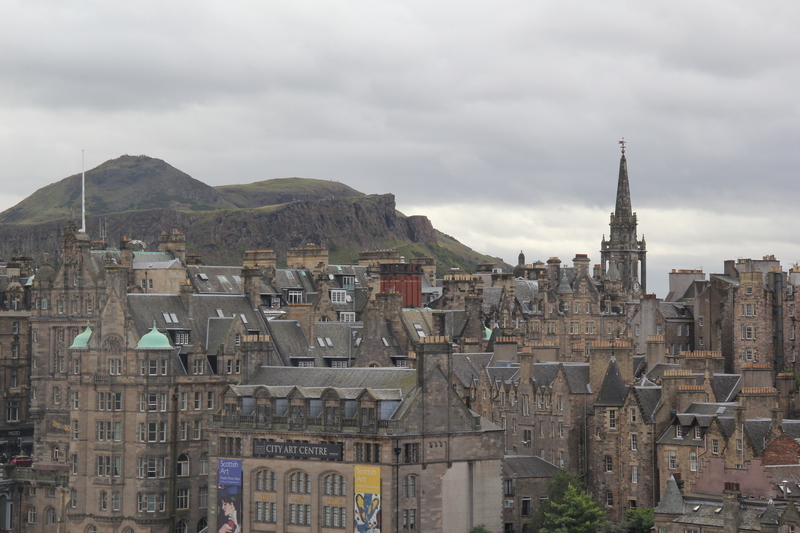 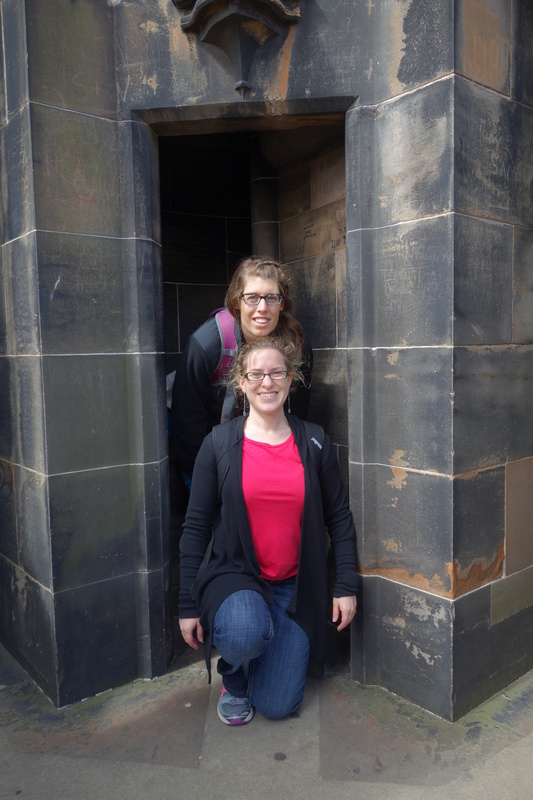 On our second day in Edinburgh, we headed east down the Royal Mile to explore the rest of Edinburgh’s famous street and climb Arthur’s Seat for its famous views of the city below. 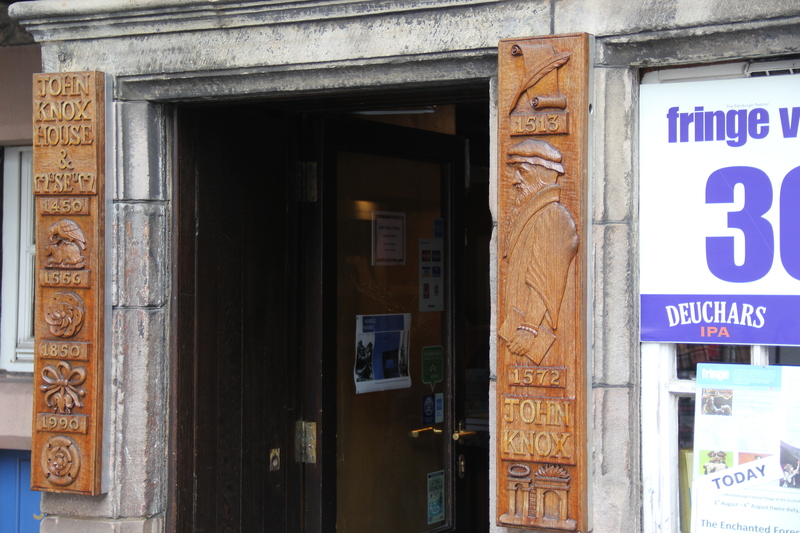 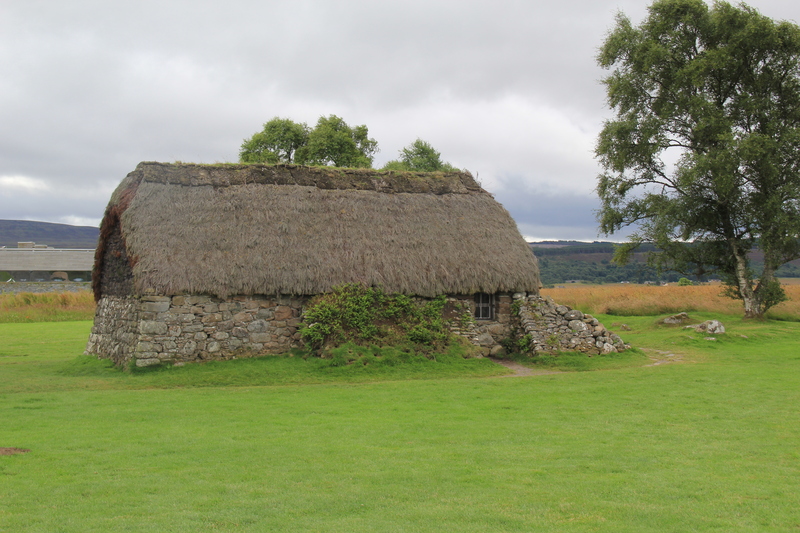 First up was John Knox’s house, or I should say, what is allegedly John Knox’s house. 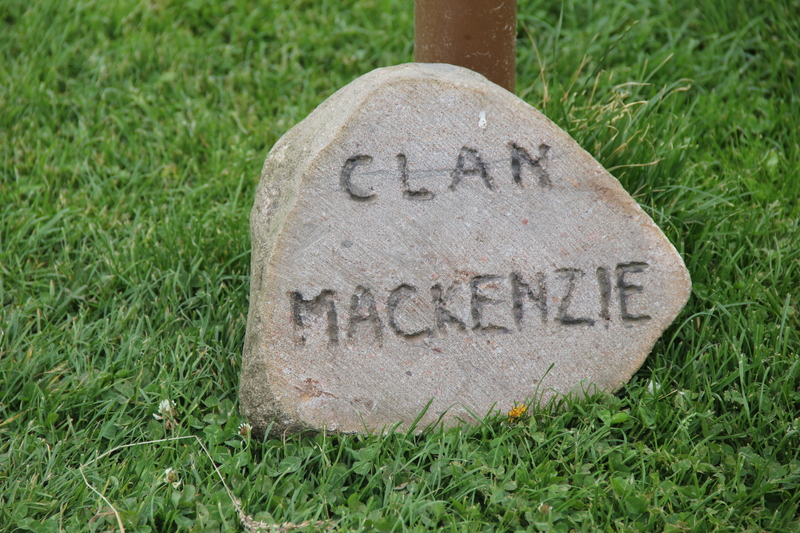 There is some evidence that his house was actually located in Warriston Close. 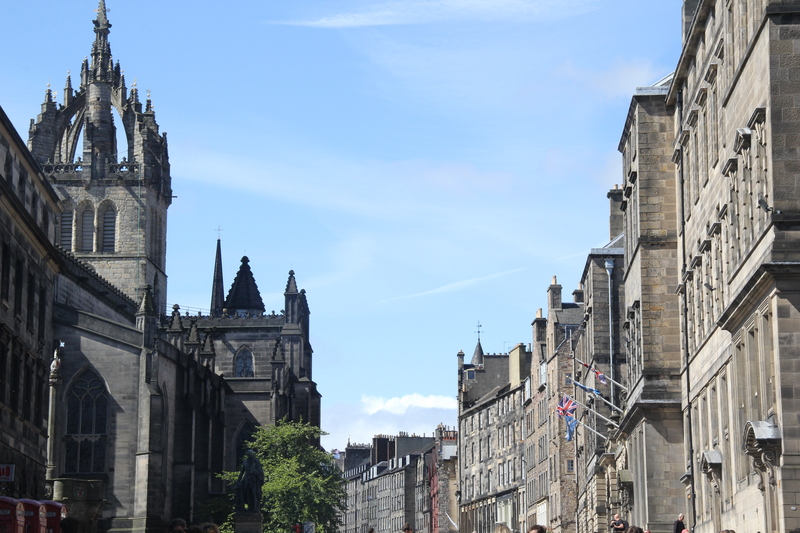 John Knox was a clergyman who played a major role in the Protestant Reformation in Scotland and is credited with founding the Presbyterian branch of Christianity. 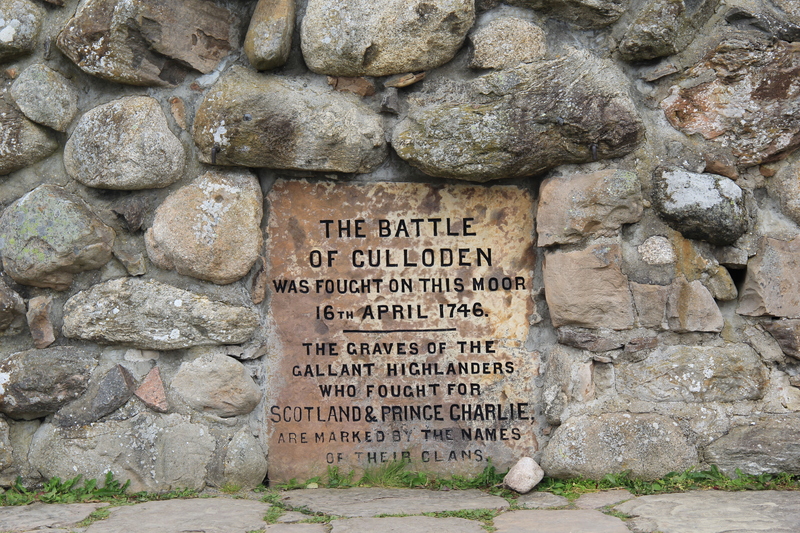 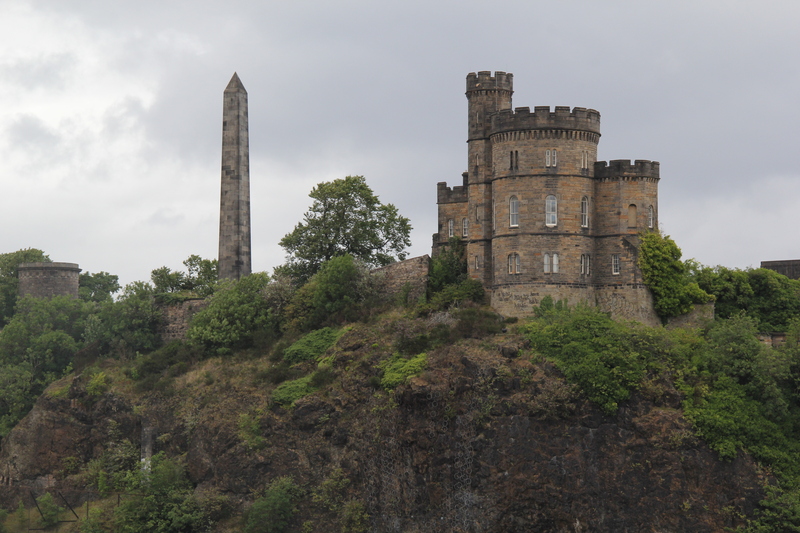 We stopped for some pretty views of Calton Hill, including the Political Martyrs’ Monument, erected in honor of five reformers who were imprisoned for advocating for parliamentary reforms. 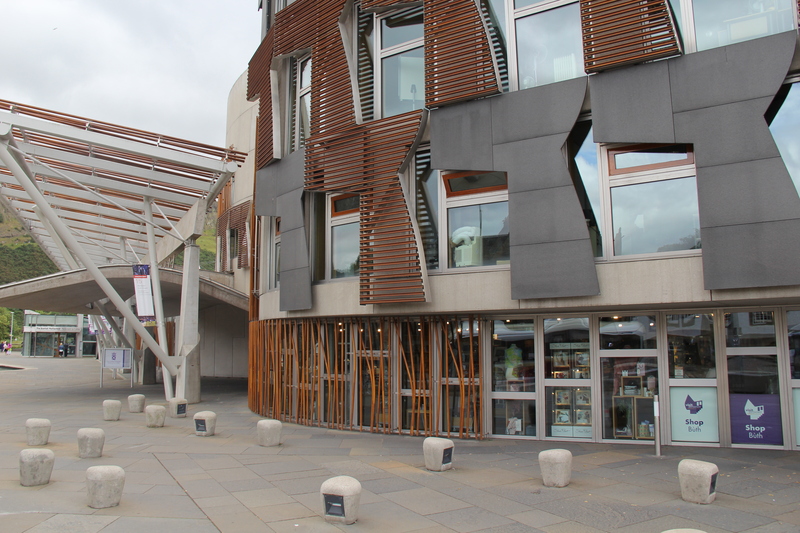 Next up was Scotland’s new parliament. 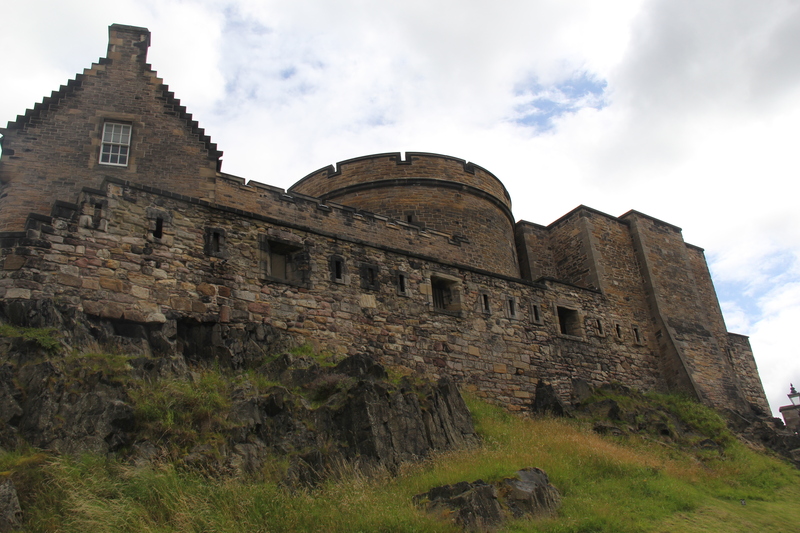 For centuries, Scotland had its own parliament located in Parliament House in the Old Town – a building that now houses the Supreme Courts of Scotland. 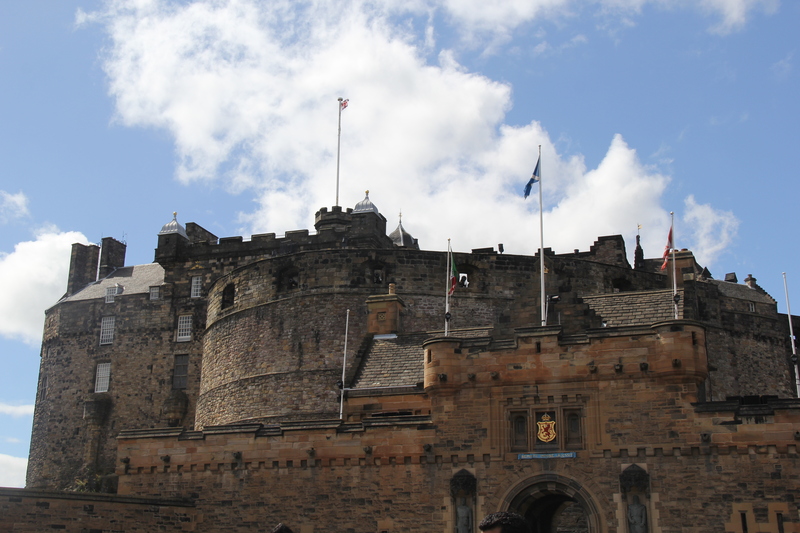 With the Treaty of Union in 1707, Scotland and England were united under the banner of Great Britain, and the Parliament of Scotland ceased to exist. 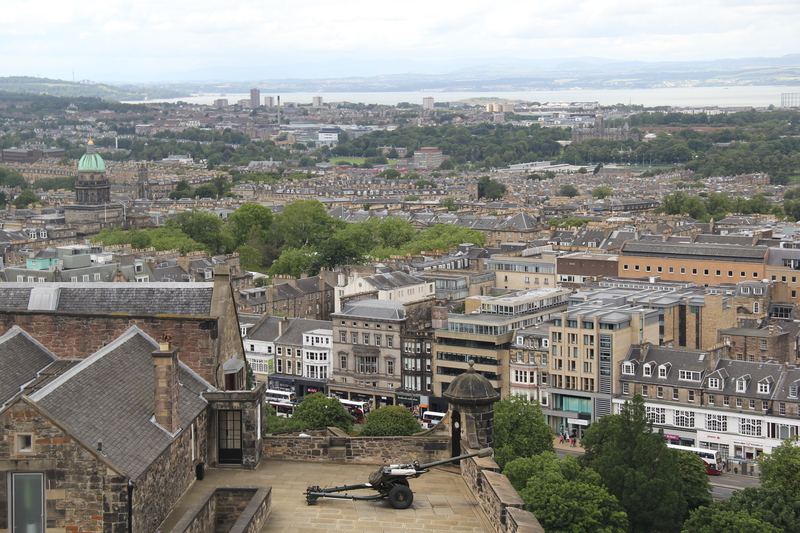 As the rumblings of independence grew in throughout the past couple of decades, Scots clamored for more political control. 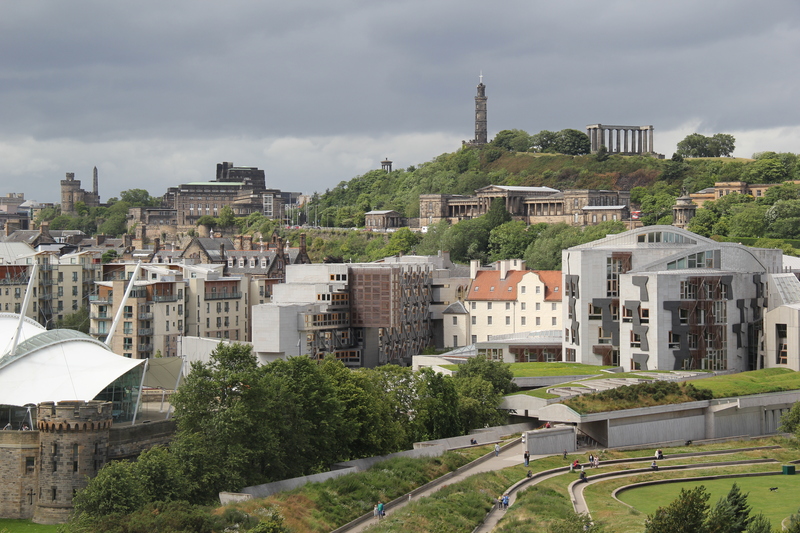 In 1978, the United Kingdom Parliament passed the Scotland Act of 1978, but the proposed assembly failed to garner the required percentage in a public referendum. 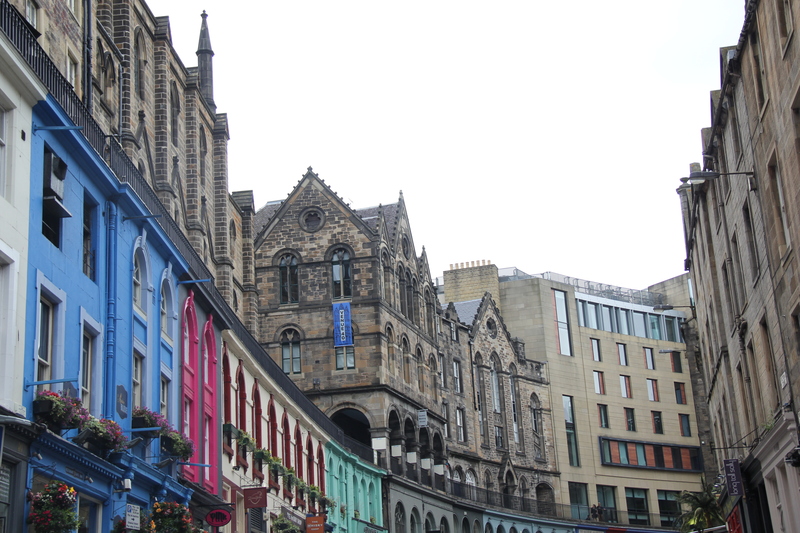 Finally, in 1997, the Scottish public approved an elected parliament in Edinburgh. 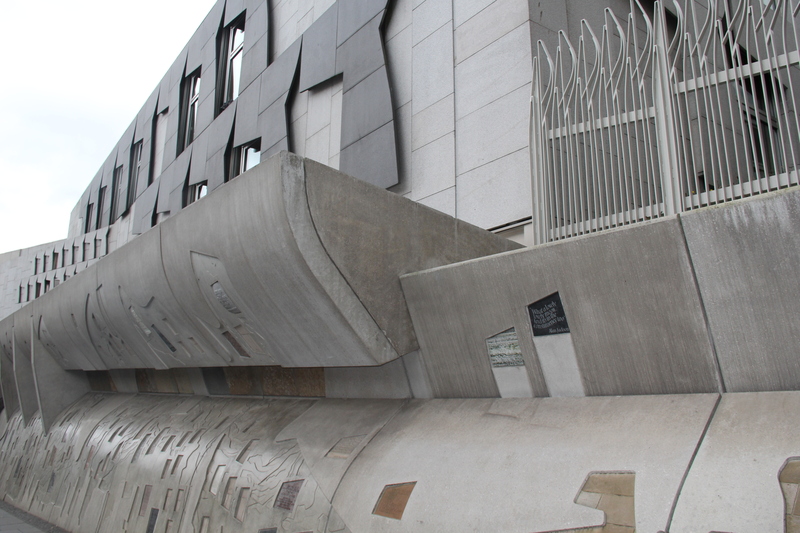 The modern, new Parliament building was built in 2004 on the eastern end of the Royal Mile – also known as the Holyrood neighborhood in reference to the Holyrood Palace located across the street. 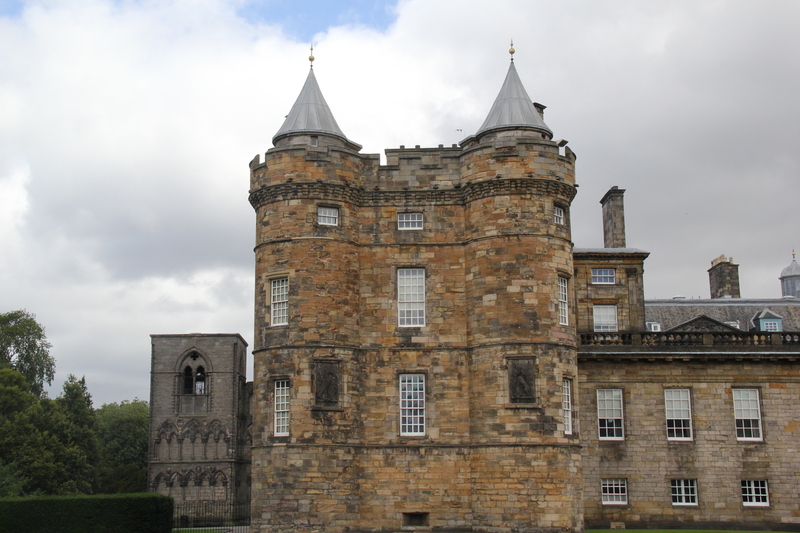 Today, Holyrood Palace is the official residence of the British monarchy in Scotland and served as the residence for the Sottish monarchy back in the day, including Mary, Queen of Scots. 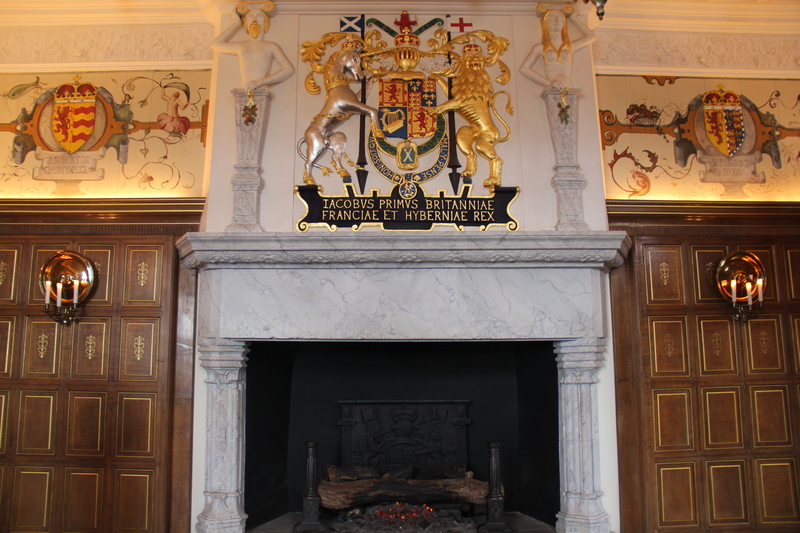 The palace is open to tours aside from the one week Queen Elizabeth spends at the palace at the beginning of every summer. 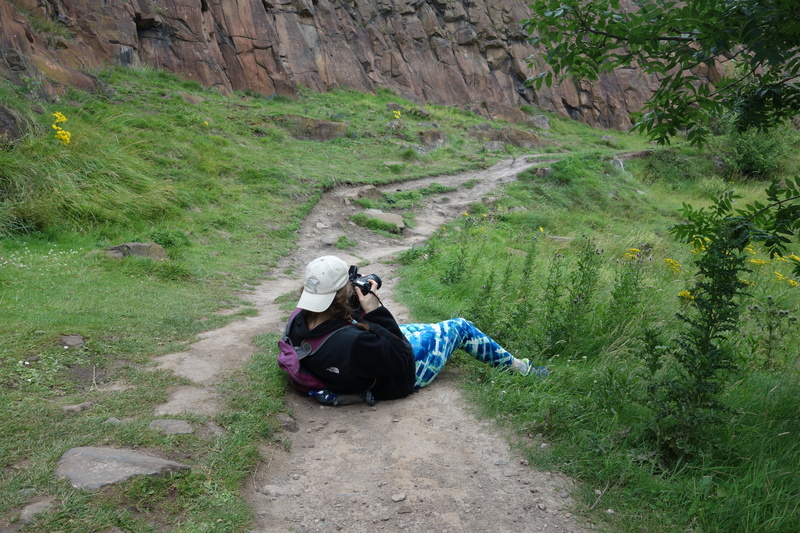 We meandered through Holyrood Park where we took way too many pictures and I attempted to be one of those people who takes yoga pictures in awesome locations around the world. 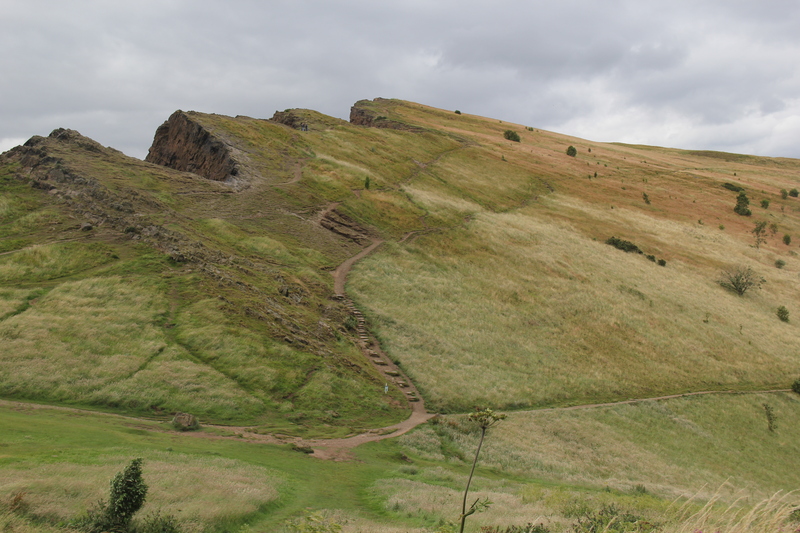 Finally, we began our hike up the mountain up towards Arthur’s seat. 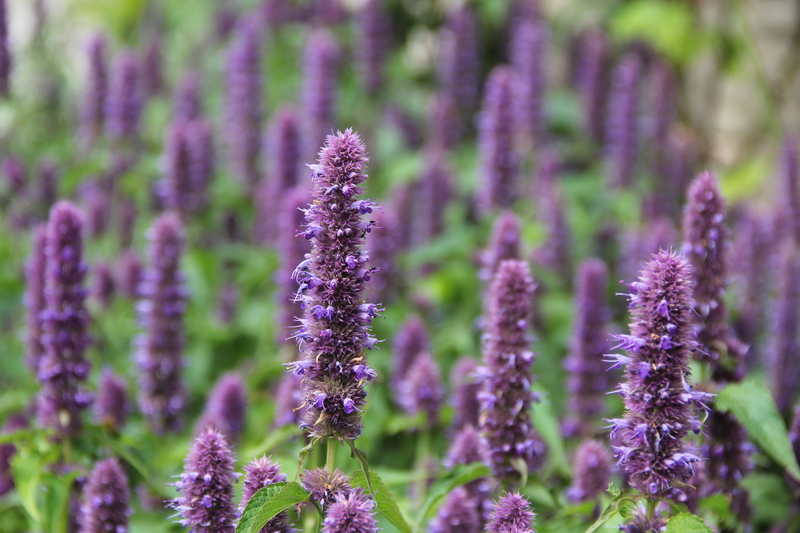 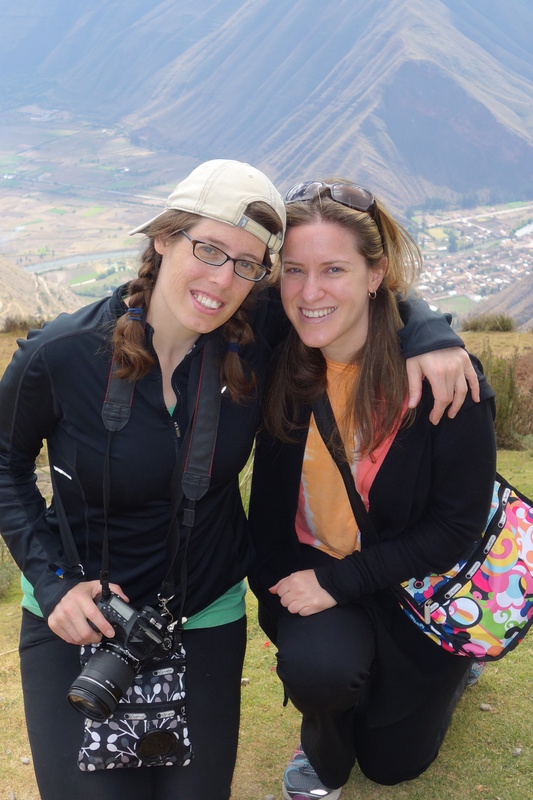 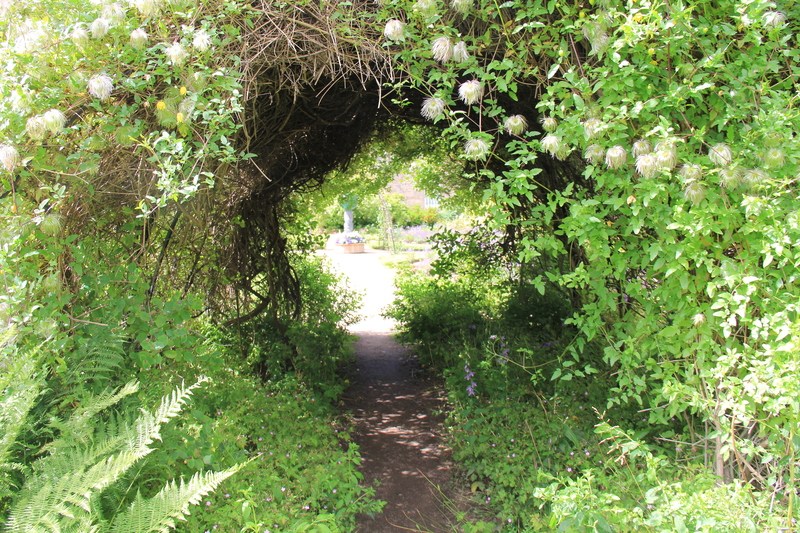 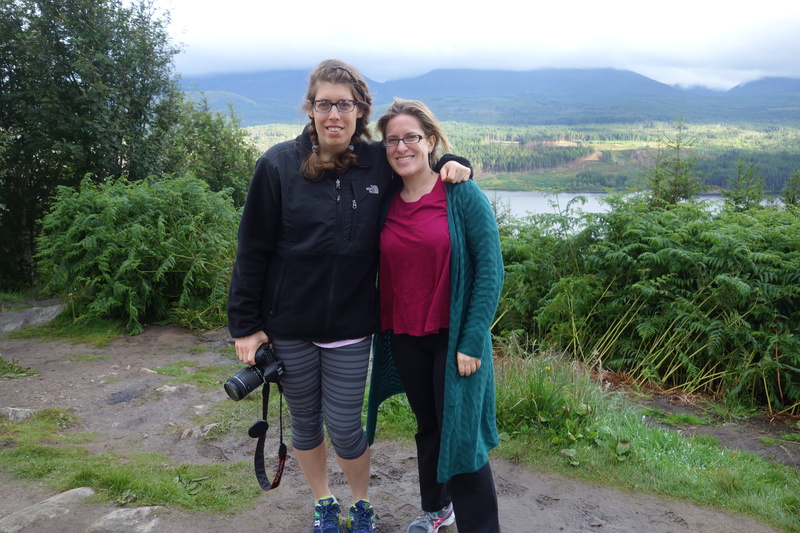 At some point, it became abundantly clear that we had taken the scenic route – and by that I mean we went completely out of our way. 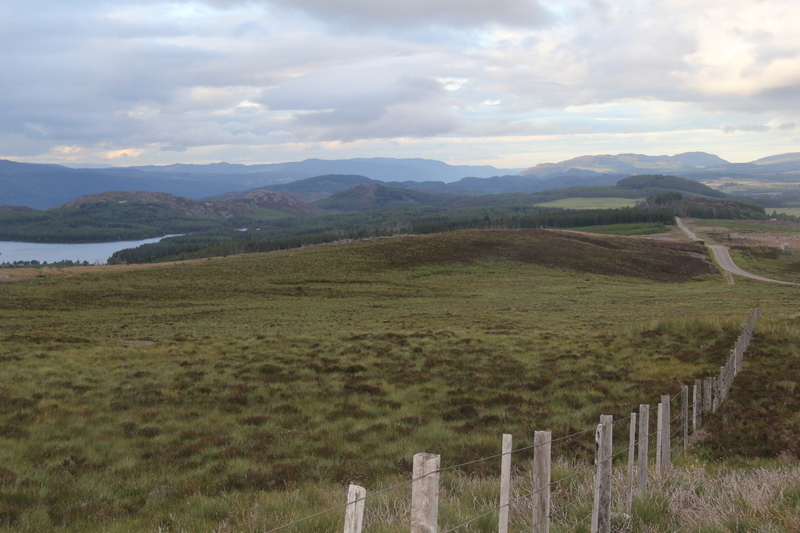 But the views were beautiful so no complaints here. 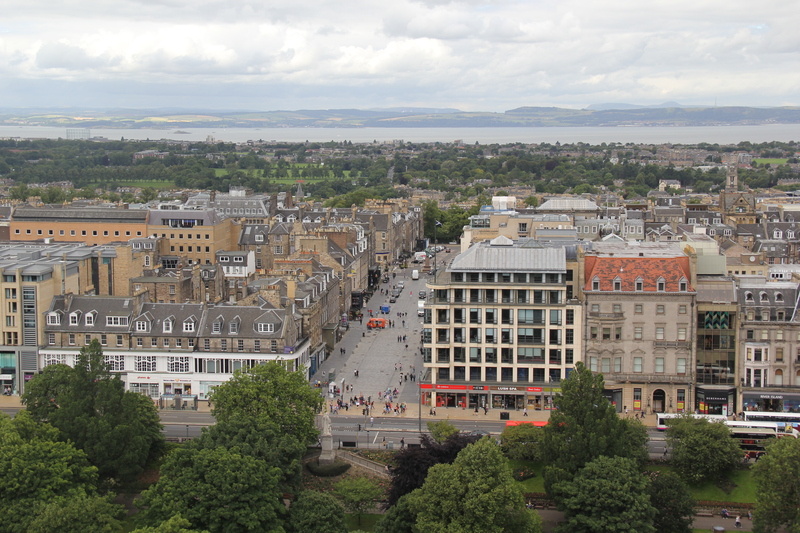 Here we are looking down on Parliament, with views of Calton Hill and Nelson Monument. 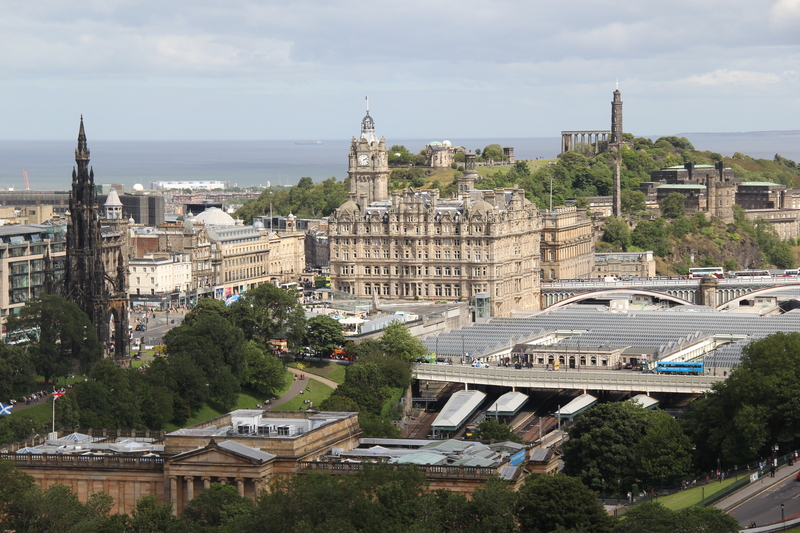 Below is a view of Calton Hill with the Nelson Monument and the National Monument of Scotland poking out. 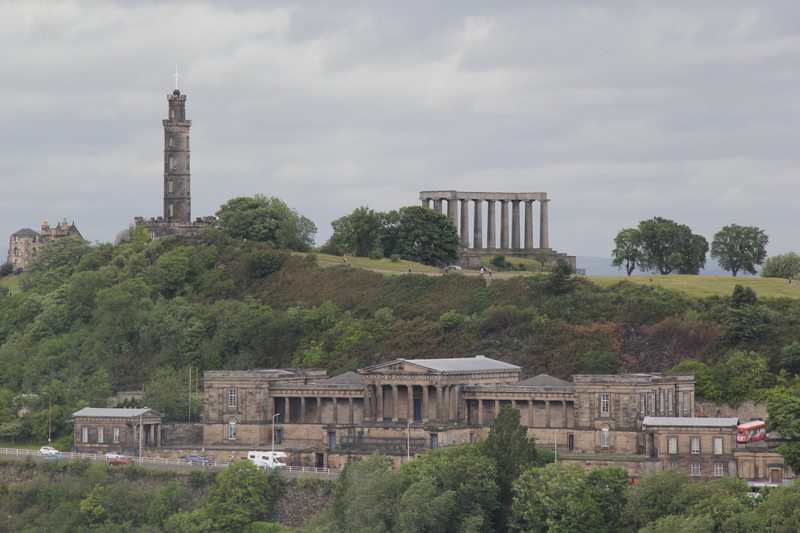 The Royal High School is located just beneath Calton Hill. 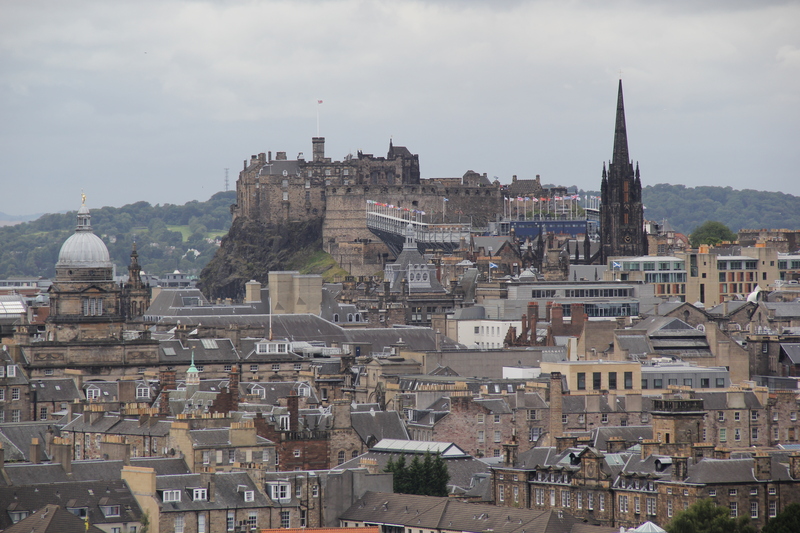 Founded in 1128, the Royal High School is one of the oldest schools in the world. 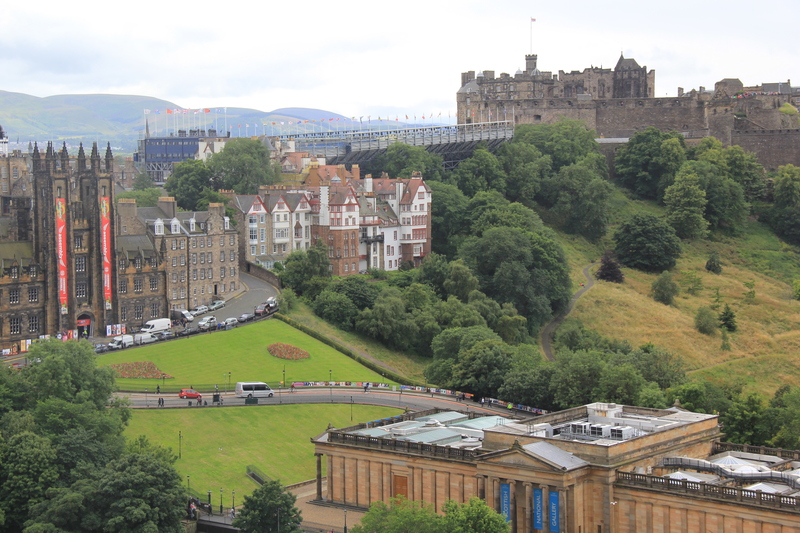 As we climbed higher and turned westward, we could make out Edinburgh’s Old Town, Scott Monument, and Edinburgh Castle. 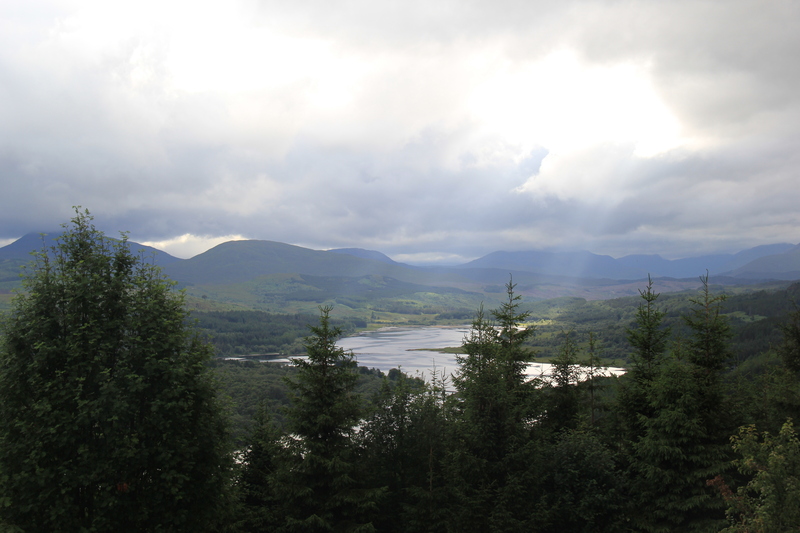 The higher we climbed, the more beautiful the scenery got. 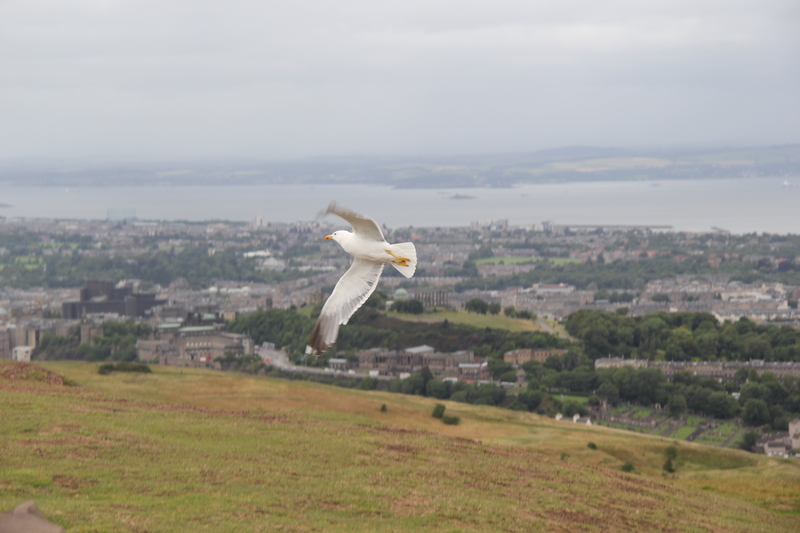 And the more pictures I took. 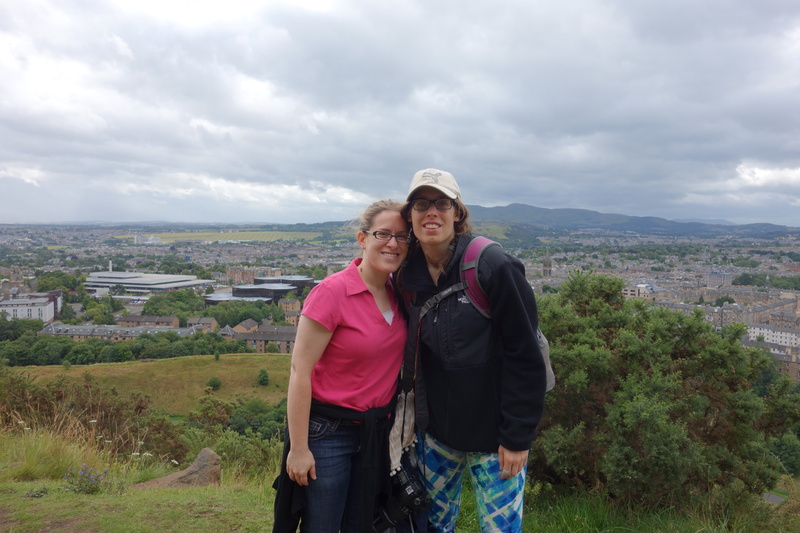 Finally, we got to the top of Arthur’s Seat. 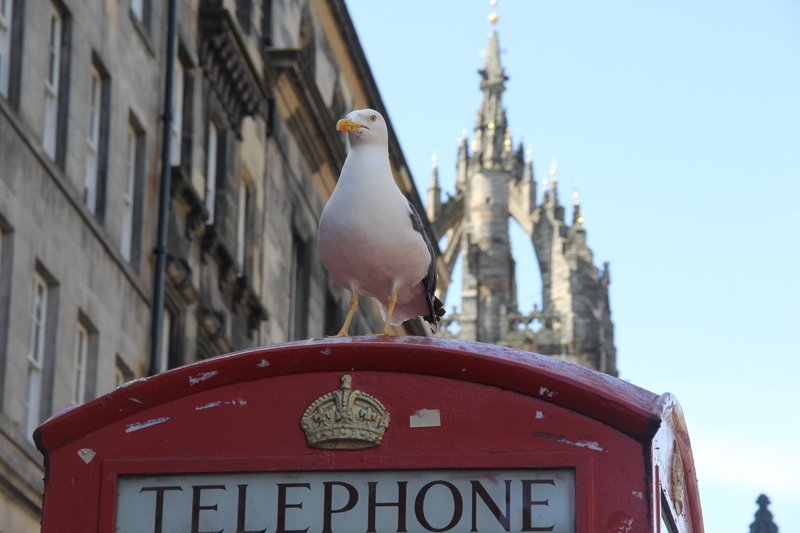 I was mildly obsessed with this bird. 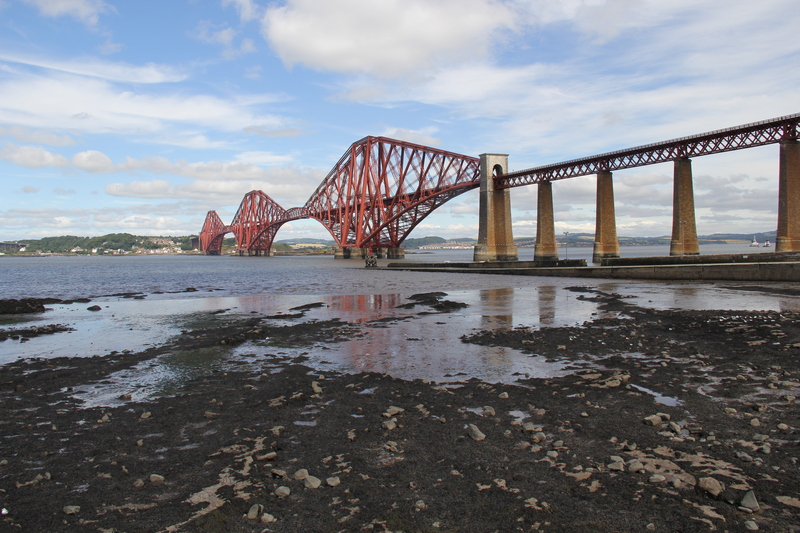 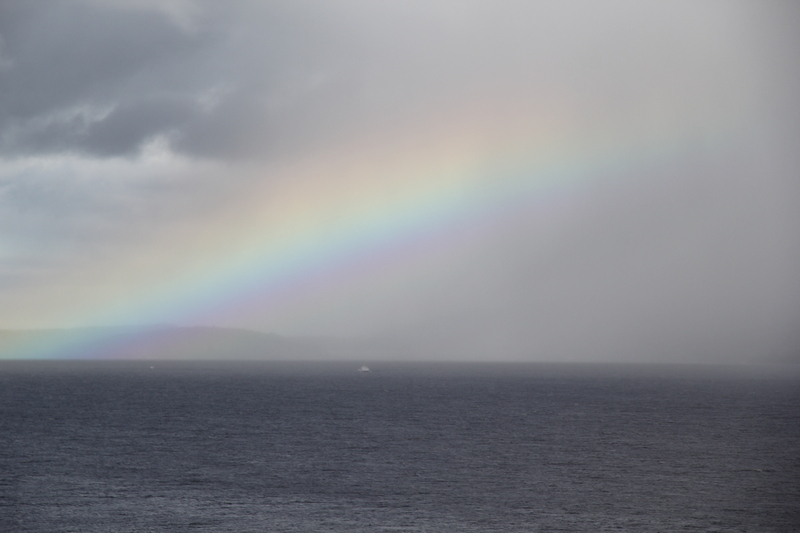 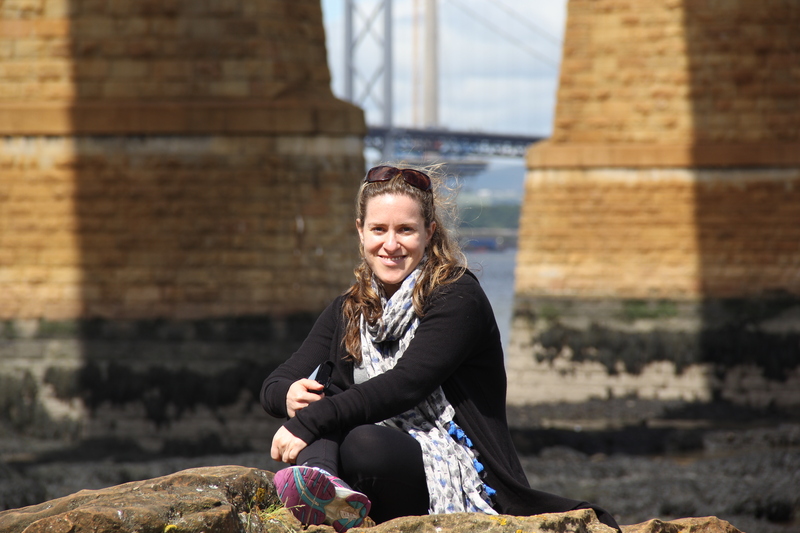 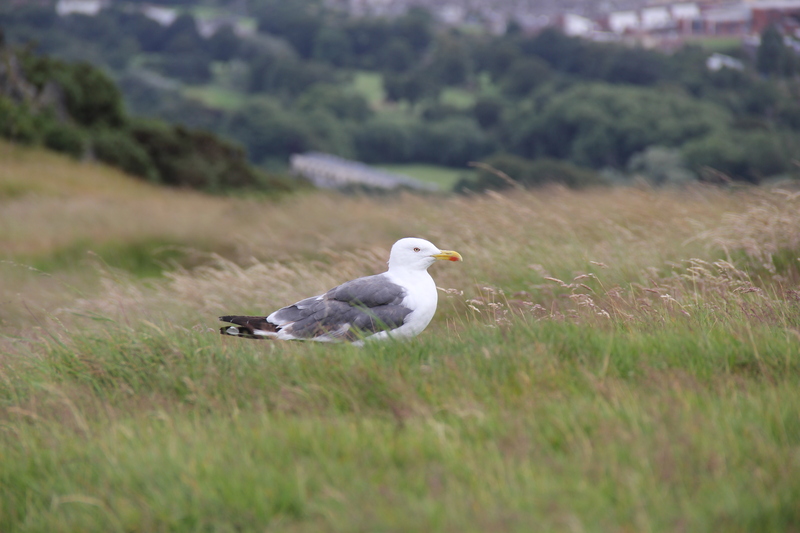 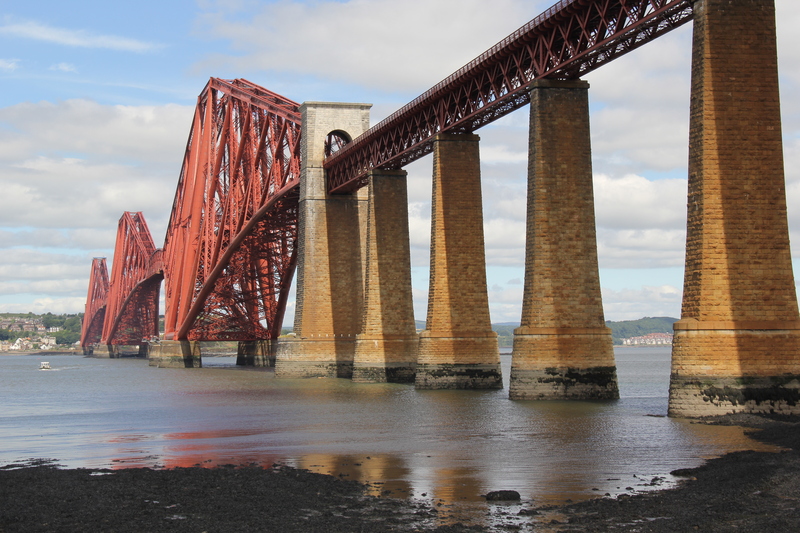 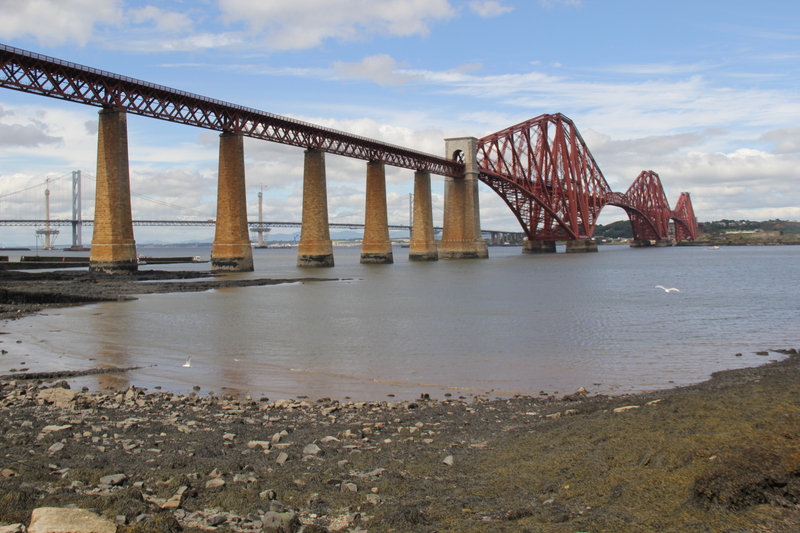 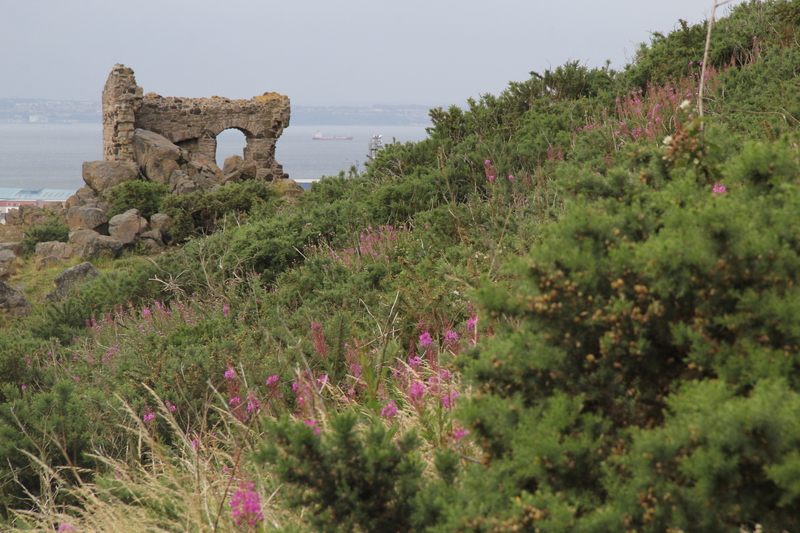 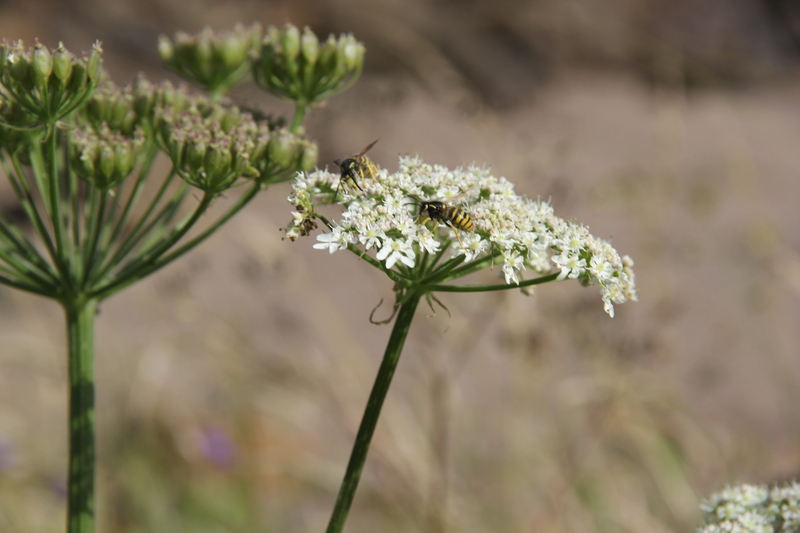 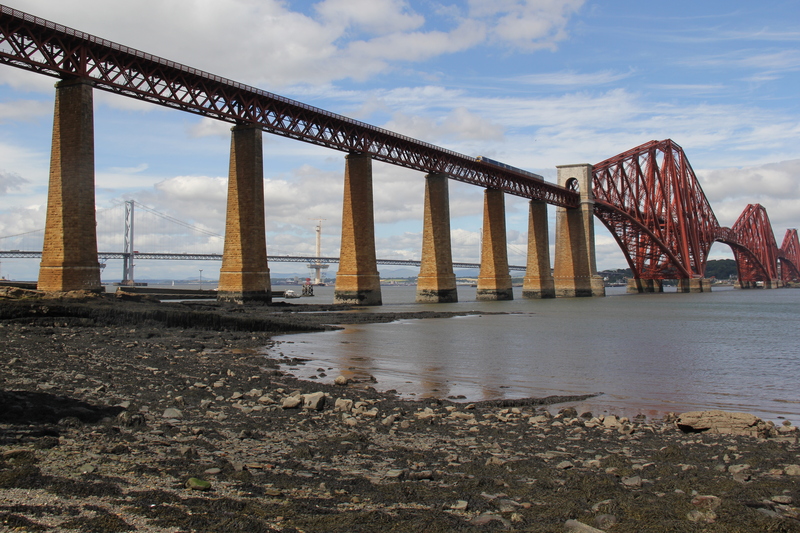 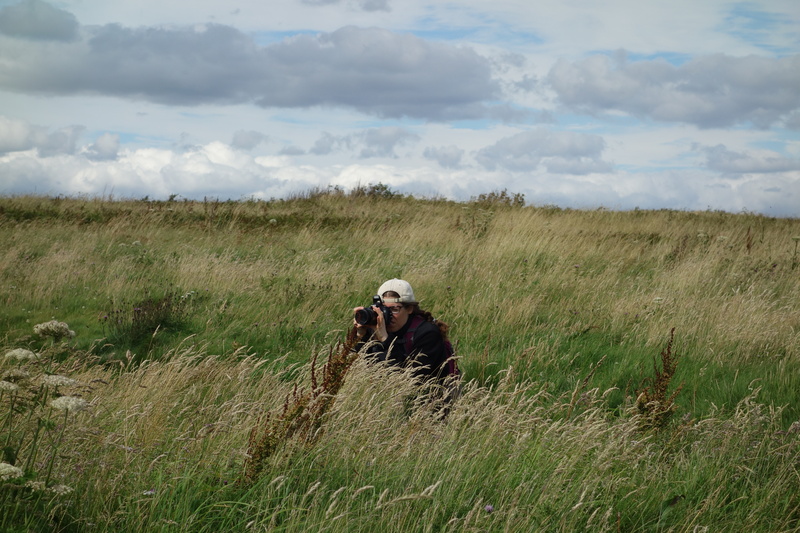 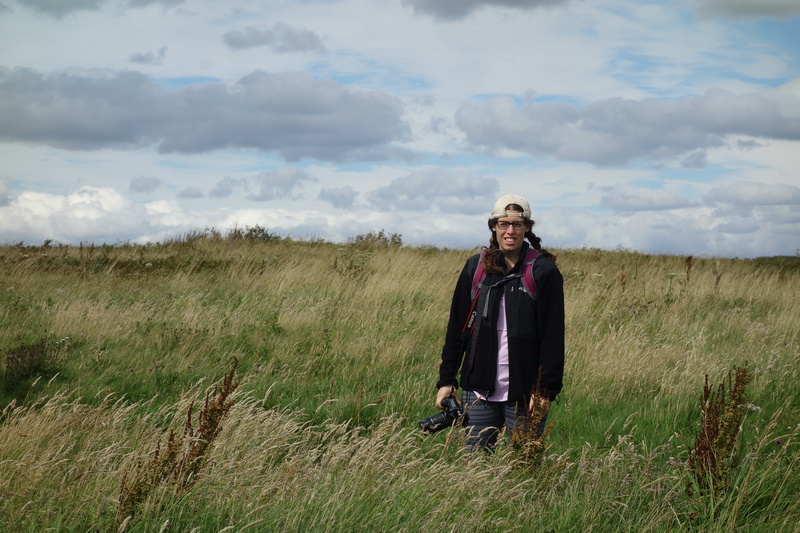 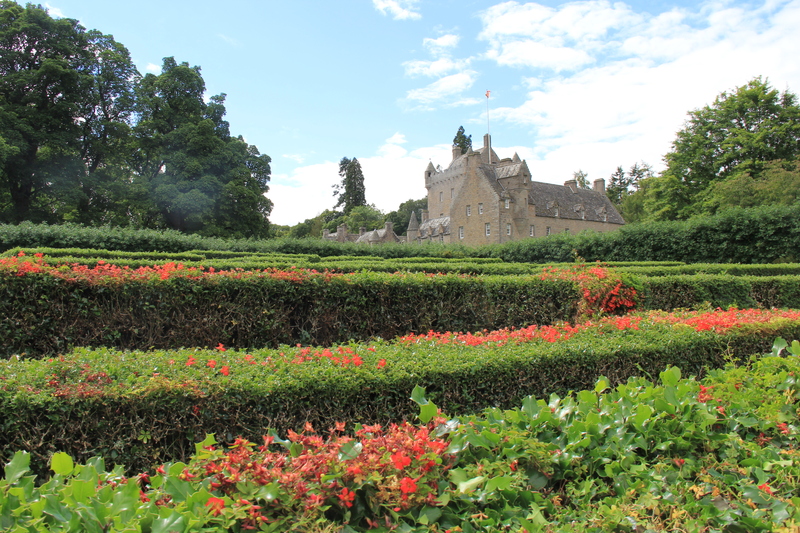 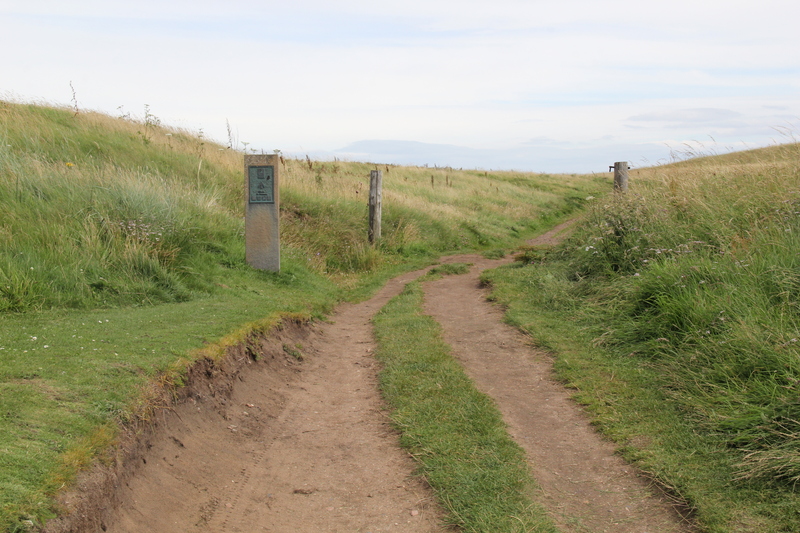 We headed down – on the path we should have taken up – reveling in the views of the Firth of Forth. 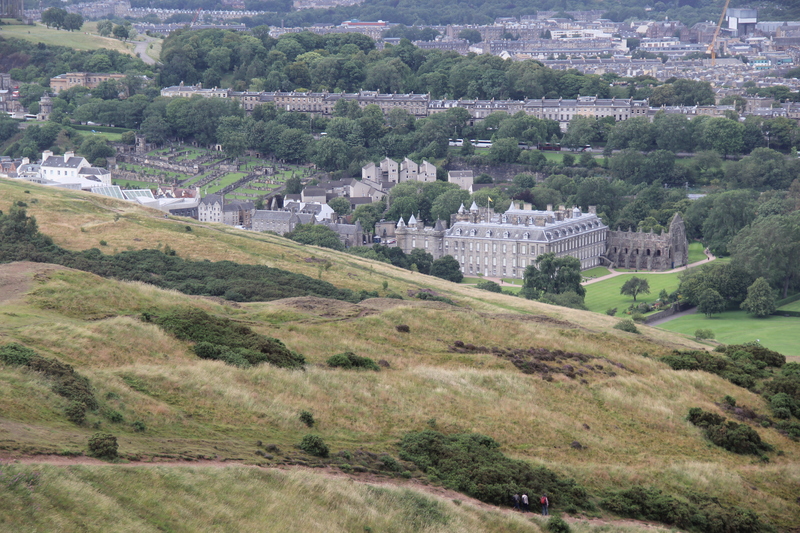 We also had some pretty views of Holyrood Palace from above. 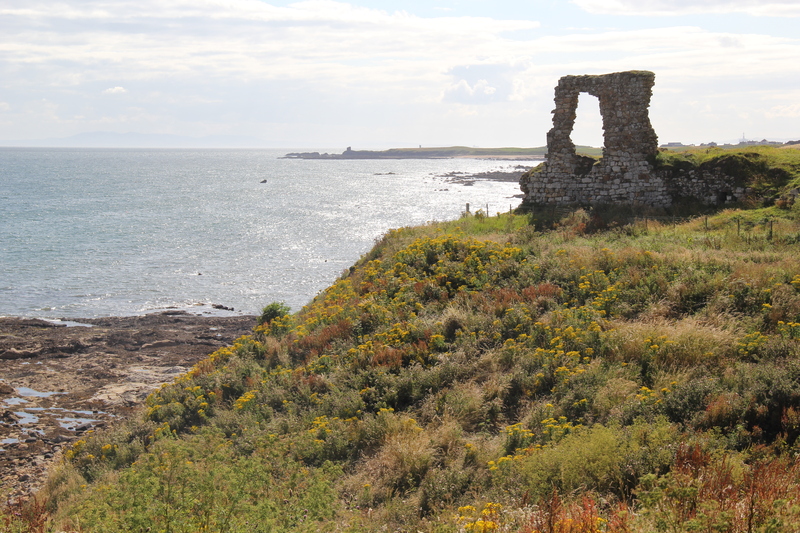 At the bottom of the trail, we came upon the ruins of St. Anthony’s Chapel. 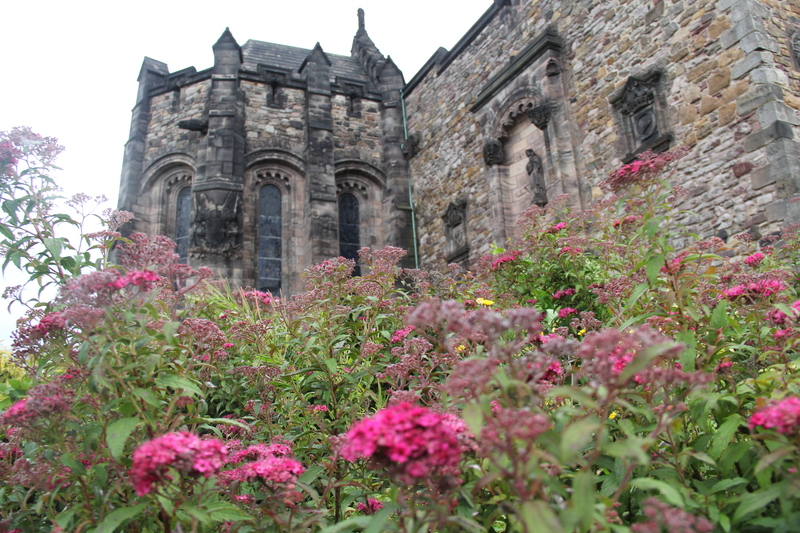 Little is known about the chapel, though it is thought to be associated with the Holyrood Abbey. 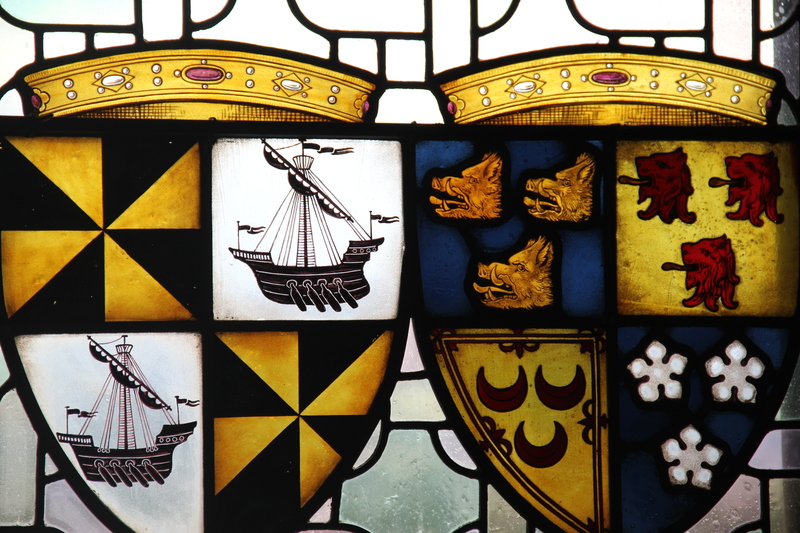 Wikipedia dates the chapel to the 15th century, but I also saw reference to the 1300s. 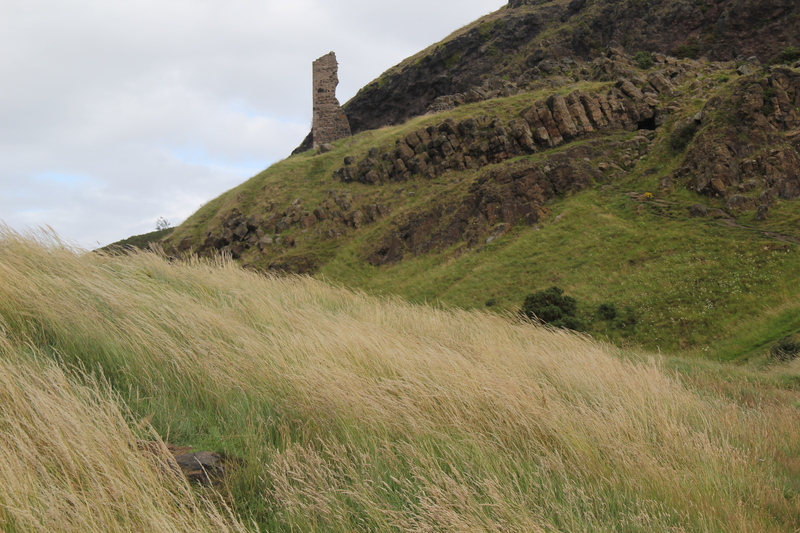 The chapel fell into disrepair after the Reformation in 1560. 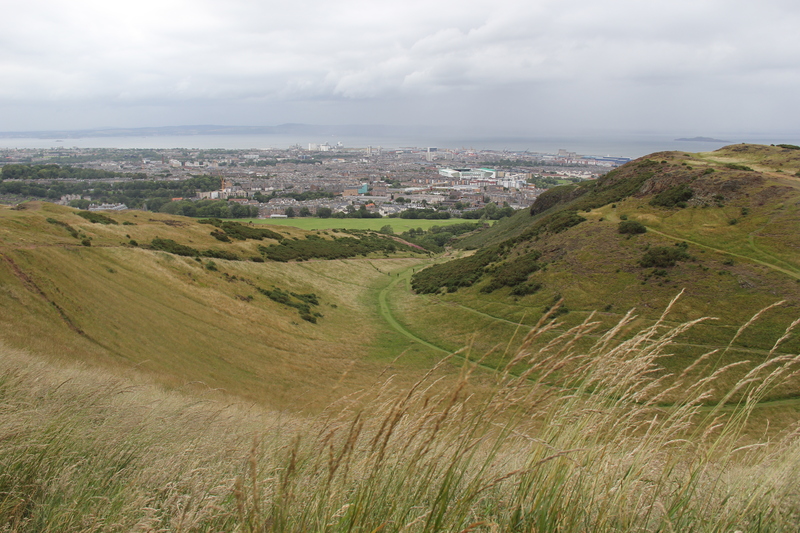 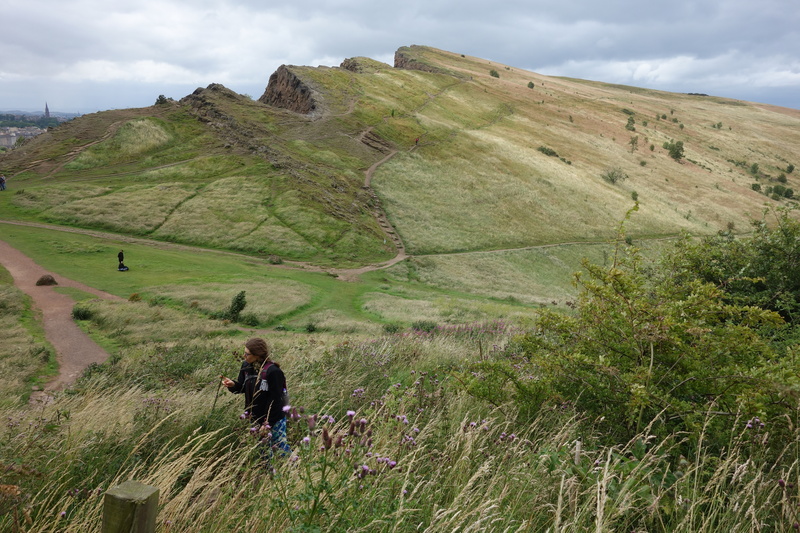 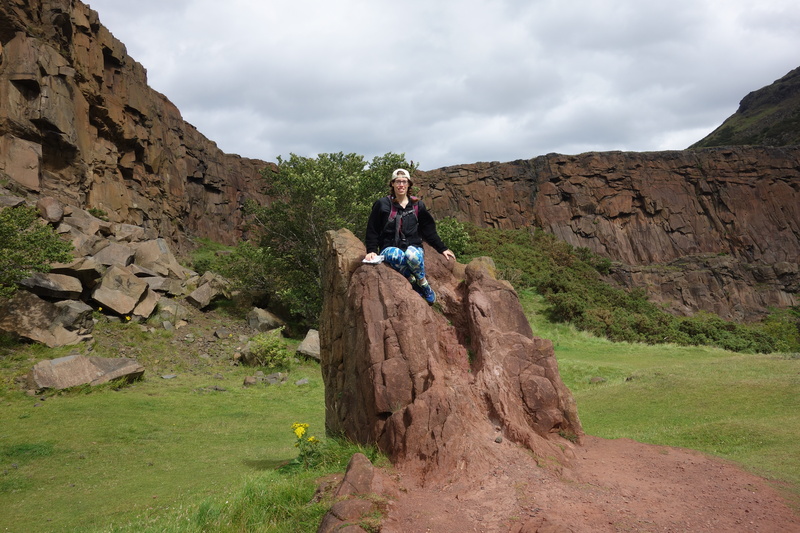 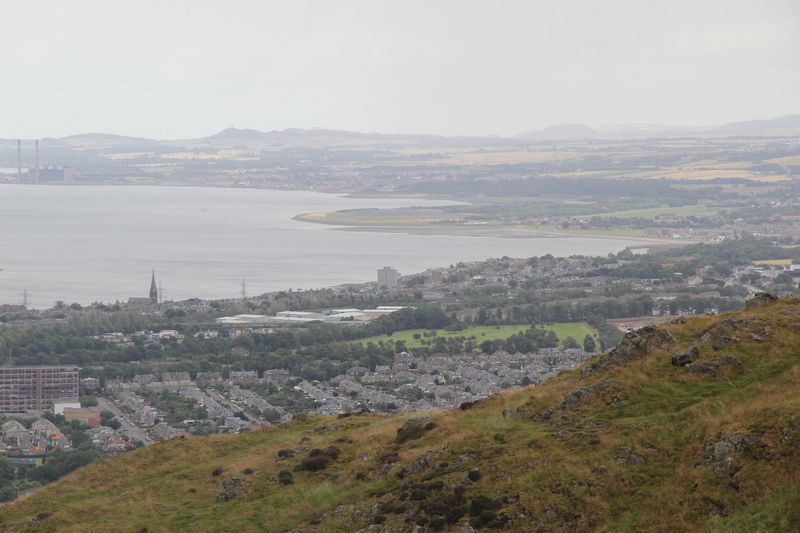 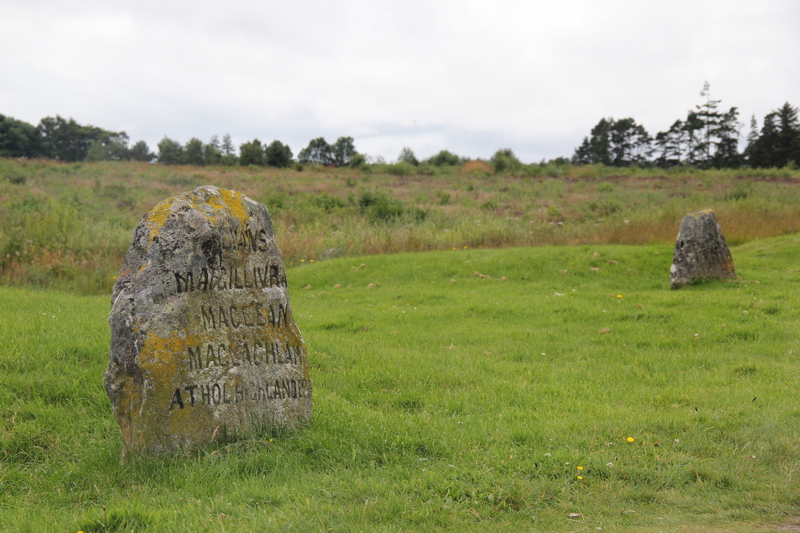 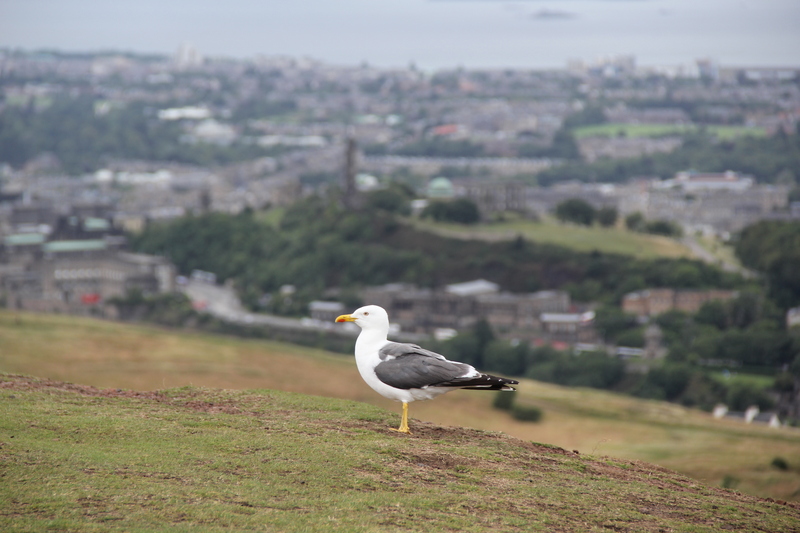 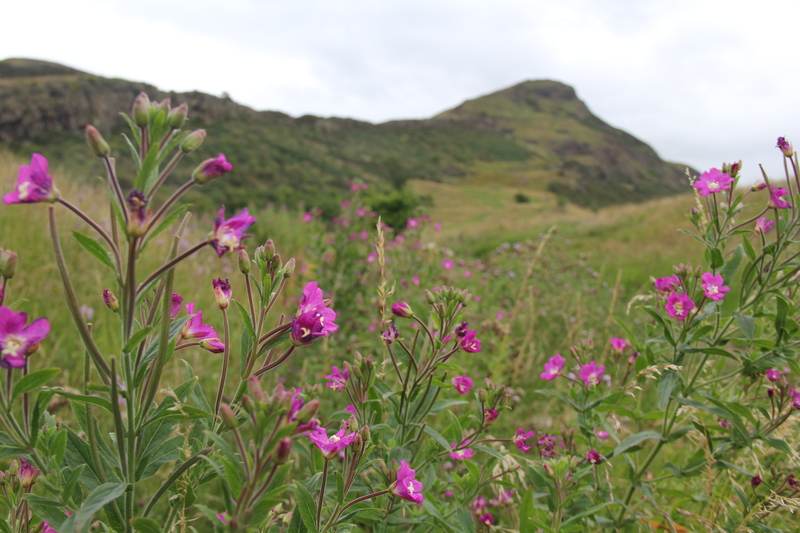 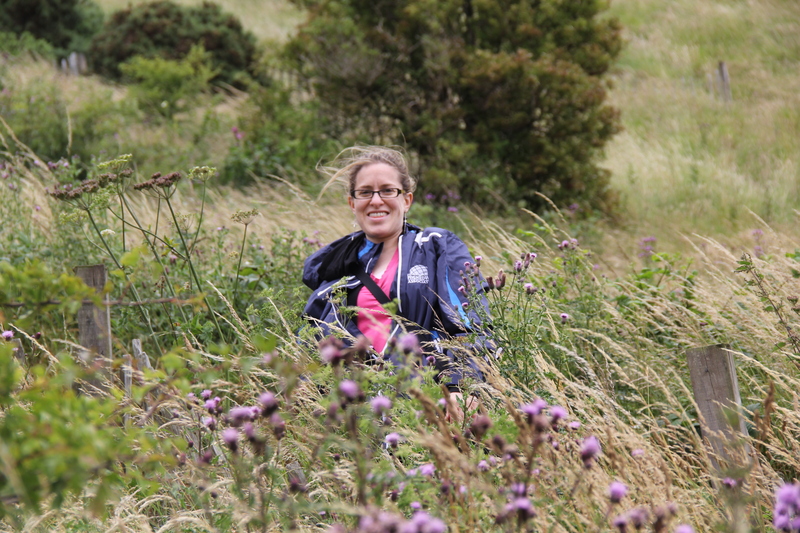 Our version of the hike to Arthur’s Seat was certainly longer and probably more difficult than the correct path up, but we enjoyed the exercise and the fresh air – not to mention the views. 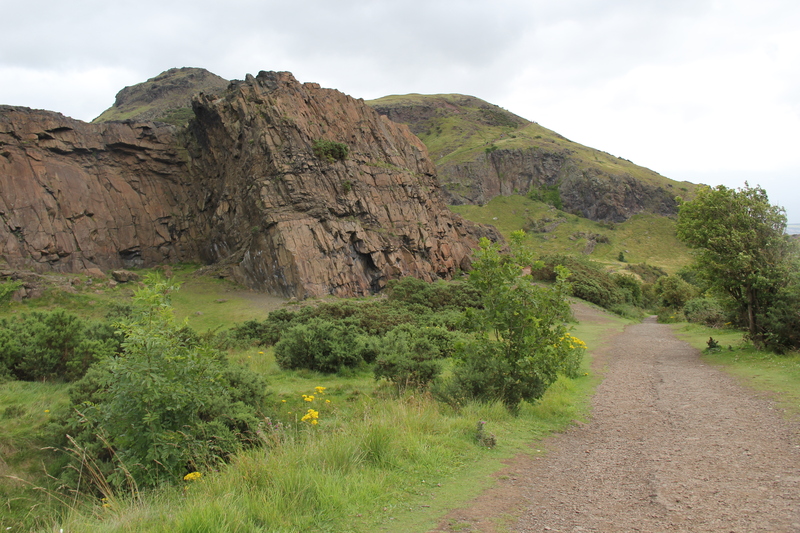 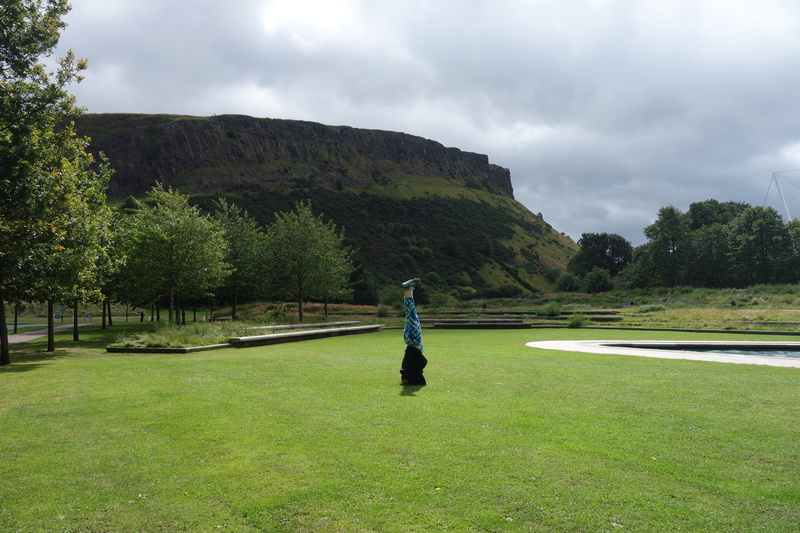 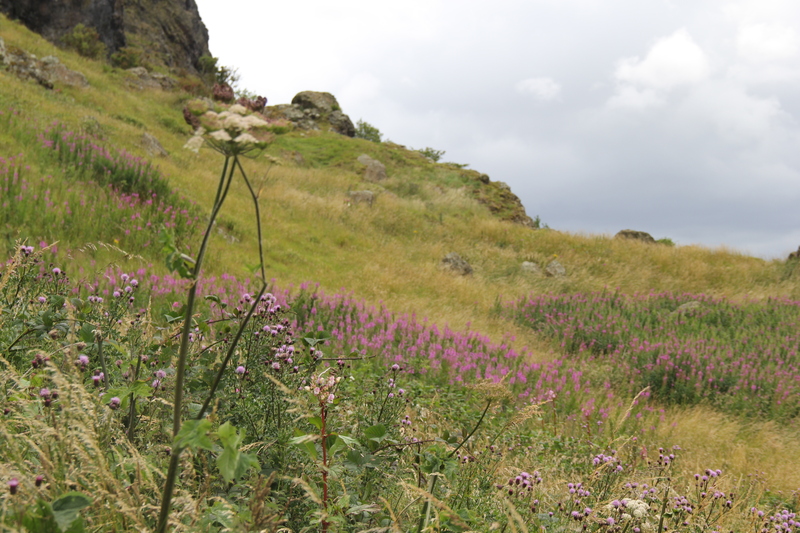 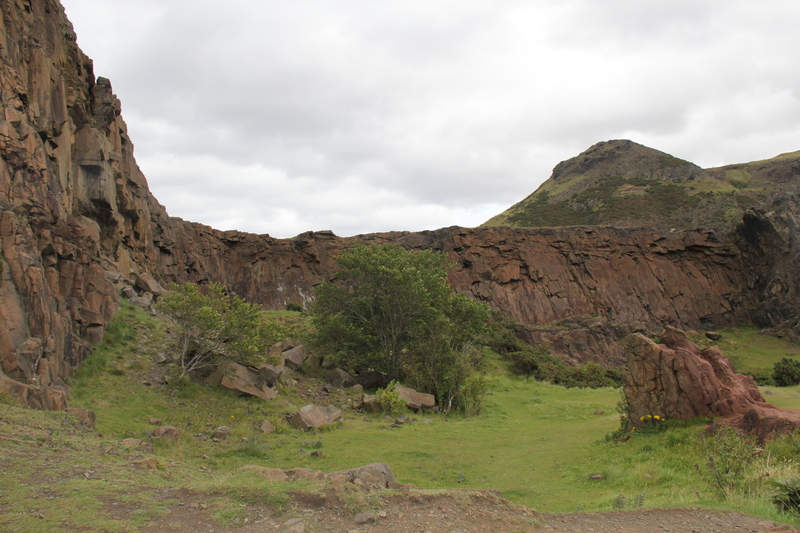 We took the Radical Road past Salisbury Crags and then linked up with the path to Arthur’s Seat. 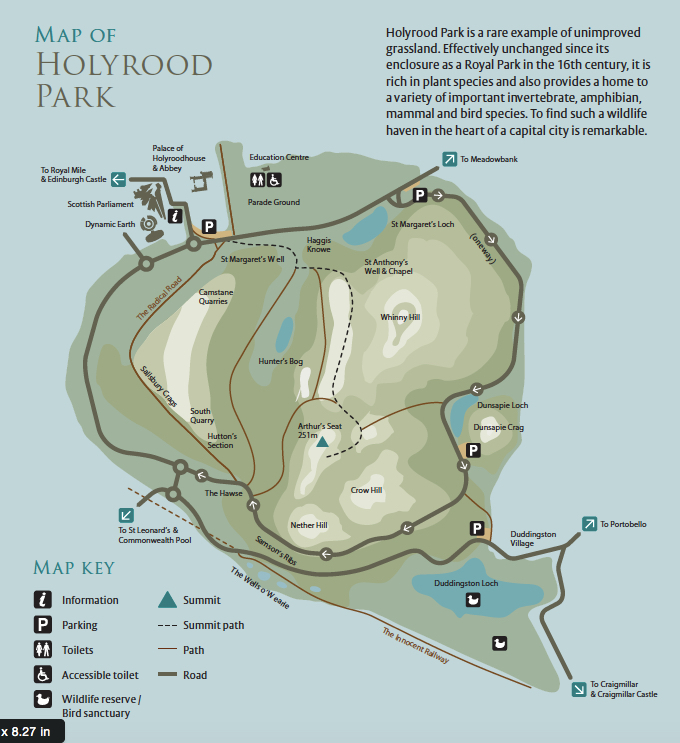 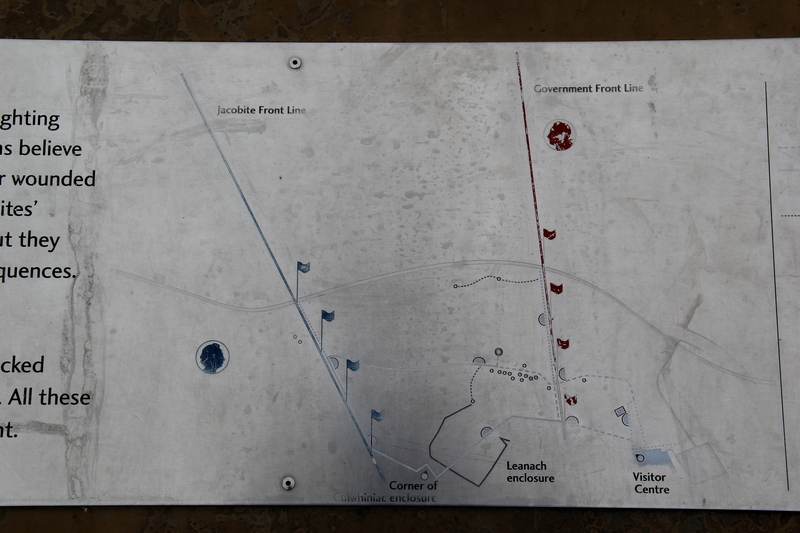 Below is a map of Holyrood Park trails – something we probably should have googled before we started.